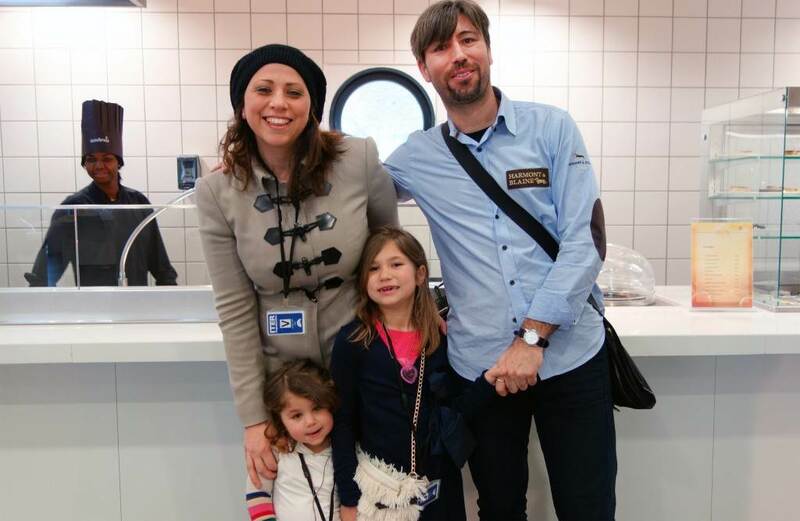 Wednesday 3 April was Family Day at ITER, which means that the sound of small voices rang out (briefly) in the corridors. Several times per year small groups of staff members (30 at a time) are invited to bring their families for lunch in the cafeteria and a tour of the site. 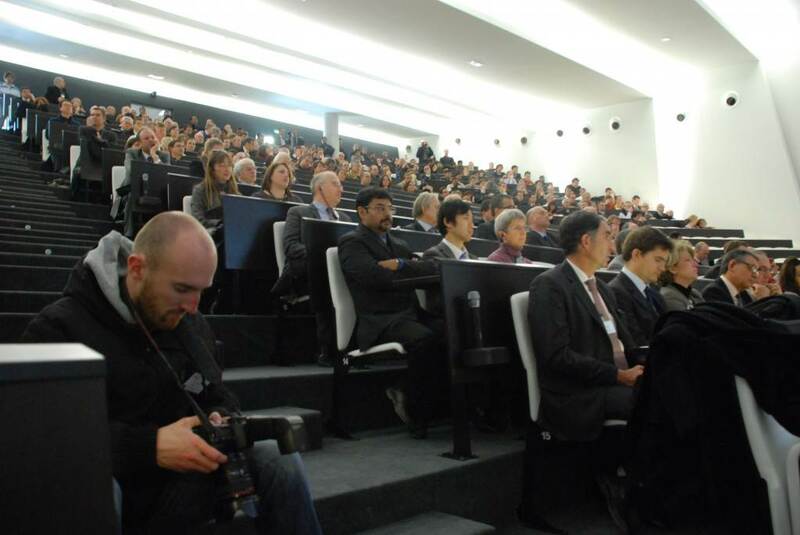 The 2019 ITER Business Forum (IBF/19) kicks off on 27 March with 1,165 registered participants from 449 companies (and 25 countries). 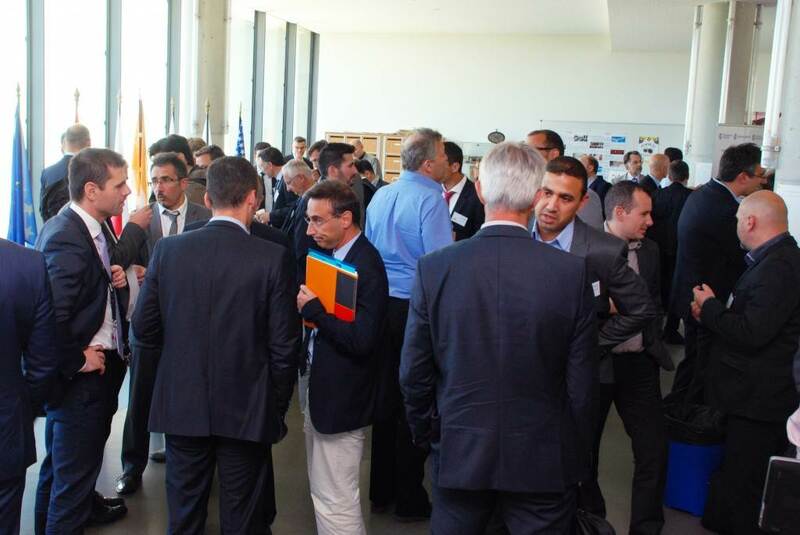 Through two days of thematic workshops, technical tours and 1-to-1 meetings, participants will have access to the latest information about ITER business opportunities. What better way to join in on the fun on 8 March—International Women's Day—than with an exhibition celebrating the contributions of women in the ITER Members to different fields of science and technology? 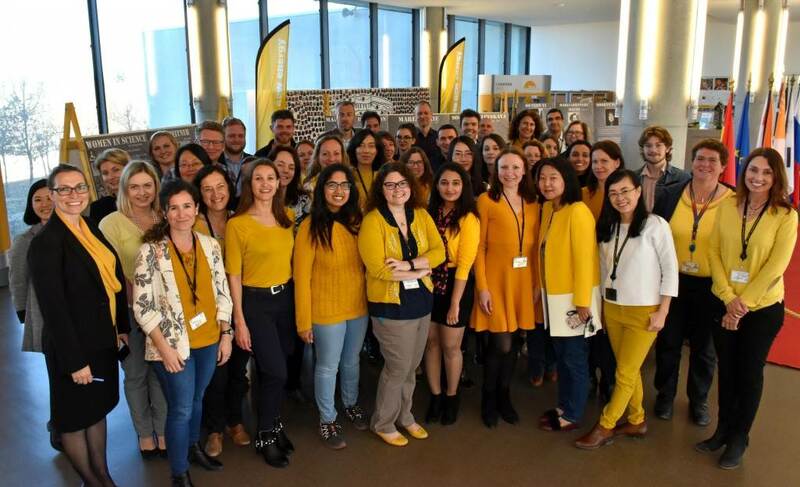 Also on offer that day at ITER Headquarters was a lecture on the theme of climate and energy by Kirsty Gogan (Co-Founder and Executive Director of Energy for Humanity) and a roundtable discussion on networking and careers facilitated by the ITER Women's Network (some members pictured in "ITER yellow"). 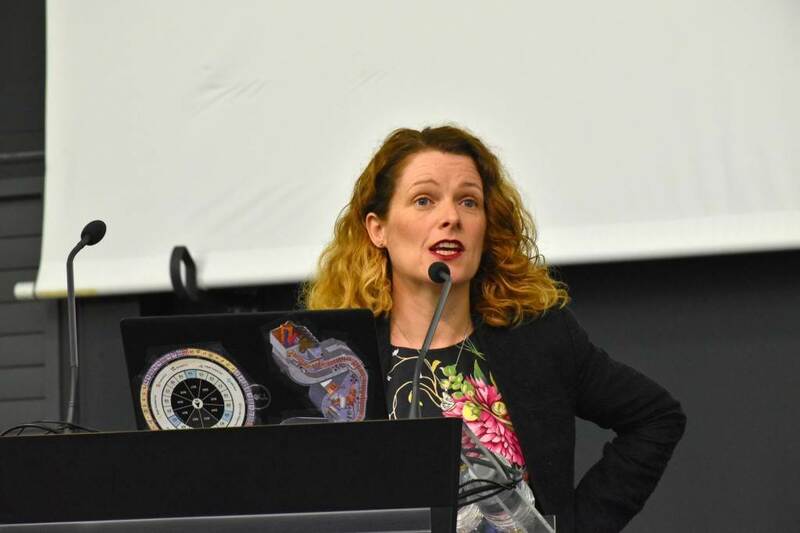 On International Women's Day, Kirsty Gogan of the NGO Energy for Humanity spoke at ITER about the need to promote all low-carbon energy technologies including nuclear to combat climate change. 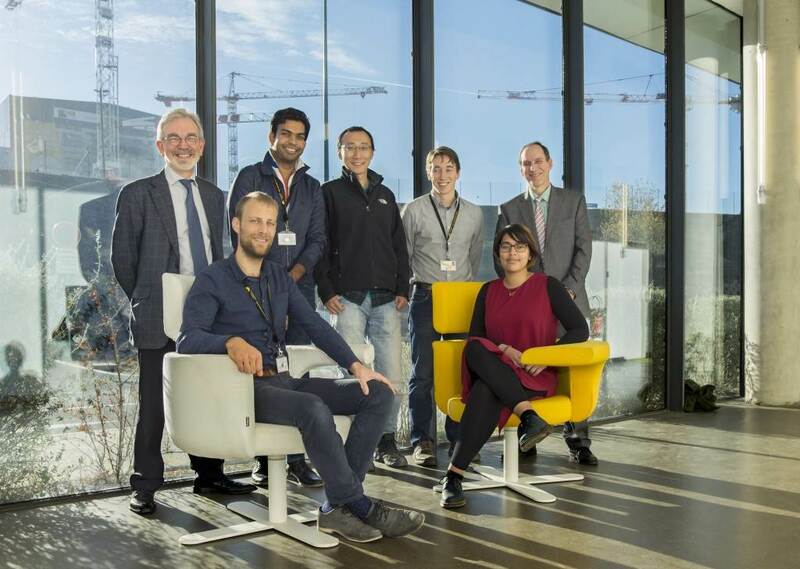 She said that "the contribution you will make with the fusion technology that you are developing here at ITER is almost unimaginably large." 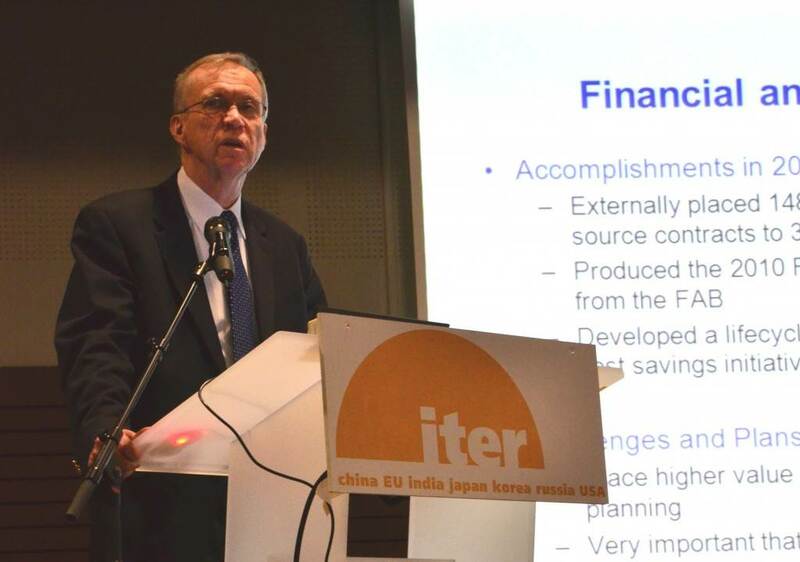 Gogan sees ITER's unique model of international cooperation as a way to address global challenges such as climate change. 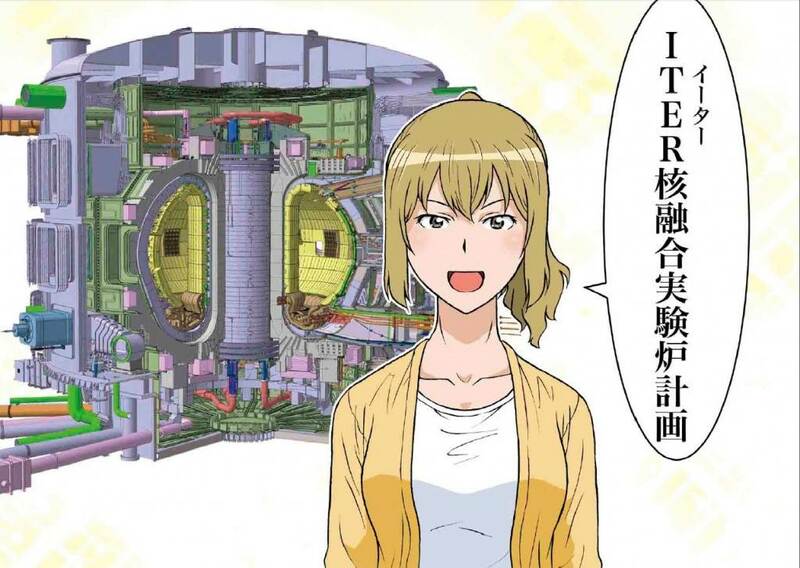 The Japanese Domestic Agency QST has produced a second manga on the ITER Project, this time featuring a Japanese intern in the Communications Office who has some ideas about how to increase public awareness about fusion and ITER. You can download it in Japanese or English from this website—http://www.fusion.qst.go.jp/ITER/comic/page1_1.html—or directly from the ITER Publications page. 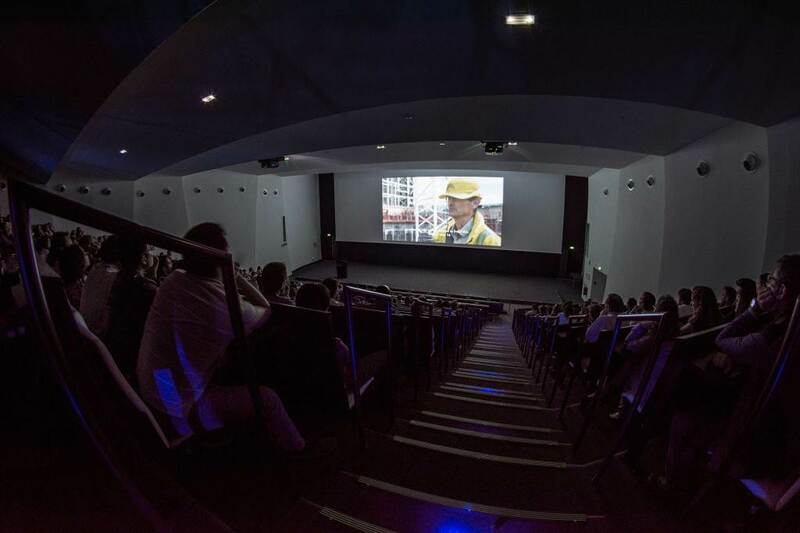 The annual meeting of the American Association for the Advancement of Science (AAAS) in Washington D.C. in February was the occasion to install ITER's walk-in cinema, premiering the latest footage from the construction site. 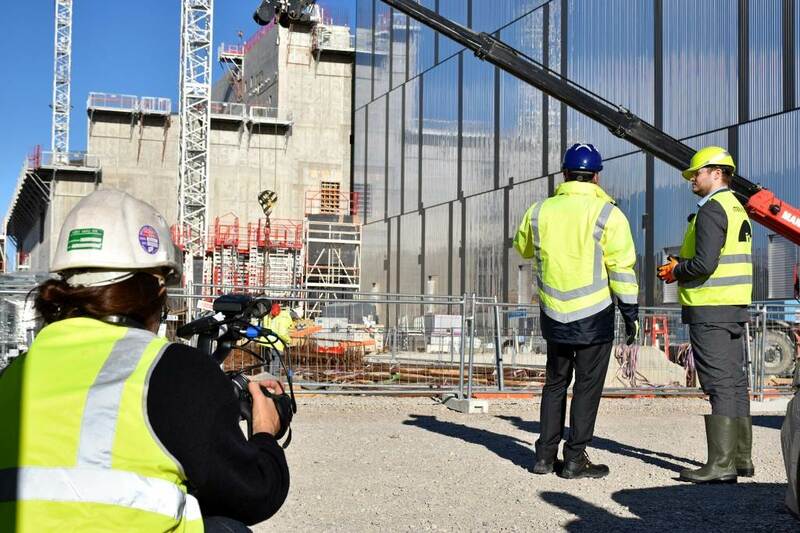 Dozens of international media teams film on site at ITER every year. This group has a slightly different project—preparing a human resources video in Russian to attract the best candidates to ITER positions. Seen twice this month at Headquarters—the 11-piece ITER band, playing holiday favourites for the enjoyment of staff and visitors alike. Rumour has it that they will be making more regular appearances in the New Year. We hope so! 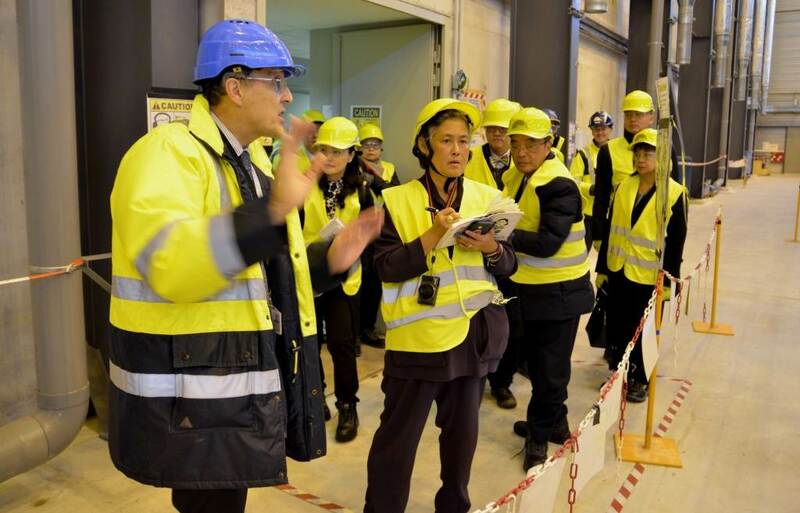 The ITER Director-General leads a site tour for delegates to the 23rd ITER Council in November. 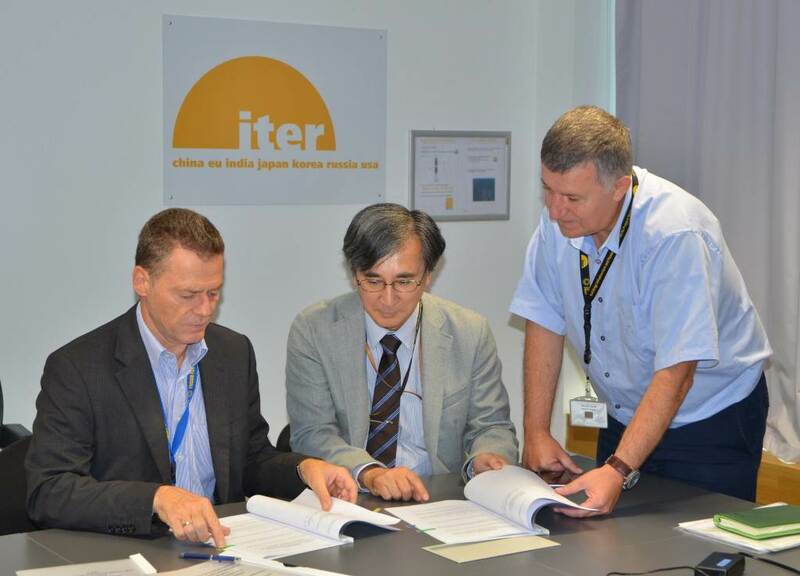 At least twice a year, ITER Council meetings reunite senior representatives from each ITER Member to review the overall direction of the project. "Fusion powers stars in heaven—and we do it here on Earth," sang the Fusion Choir to the tune of Beethoven's "Ode to Joy." 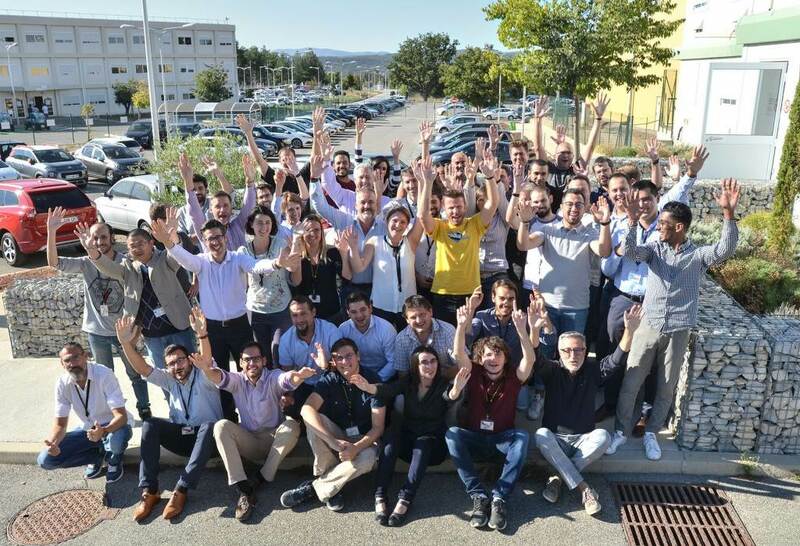 It was one of the last highlights of the FuseNet PhD event, which took place at ITER Headquarters from 7 to 9 November. 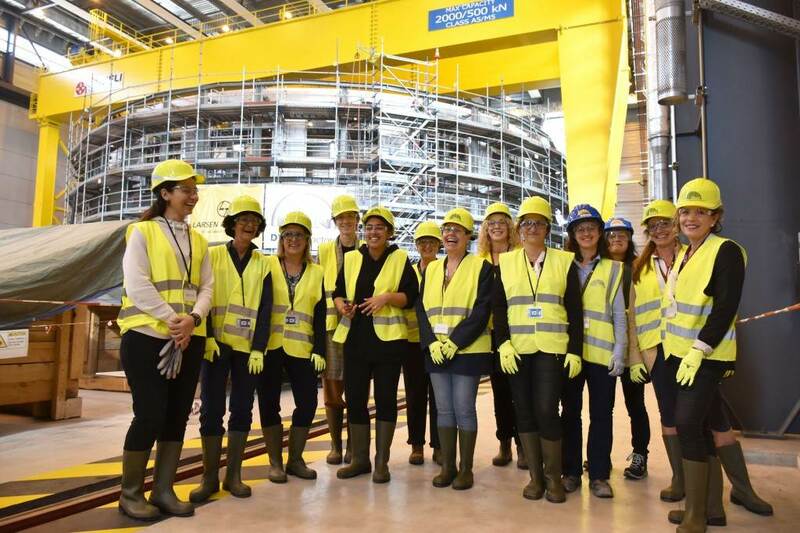 Members of the non-profit professional organization Women in Nuclear Global visit in October for a tour and the opportunity to meet with ITER scientists and engineers. The growing network boasts some 35,000 members in 109 countries. 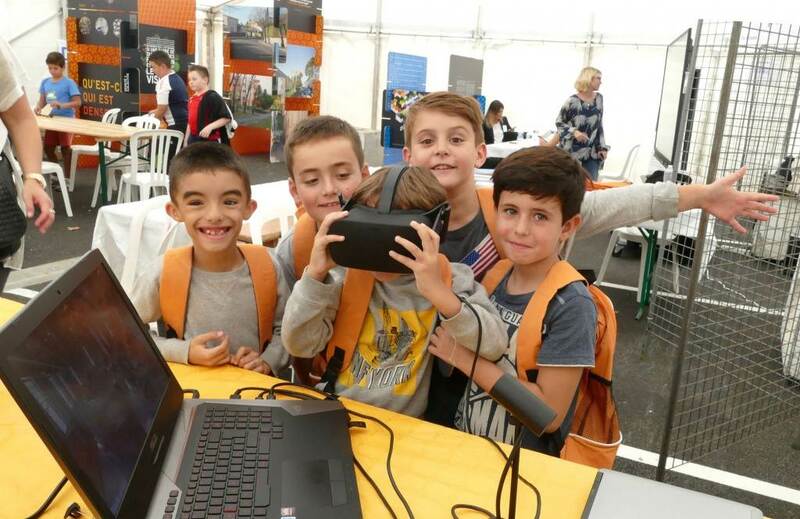 At a local science fair in October, the younger crowd (all equipped with their ITER backpacks) is especially appreciative of ITER's virtual reality experience. 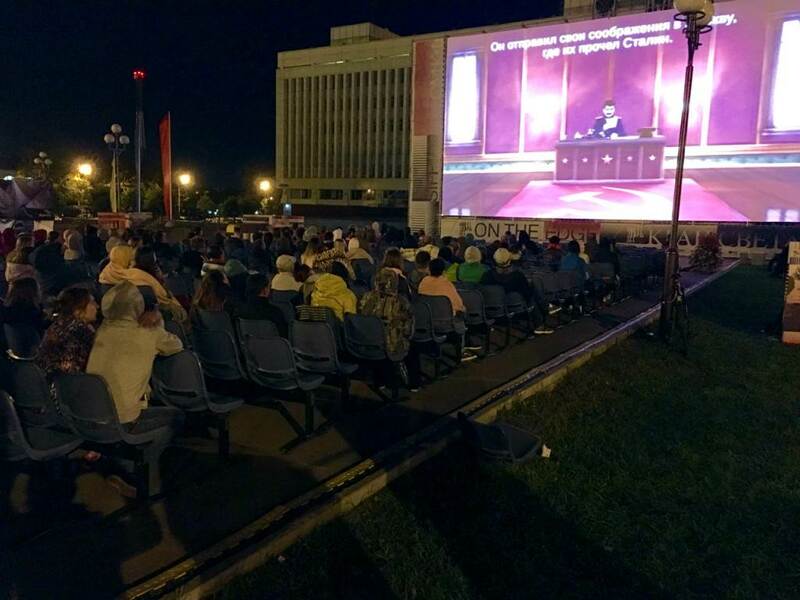 A two-day media event held at Headquarters in early October results in reports on major outlets such as Sky News, Al Jazeera, AFP, the Indo Asian News Service, Chosun Biz, RAI News 24, and the Xinhua News Agency. Articles, conferences, videos, visits? 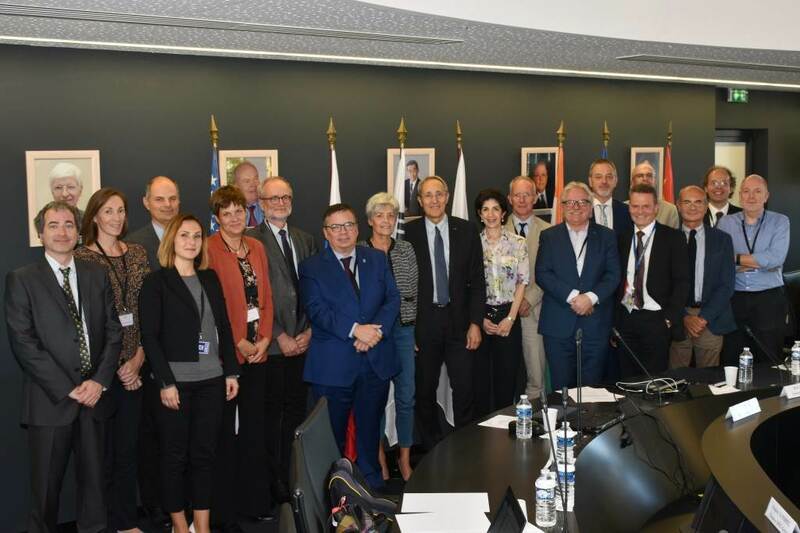 At ITER Headquarters once a year, communicators from all Domestic Agencies plus the ITER Organization meet to discuss how best to keep stakeholders and members of the public informed about ITER. 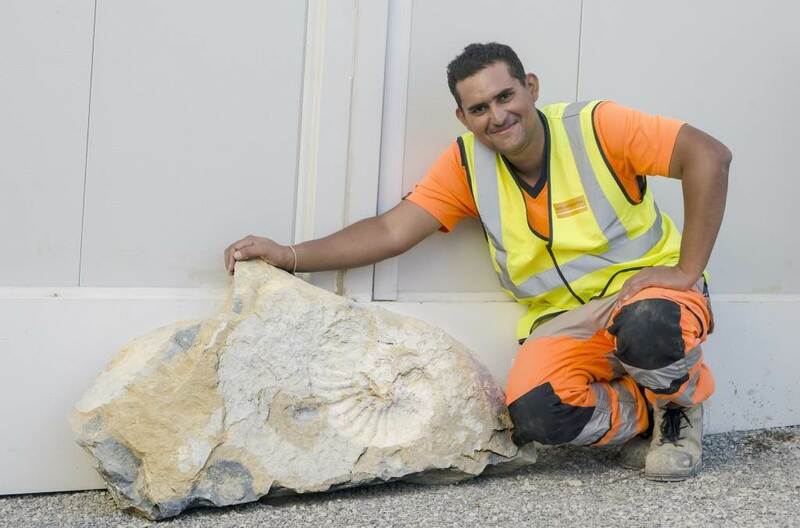 Foreman Christopher Lebreton spotted one rock with a difference among the many excavated recently in underground gallery works—the circular imprint of a prehistoric ammonite. The limestone strata where the fossil was found can be dated back 120-200 million years. 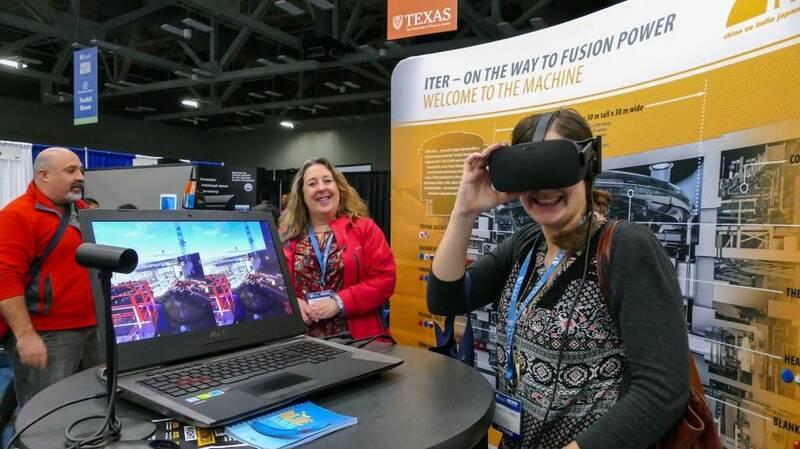 The ITER Organization's new cinematic booth—featuring curved screens with ITER construction and manufacturing videos playing in repeat mode—is a hit in September at the International Atomic Energy Agency (IAEA) General Conference. 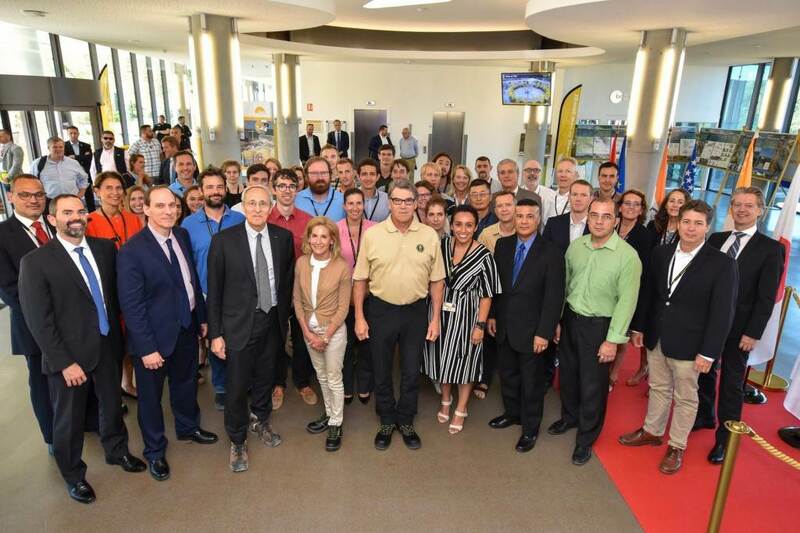 US staff members meet in July with Secretary of Energy Rick Perry and US Ambassador to France and Monaco Jamie McCourt. In addition to this brief exchange, the delegation sat down with management and took part in an extensive walking tour of the worksite. 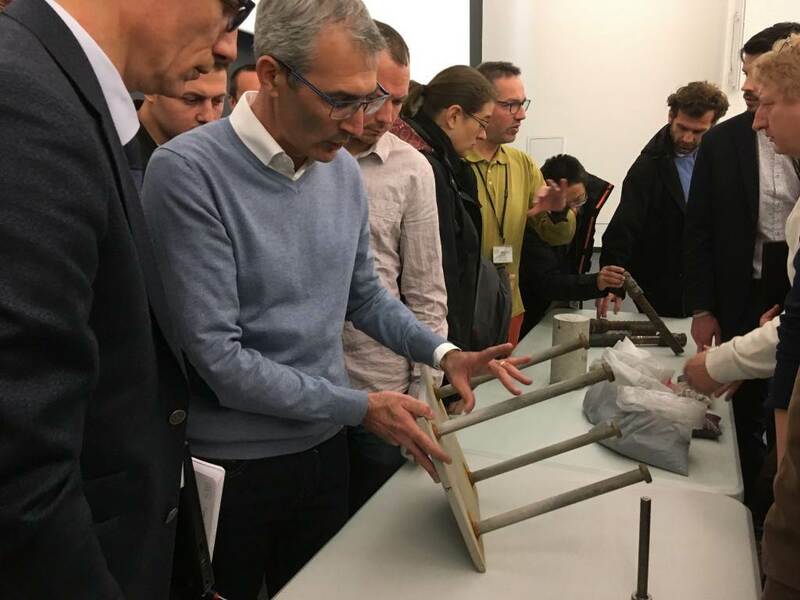 As part of the Intercultural Program run by Agence Iter France, ITER staff members and their spouses have the opportunity to study the language of project host, France. Now ten years old, the program has been awarded the European Language Label for quality and innovation in teaching. 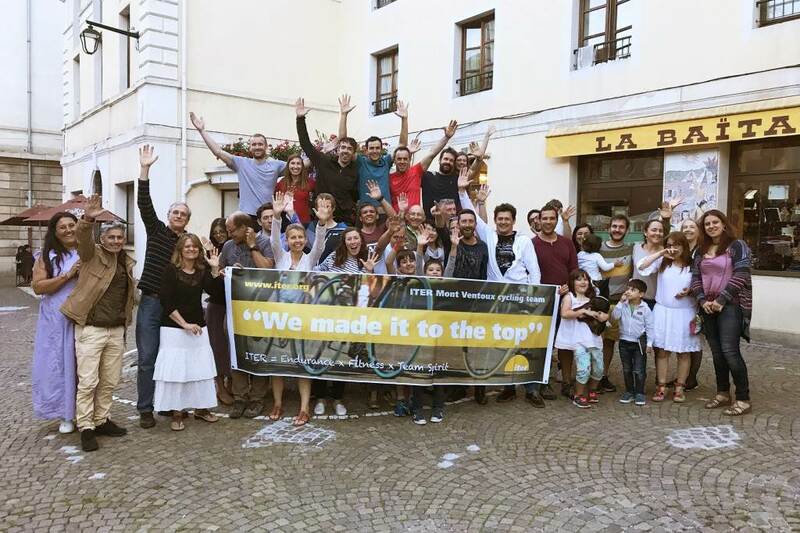 In July, a ceremony is held at ITER Headquarters to recognize all certificate earners. One can see the village of St. Julien le Montagnier from ITER; it is only a few kilometres away. But, little was known at ITER about the villagers' ingenuity and creativity in dealing with the local water scarcity. 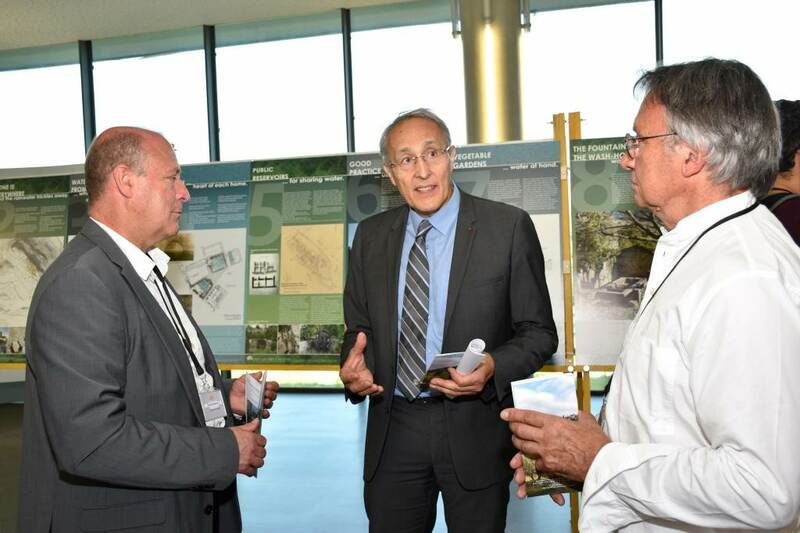 Mayor Emmanuel Hugou (left) and ITER Director-General Bernard Bigot opened an exhibition detailing the history of the village's water management challenges and solutions. The exhibit was developed under the lead of Alain Amedeo (right), president of the Association of the Old Village of St. Julien le Montagnier. Arun Srivastava, from India (second from right), presides over his first Council as Chair on 20-21 June 2018 (IC-22). The Chairmanship of the Council rotates between the ITER Members. 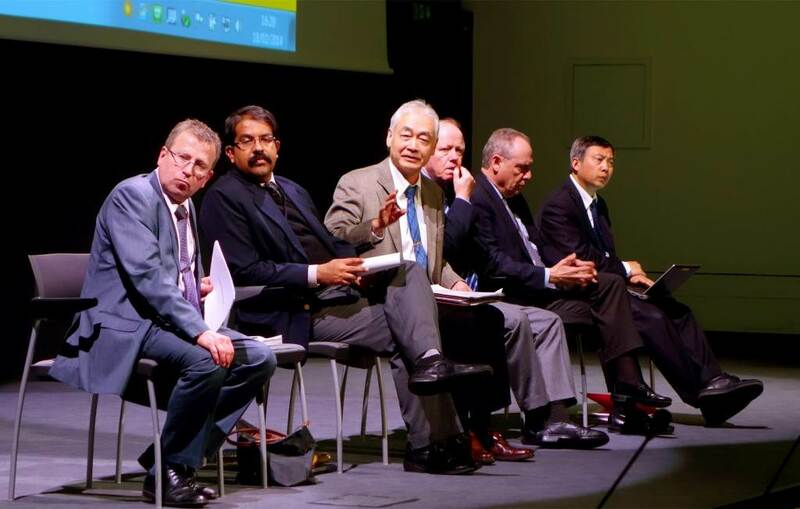 Looking back, it has been presided by: Sir Chris Llewellyn Smith, Europe (IC-1 to IC-5); Evgeny Velikhov, Russia (IC-6 to IC-9); Hideyuki Takatsu, Japan (IC-10 to IC-13); Robert Iotti, United States (IC-14 to IC-17); Won Namkung, Korea (IC-18 to IC-21). 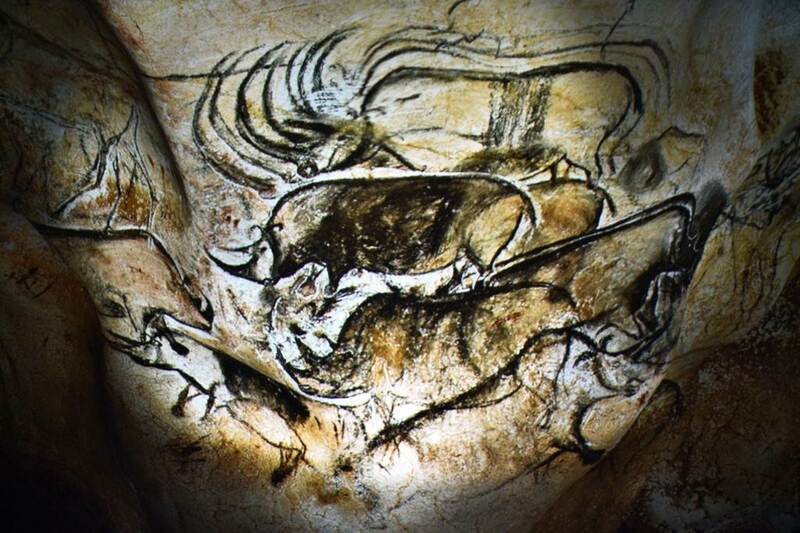 In June, science journalist Pedro Lima introduces ITER staff to the prehistoric paintings of the Chauvet Cave in southern France as mammoths, wolly rhinoceroses, bears and horses drawn in astounding artistic perfection come to life on the screen. He draws parallels between the cave art and ITER—for him both represent the apex of human imagination, ingenuity and technology advancement at a given point in civilization. 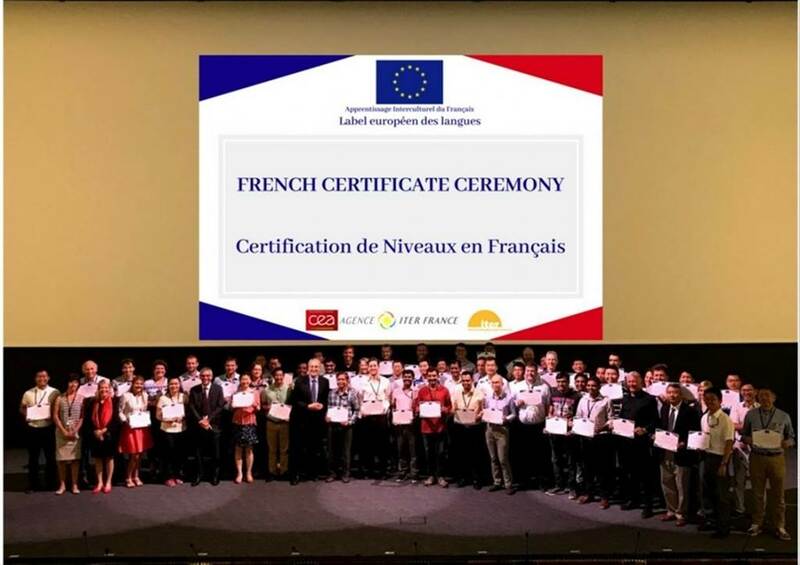 More than 500 jobs were on offer on 14 June, as companies involved with ITER construction and assembly advertised for foremen, engineers, security specialists, welders, boilermakers, pipe-fitters, mechanics, shift supervisors, draftsmen and women, maintenance technicians and more. They may seem like toys. 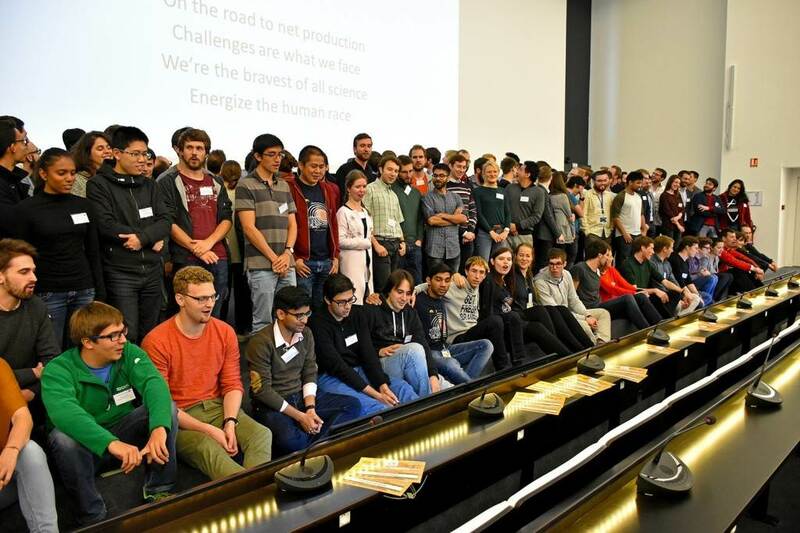 But the robots created by the 600 middle and high school students competing in 64 teams were created to solve real problems: overcoming remote handling challenges resembling those at ITER. 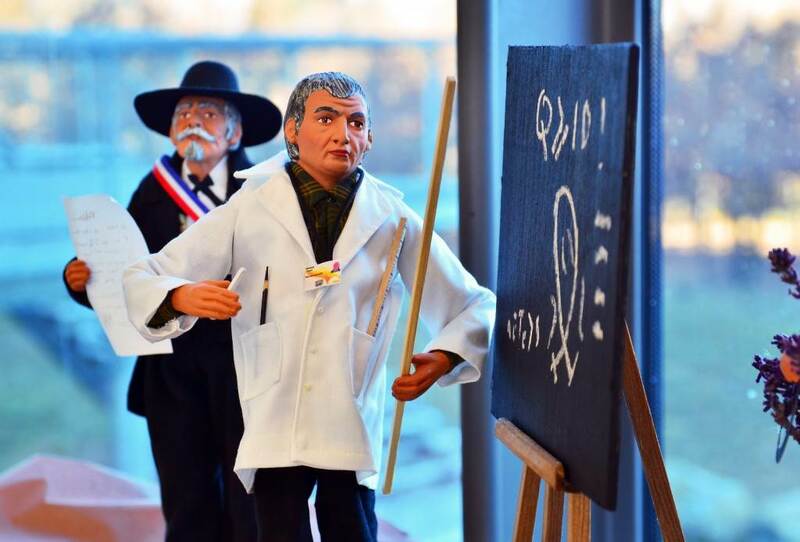 Already in its 7th year, the ITER Robots competition, organized by Agence Iter France and the ITER Organization, allows for a playful approach to teaching about the future of energy, creative engineering and teamwork. 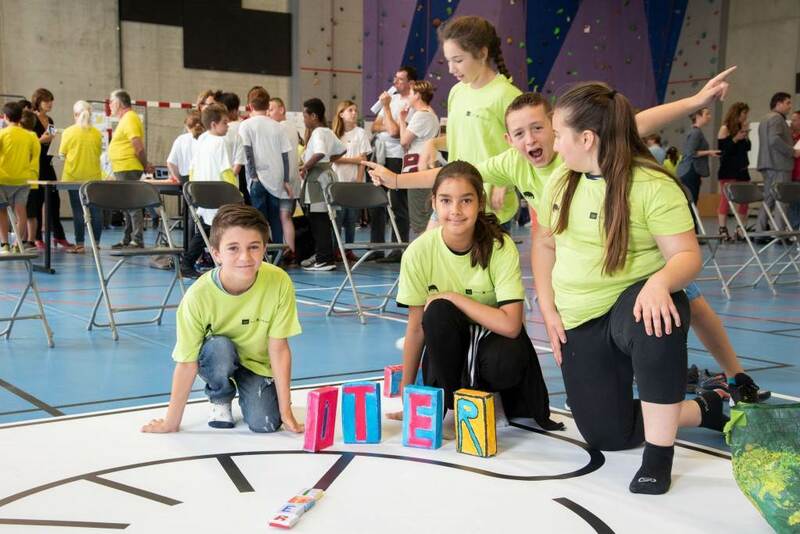 For the first time this year, the successful concept was introduced to primary schools in the region as ITER Robots Junior (photo). 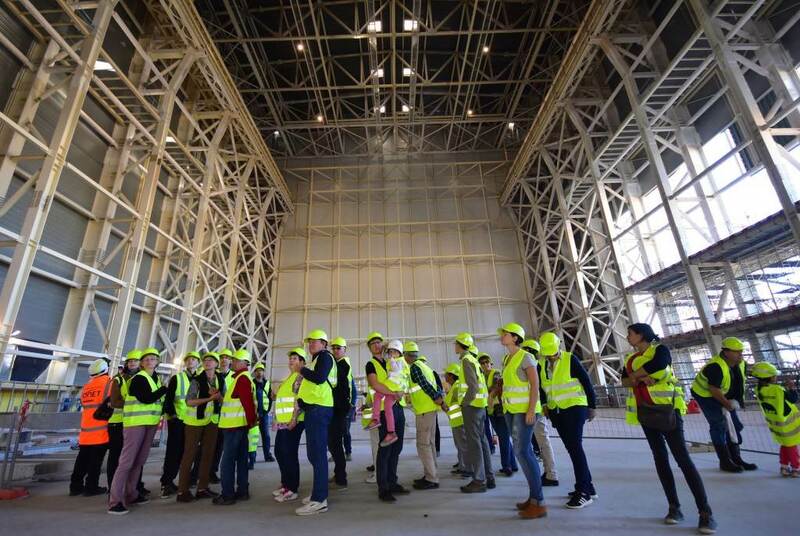 For the 700 visitors on ITER's 12th Open Doors Day in May 2018 the trip down into the Tokamak Pit was the absolute highlight. They also saw the new Visitors Centre and the first giant assembly tool in the Assembly Hall. 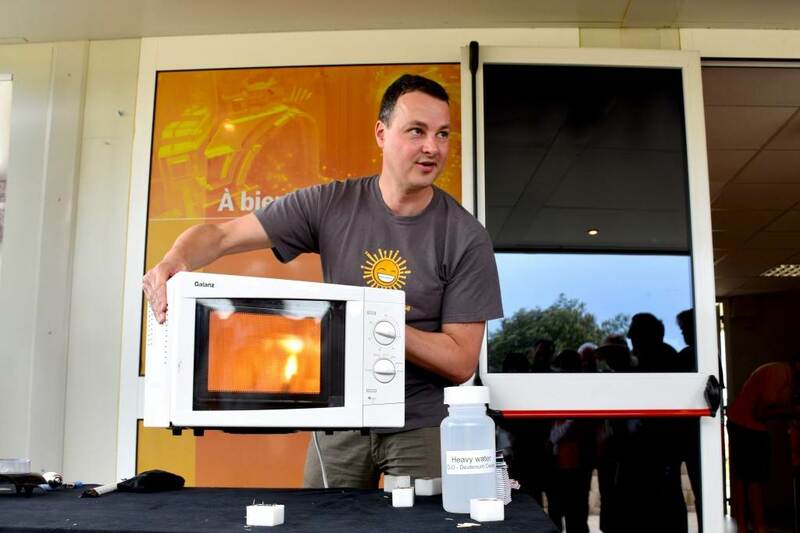 It took Gieljan de Vries just a regular microwave oven to create a plasma. 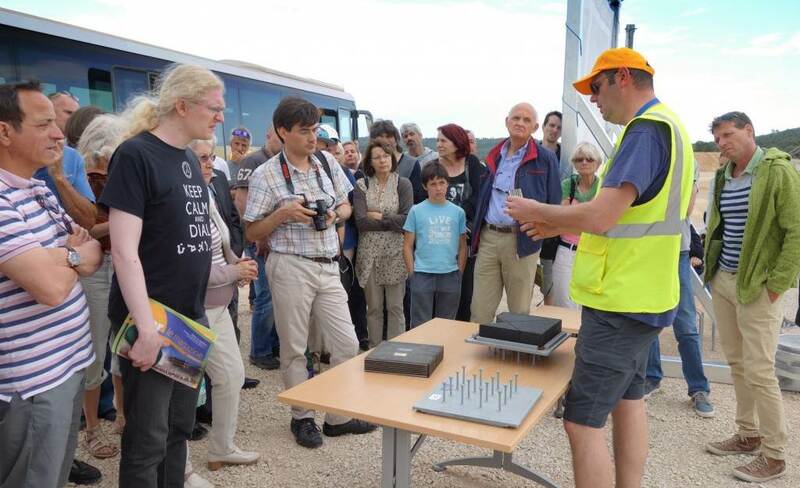 De Vries, from the Dutch Institute for Fundamental Energy Research (DIFFER), brought the Fusion Road Show to ITER's Open Doors Day to explain plasmas, magnetic confinement and fusion—a perfect crash course for visitors ahead of the ITER site tour. In the first manga about the world's largest fusion project, art lover Taiyô Tenno meets scientist Soléane in the south of France and learns about fusion and ITER. 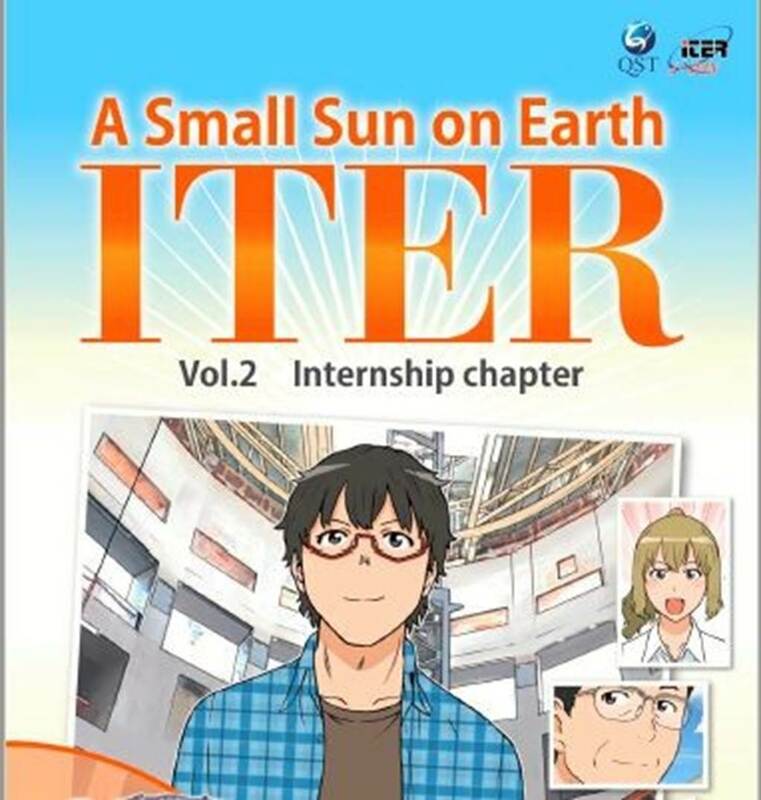 The manga, titled "A small sun on Earth" and produced by the Japanese Domestic Agency, can be downloaded at this address in Japanese, French and English: http://www.fusion.qst.go.jp/ITER/comic/page1_1.html. 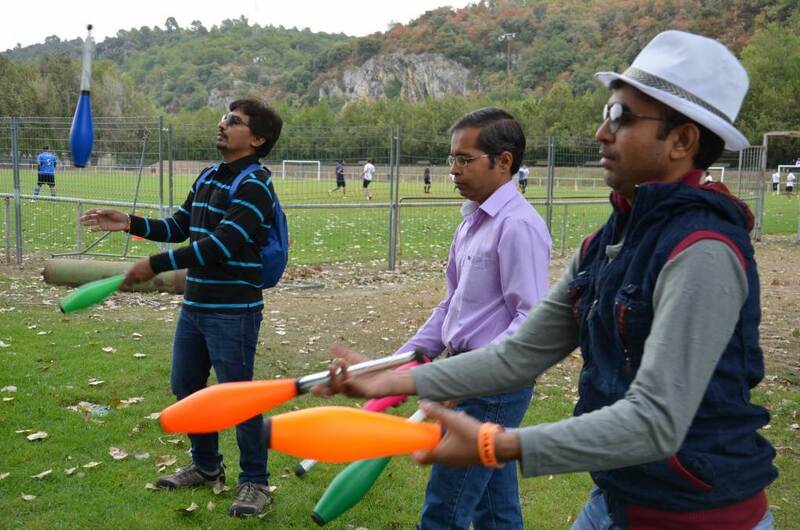 After an in-house lecture on nuclear buildings, ITER staff enjoyed some hands-on experience. Seismic pads, embedded plates, rebar segments and different kinds of concrete aggregates were available for close inspection. 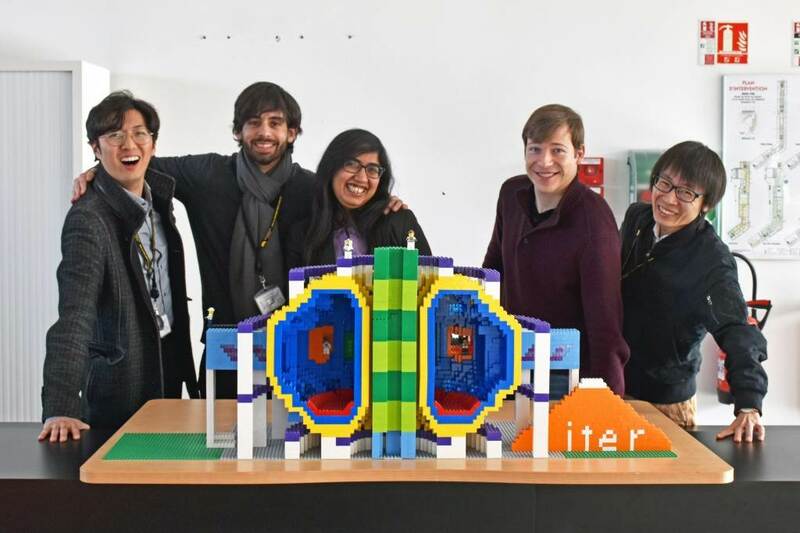 Fifty students from the Politecnico di Milano University spend a day at ITER in March. All are studying for their Master's in nuclear engineering. 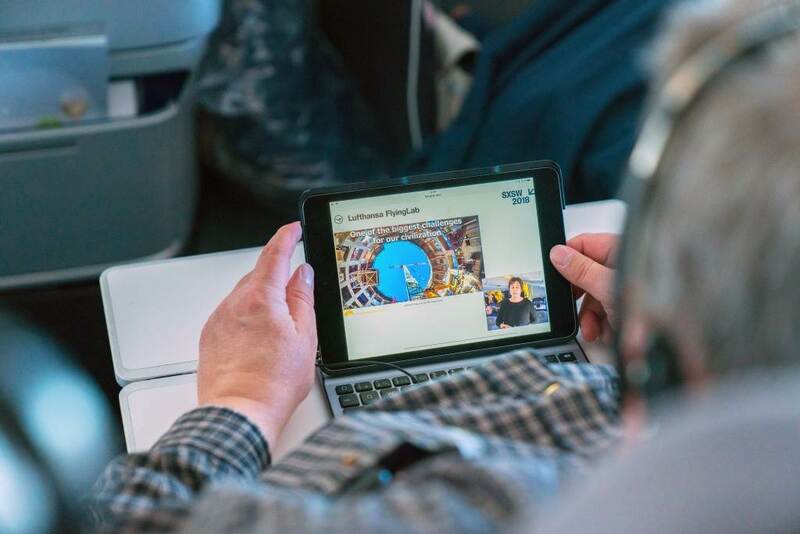 On an 11-hour transatlantic flight between Frankfurt and Houston passengers were introduced to the ITER Project by Communications representative Sabina Griffith. 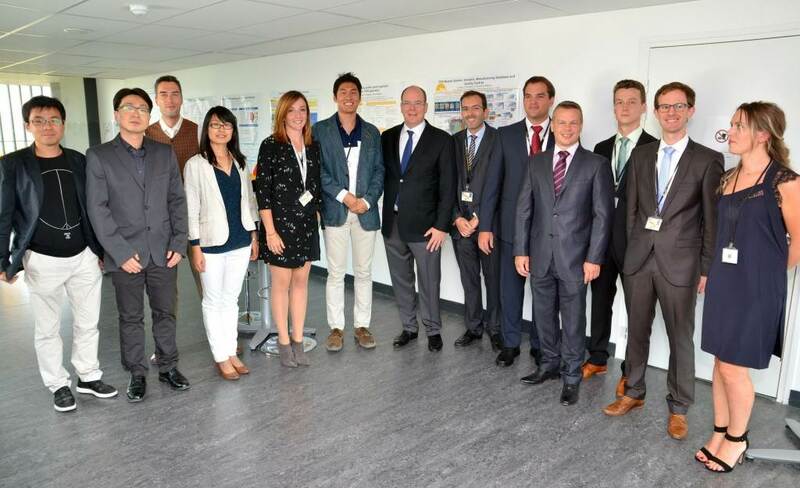 ITER was one of several projects presented as part of a Lufthansa FlyingLab on digitalization and high technology. Camylle Jordan only spent a week at ITER, but in that time she was able to test the proposed curriculum for the "junior" segment of the next ITER Robots competition and learn the basics of SolidWorks ®, a Computer Assisted Design tool. ITER Robots is an annual school contest in which students imagine, design and program small robots to perform ITER-like maintenance activities. 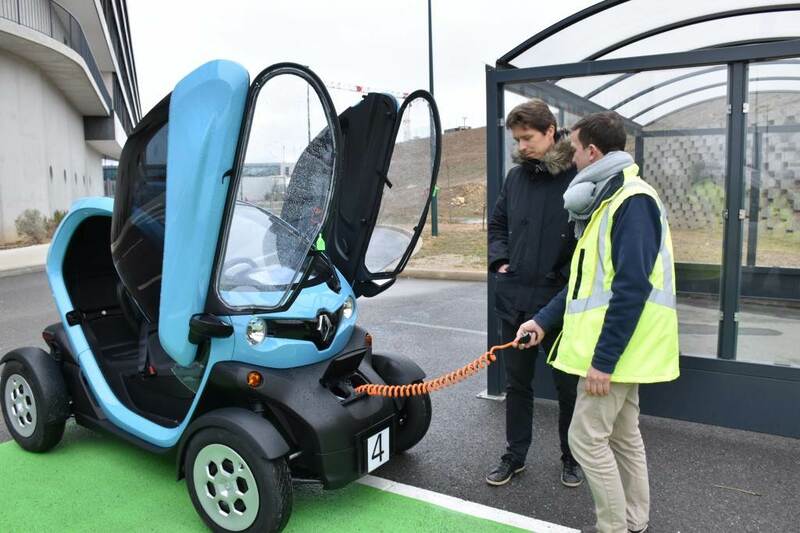 A new way to get around ITER: by Twizy! Four of these small electric cars produced by Renault have been made available to employees for travel between office buildings. 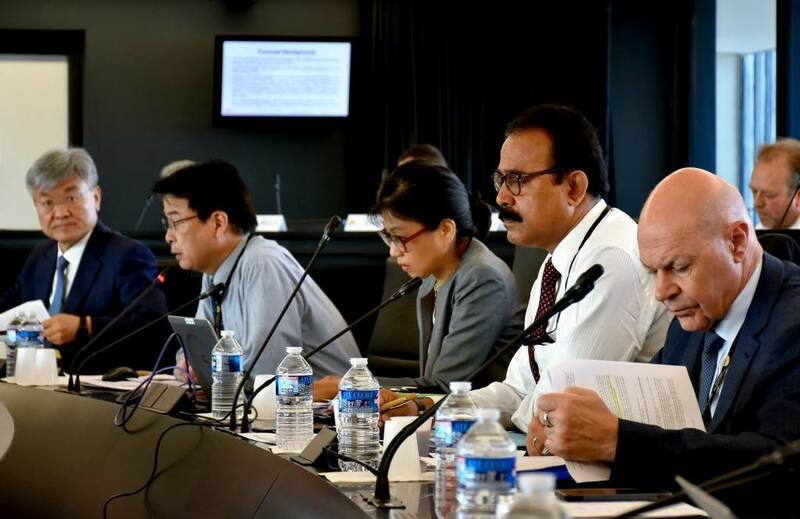 The very week the ITER Organization announces that it has completed 50 percent of the total work scope to First Plasma, Director-General Bernard Bigot was in Washington D.C. for a series of high-level meetings. 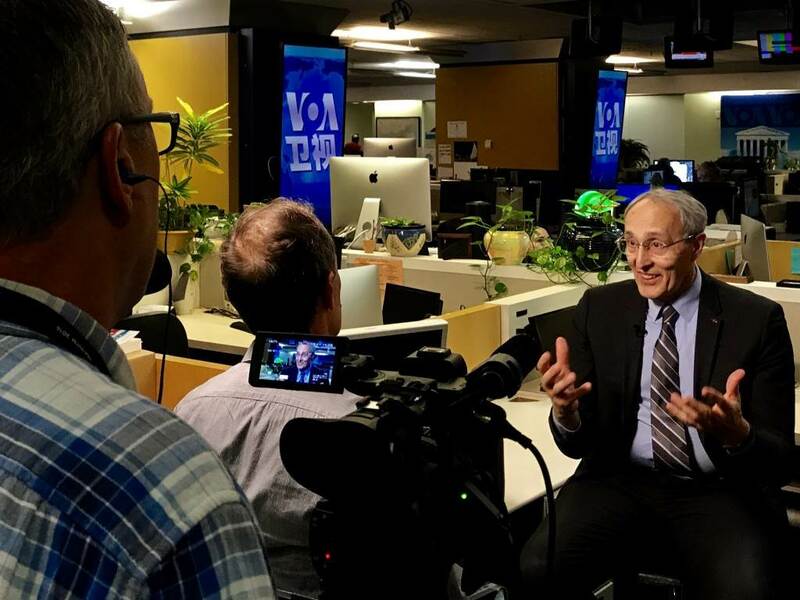 He takes time out to answer media requests; here he is seen in the studios of "Voice of America." 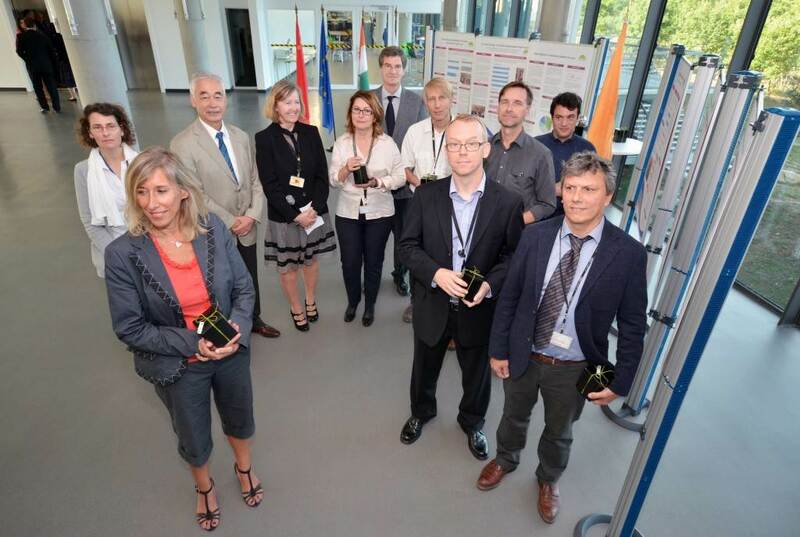 On 30 November, a celebration is held at the European Domestic Agency in Barcelona, Spain, to pay tribute to the work of staff, the collaboration of European companies and laboratories, and European stakeholders over the past 10 years in support of the ITER Project. The European Union (through Euratom) is responsible for 45.6 percent of the costs of ITER construction. 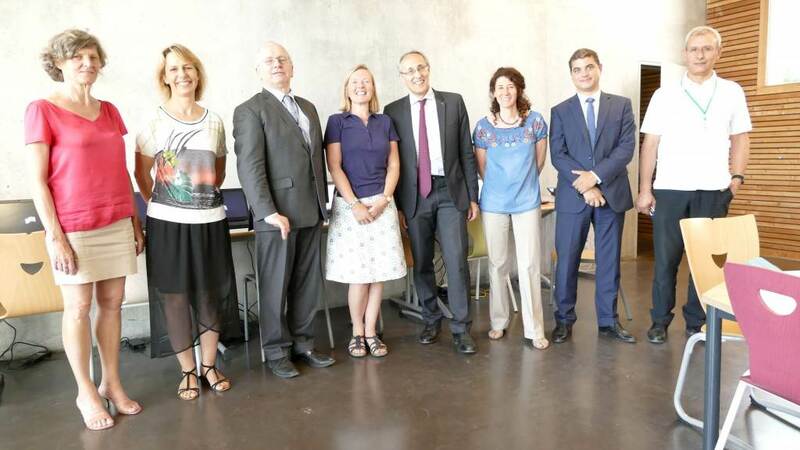 Through a partnership signed with the ITER Organization, the Principality of Monaco provides the funding for five Postdoctoral Fellowships every two years. A new campaign will be launched late 2017 for two-year positions starting in 2018 (applicants from the ITER Members or the Principality of Monaco only). 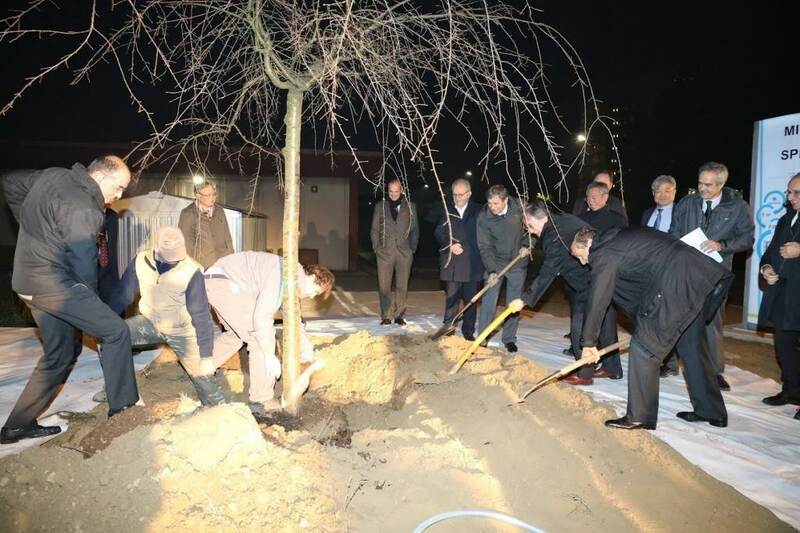 To celebrate the completion of component deliveries from Japan to the ITER neutral beam test facility in Padua, Italy, a Japanese cherry is planted on the site of Consorzio RFX (host to the facility) in November. 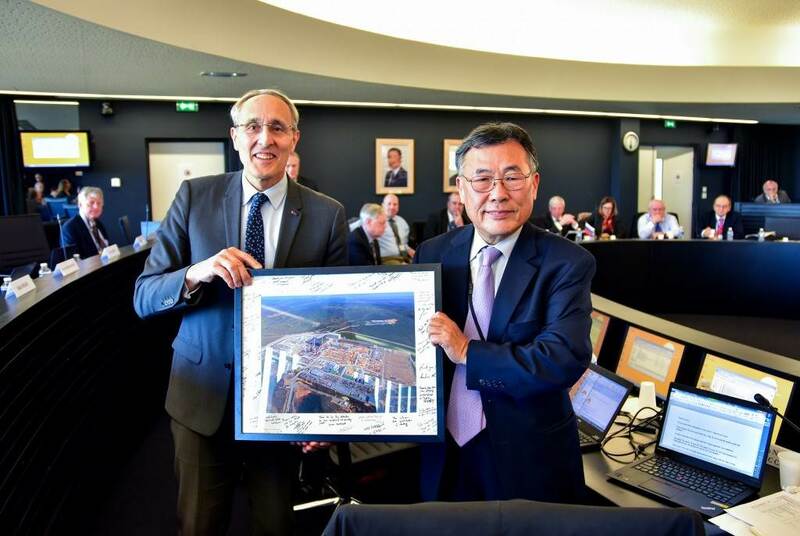 In the margins of the November ITER Council meeting, Won Namkung is thanked for the leadership and dedication shown during his two-year term as Council Chair (term ending 31 December 2017). The ITER Organization is present at the 23rd United Nations Climate Change Conference, COP23, from 6 to 17 November 2017. The stand is situated in the Bonn Zone, where scientists, industry, and organizations present their initiatives for a cleaner, greener world. 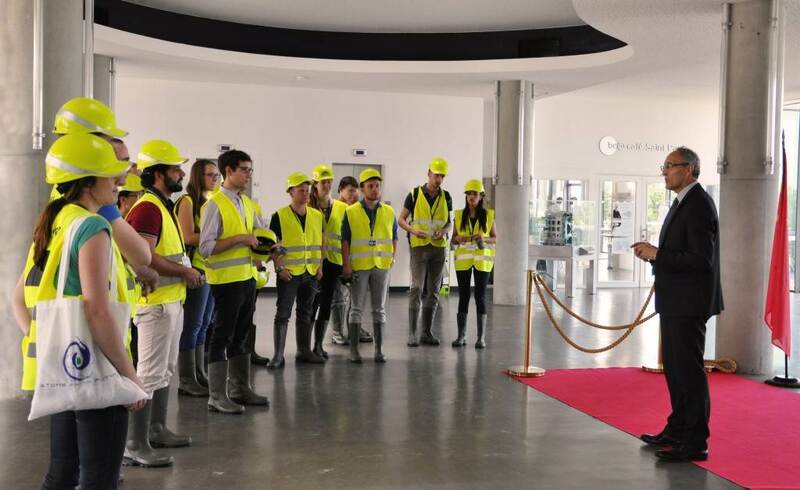 For the 11th edition of the ITER Open Doors Day, on 21 October, the ITER Organization and the European Domestic Agency teamed up to allow 750 members of the public experience ITER first hand. The highlight of the visit? 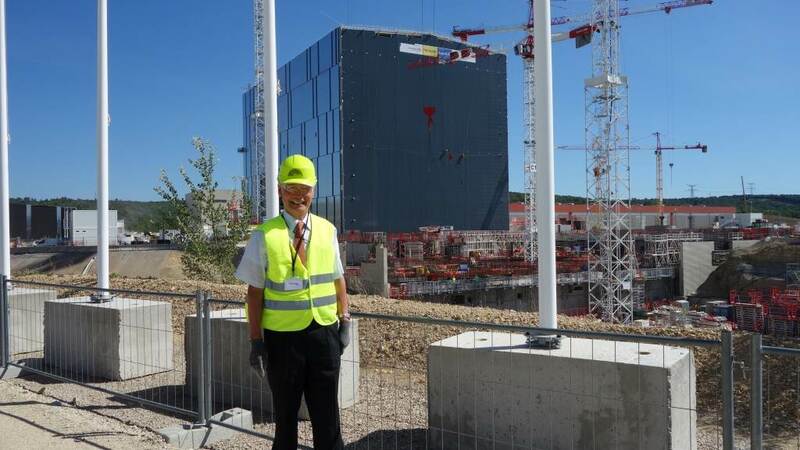 Standing where the ITER machine will turn on in 2025 (picture). 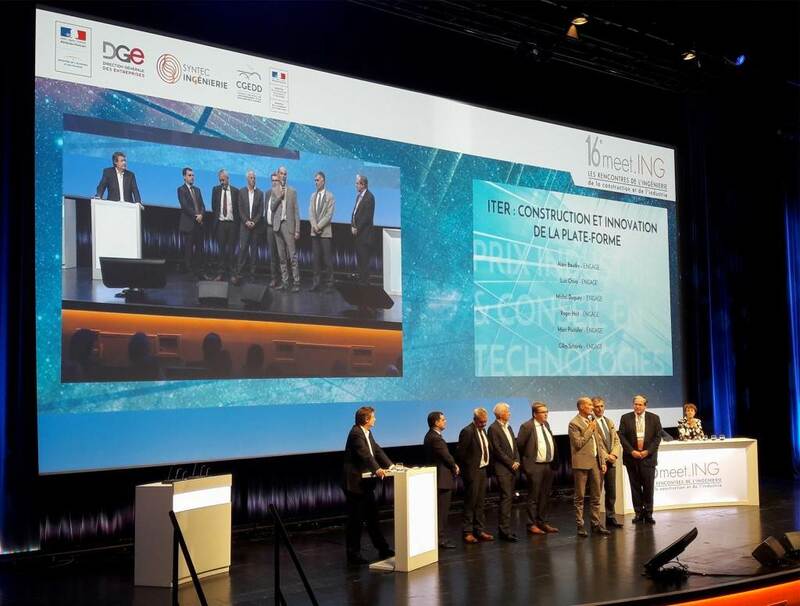 The ENGAGE consortium—selected in 2010 by the European Domestic Agency as Architect/Engineer for the elaboration and design of the ITER buildings—wins a prestigious French award for engineering. The "Grand Prix de l'Ingénierie/Prix Industrie & Conseil en Technologies" recognizes engineering projects that are remarkable in terms of scope, innovation and complexity. 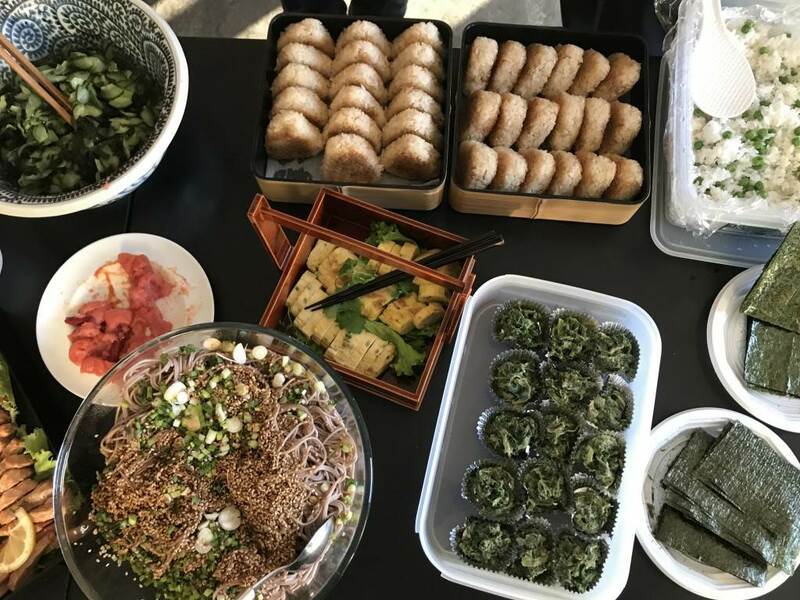 Early October, Japanese staff and contractors treated their colleagues to a typical Japanese breakfast on the fifth floor of ITER Headquarters. Cultural breakfasts like this one are organized regularly through the intercultural program run for ITER by Agence Iter France. During ITER's 2017 Media Days, journalists from China, Europe, Korea, North America and Russia had the opportunity to climb into—and photograph—the "pit" where the assembly of the ITER machine will kick off next year. After two days of site visits, interviews and lectures, the journalists had everything they needed to return home and tell the ITER story. 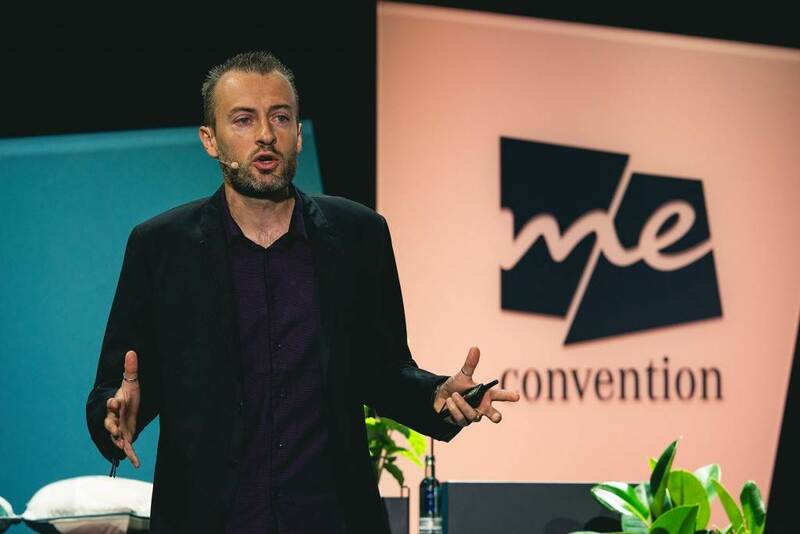 At the first edition of the "me Convention" in Frankfurt, Germany, sponsors Mercedes-Benz and SXSW (South by Southwest) invite "pioneers, thought leaders, adventurers, artists and game changers" for a critical dialogue about the future. ITER's Gregory De Temmerman, physicist in the Divertor & Plasma-Wall Interaction Section, was there to present fusion and the ITER Project. In late August, Canadian film director and producer Mila Aung-Thwin (EyeSteelFilm) brings his documentary on fusion and ITER to Sakhalin Island, Russia—the very place where the idea of a device to produce energy through magnetic confinement fusion was invented in 1950 by soldier Oleg Aleksandrovitch Lavrentiev. 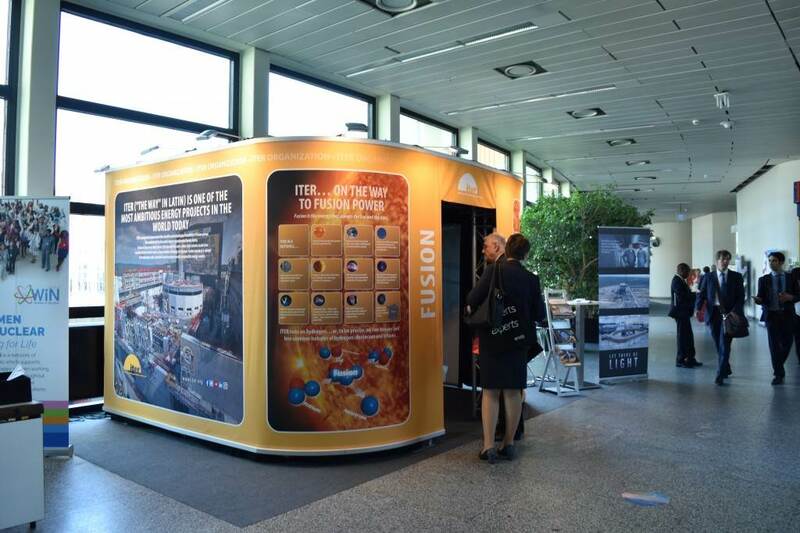 "Let There Be Light, The Hundred Year Journey to Fusion Energy" has been touring film festivals since March. 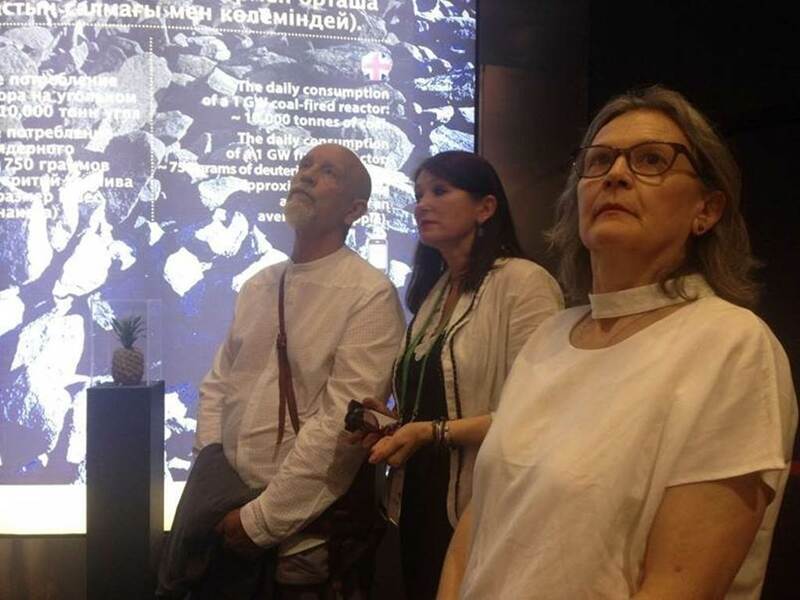 Early in August, the well-known actor, director and producer John Malkovich makes a stop at the ITER exhibition at the Kazakhstan World's Fair. The 110-square-metre exhibition has been a popular attraction within the French Pavilion since it opened on 10 June. 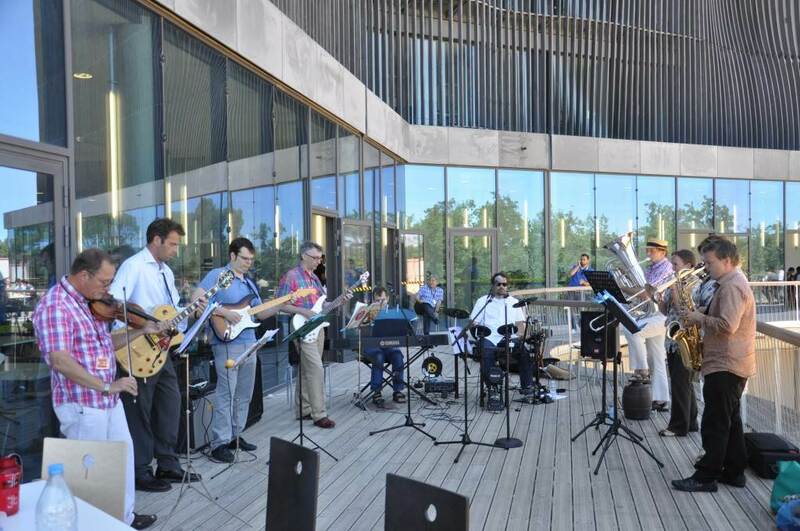 In the framework of a partnership this year between the ITER Organization and the Festival d'Aix-en-Provence, the ITER community was treated on 17 July to a concert in the amphitheatre. On the program: short pieces by Schumann, Sibelius, and Purcell, sung by a bass-baritone (Evan Hugues) accompanied on the piano by Helio Vida. 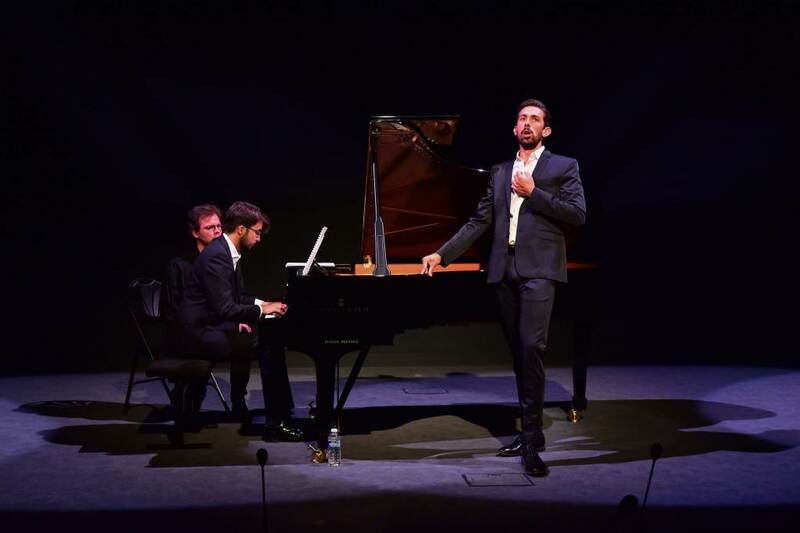 The Festival d'Aix is a world-renowned summer music festival devoted to lyric opera. 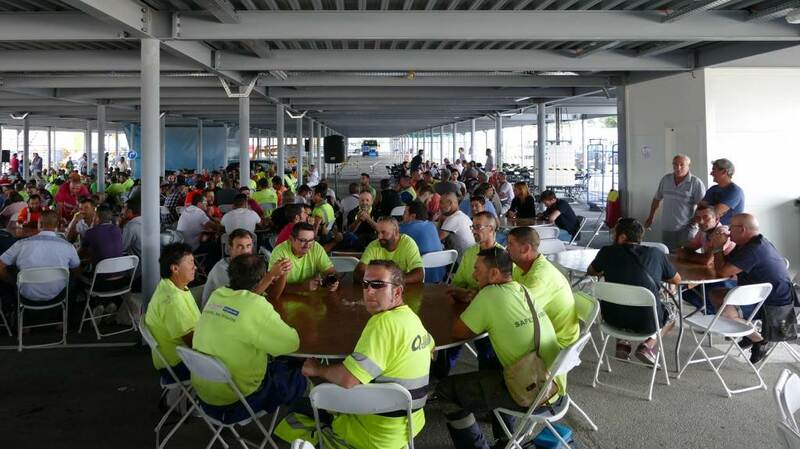 The VFR consortium (Vinci, Ferrovial, Razel Bec) held a barbeque for all employees on 29 June to celebrate three million hours worked in the framework of the TB03 contract. TB03, which includes the construction of the Tokamak Complex and eight other buildings, is about half way to completion. The 2017 World's Fair opens in Astana, Kazakhstan on 10 June. 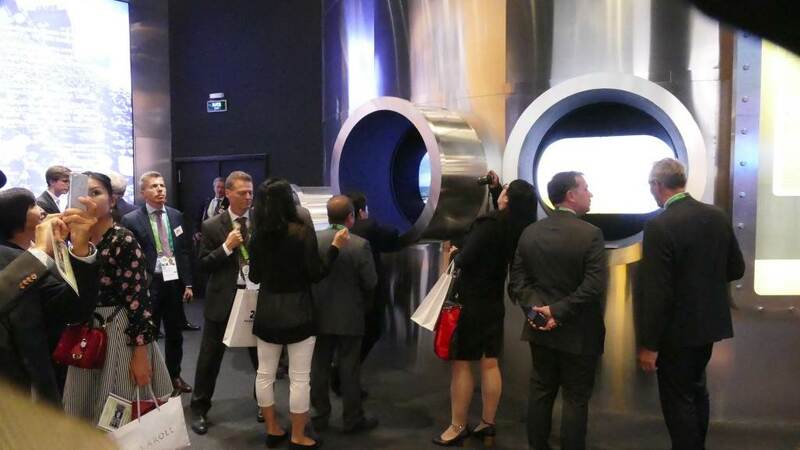 One of the highlights of the French Pavilion, the ITER stand receives its first ... amazed ... visitors. On 23 May, the Canadian documentary "Let there be light" is presented to ITER staff in the presence of film director and producer Mila Aung-Thwin (EyeSteelFilm). This 90-minute documentary about the quest for fusion energy has been competing at international film festivals since February. 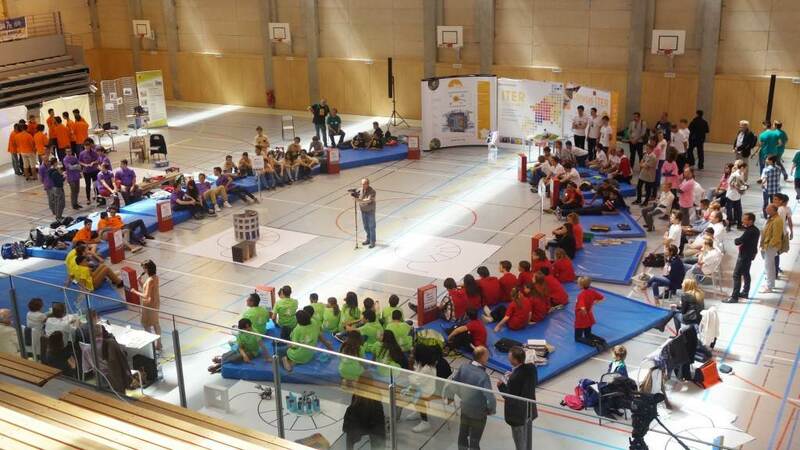 Six hundred students from 27 schools participated in the sixth edition of ITER Robots in May. 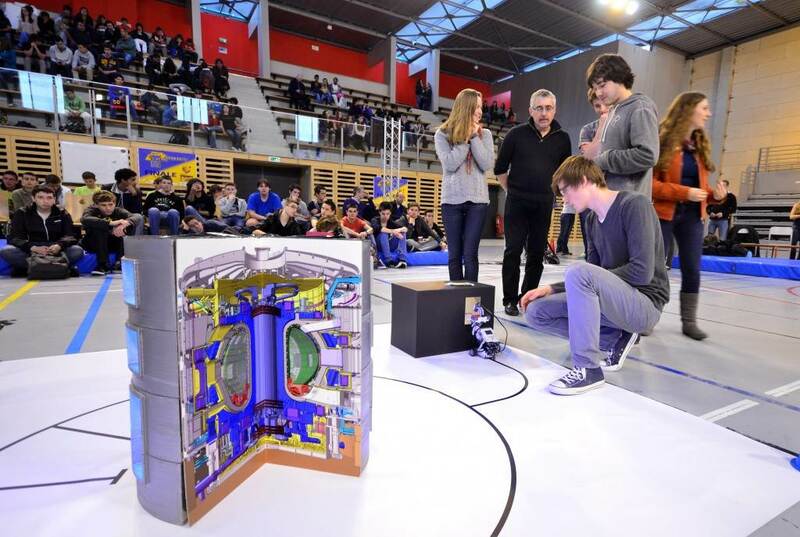 This contest, organized annually by Agence Iter France and the ITER Organization, tests students in engineering and robotics, but also in their knowledge of the ITER Project. 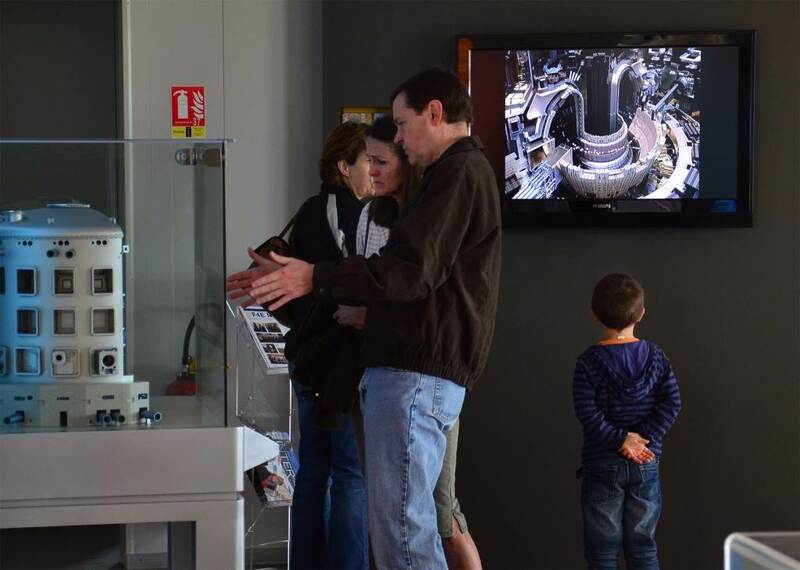 Eight hundred visitors signed up for the latest ITER Open Doors Day, held on 20 May. Highlights this year included a visit to the European winding facility for poloidal field coils and another to the Tokamak Building worksite (pictured). 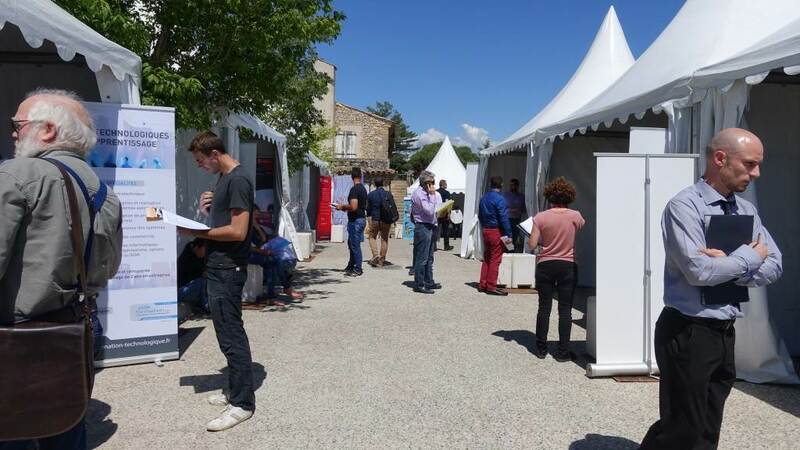 The day before the TEDxAix Conference, held on 28 April near ITER in Aix-en-Provence, France, a large group of participants and sponsors were received for a visit on site. Bringing people together people from multiple cultures and sectors to "rethink tomorrow," TEDxAix was broadcast live in the ITER amphitheatre. 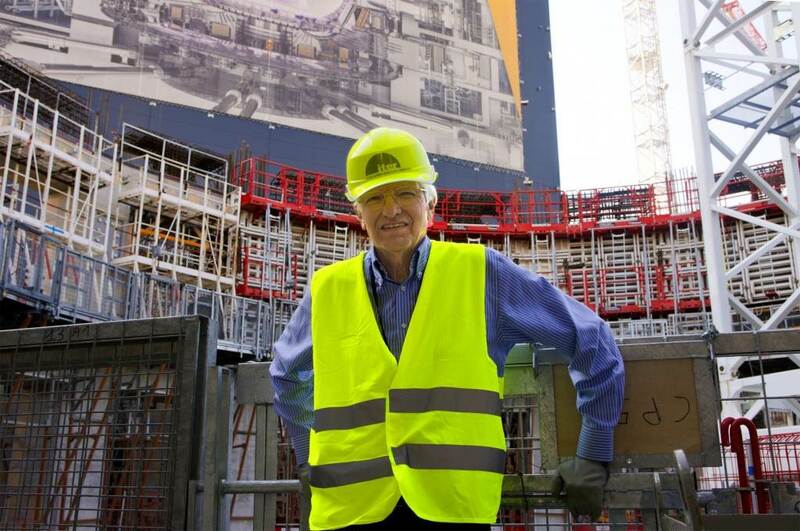 Former Council Chair Chris Llewellyn Smith stopped by ITER in early April and took a tour of the construction site. "I can say that today I saw the dream turning into reality!" 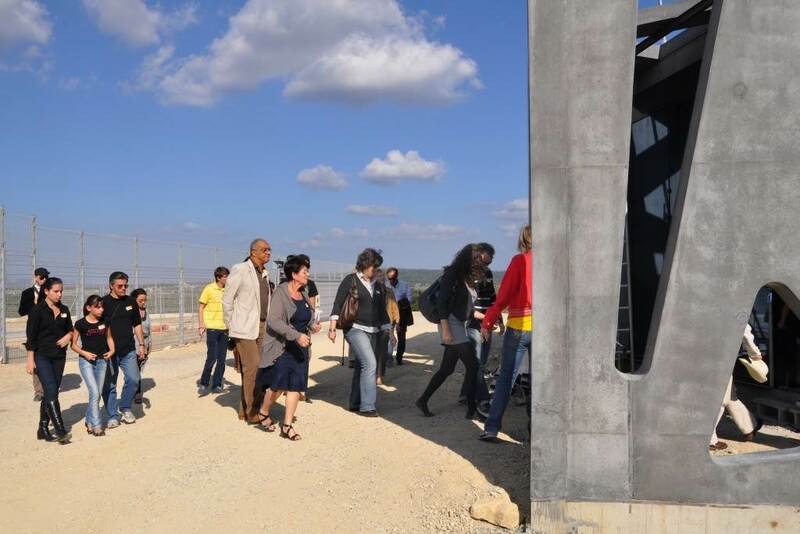 Three busloads of participants visit the worksite before the start of the ITER Business Forum 2017, held off site in Avignon, France. 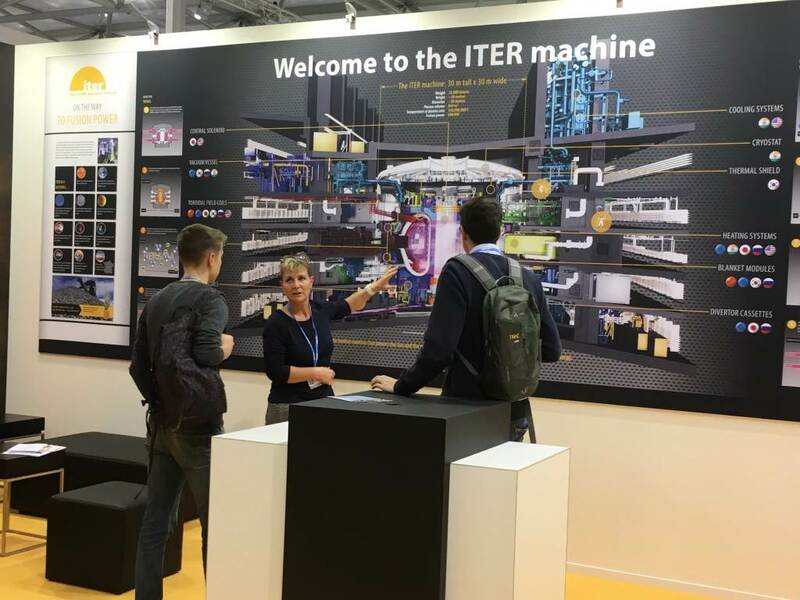 For many, their companies or institutes are already contributing to the realization of ITER; others are interested in finding out more about opportunities. 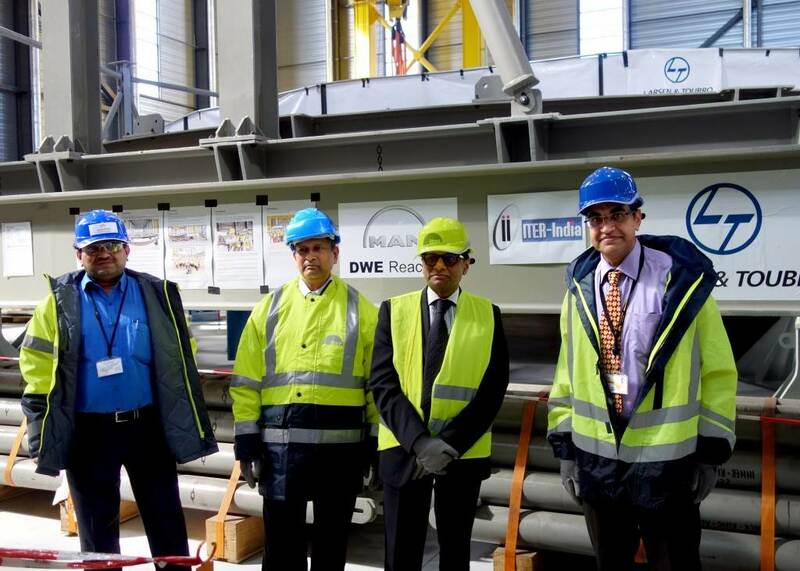 During a half-day visit to ITER, India's Ambassador to France and the Principality of Monaco, His Excellency Mohan Kumar (second from right), made sure to meet with the team in the Cryostat Workshop and take stock of assembly progress on the ITER cryostat, a major Indian contribution to the project. 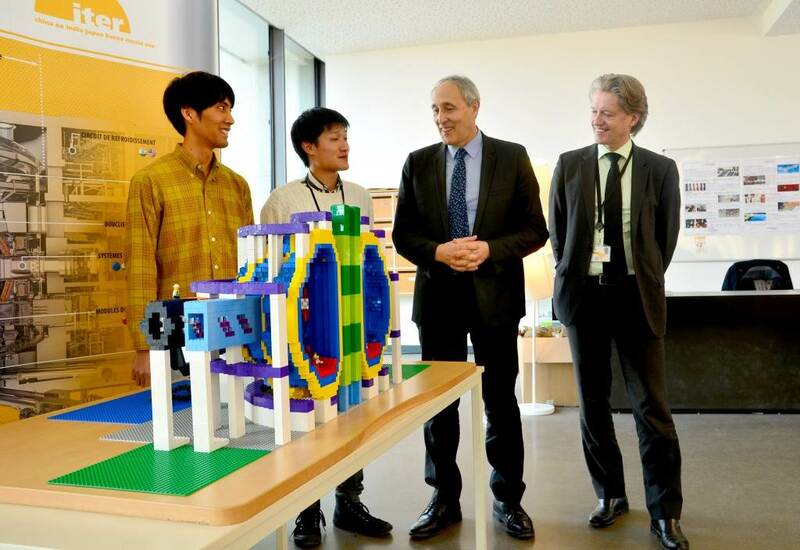 Two students from Kyoto University (Konishi Laboratory, Institute of Advanced Energy) are successful in building a Lego model of the ITER Tokamak in the lobby of ITER Headquarters in March. Taishi Sugiyama and Kaishi Sakane did it with four days and 40,000 Lego bricks at their disposal, plus the encouragement of a steady stream of observers! Passionate about physics ... and ITER! 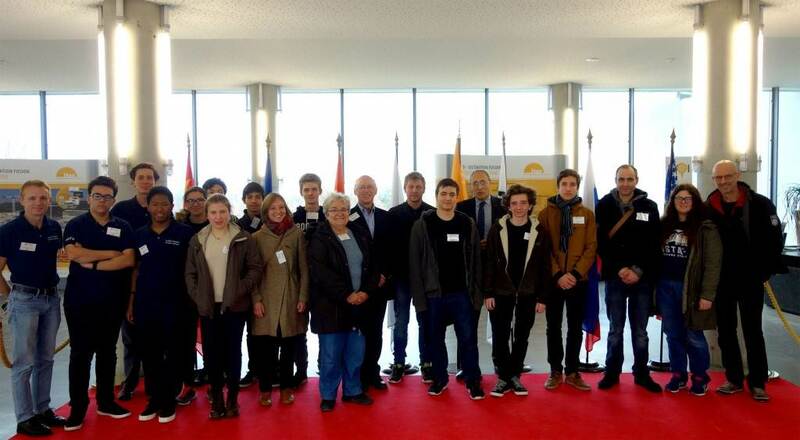 Finalists to France's annual Physics Olympics have the opportunity to visit ITER on 26 January. These high school students, representing some of the 25 teams selected at the level of regional competitions, will be presenting self-designed physics projects to a jury of scientists in Marseille. ITER's powerful neutral beam injection system will be tested in advance of operation at the PRIMA neutral beam test facility, in Padua, Italy. 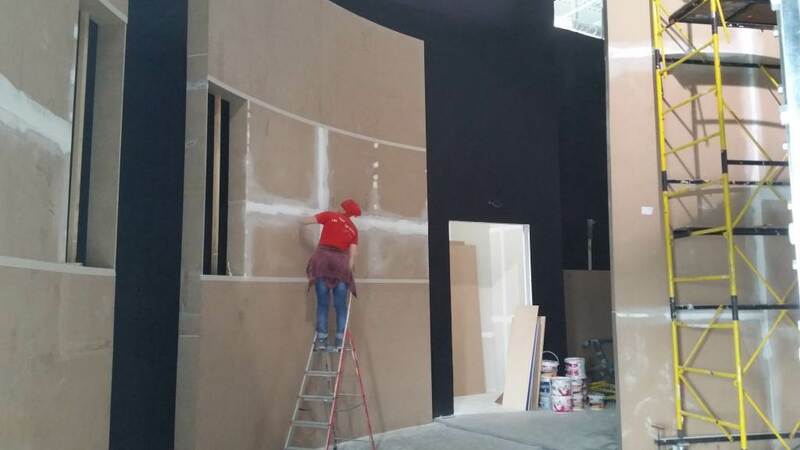 The buildings have been completed by host lab Consorzio RFX and component installation is progressing well. 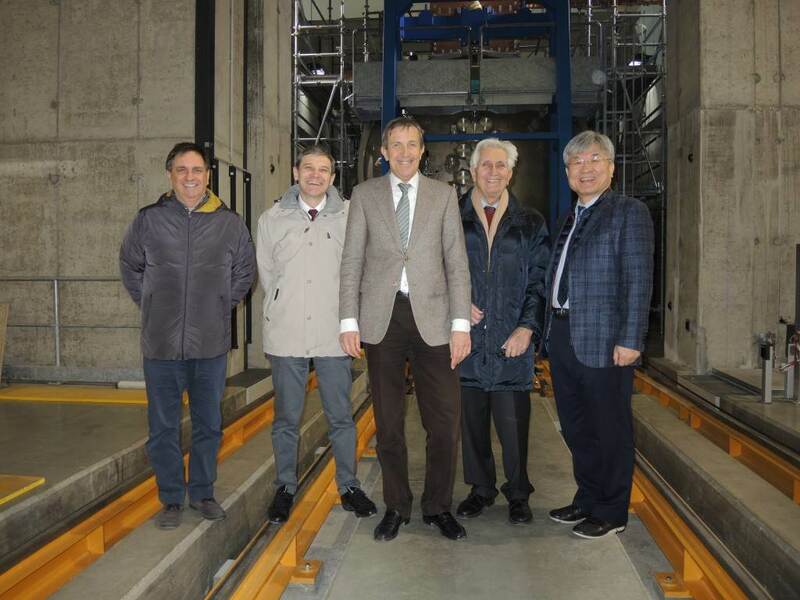 ITER's Gyung-Su Lee (far right), Deputy Director-General and Chief Operating Officer, visited in January. There is now a new way to follow ITER construction progress: an aerial tour that allows the viewer to fly over the site as well as enter specific buildings and zones under construction. 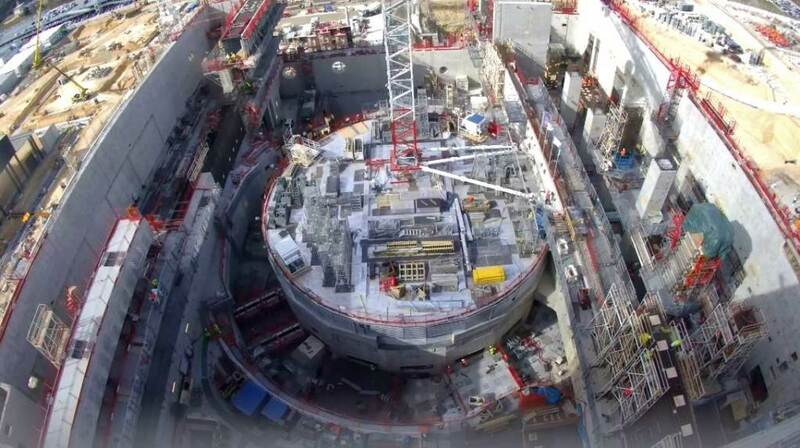 The tool is accessible through the home page of the ITER website as well as through the view box pictured here (fitted with a smartphone) that was previewed at Council. 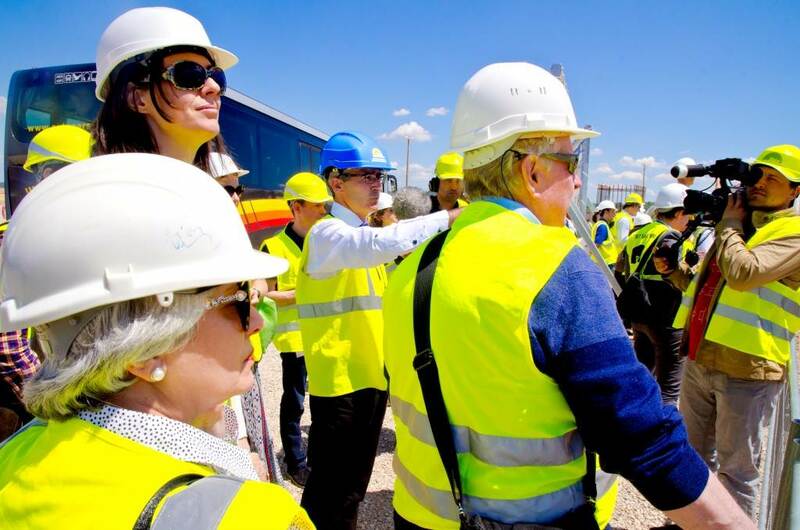 On 24 October, six Members of the Industry, Research and Energy Committee of the European Parliament spent the day at ITER, meeting the ITER Director-General, visiting the design offices and the construction site, and exchanging with staff and contractors from the European Domestic agency. 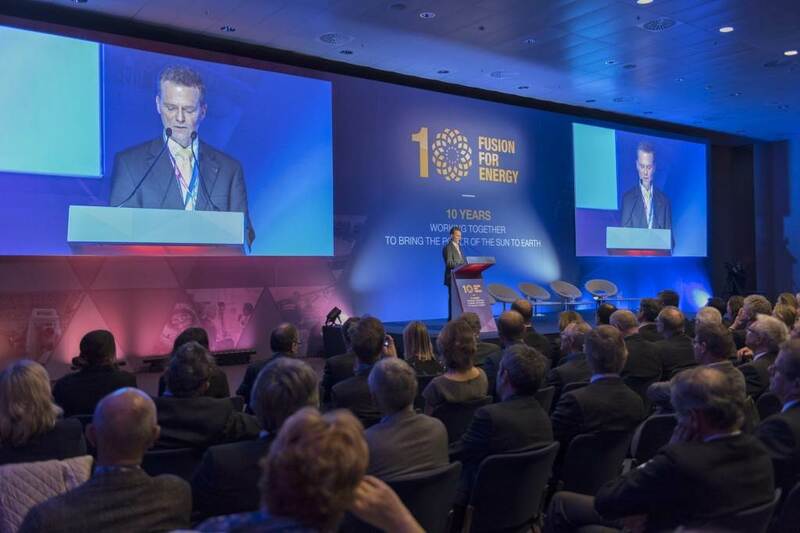 In October, ITER staff members attend the Fusion Energy Conference in Kyoto, Japan. This rendezvous for fusion researchers is organized every two years by the International Atomic Energy Agency to highlight worldwide advances in fusion theory, experimental results, technology, engineering, safety and socio-economics. 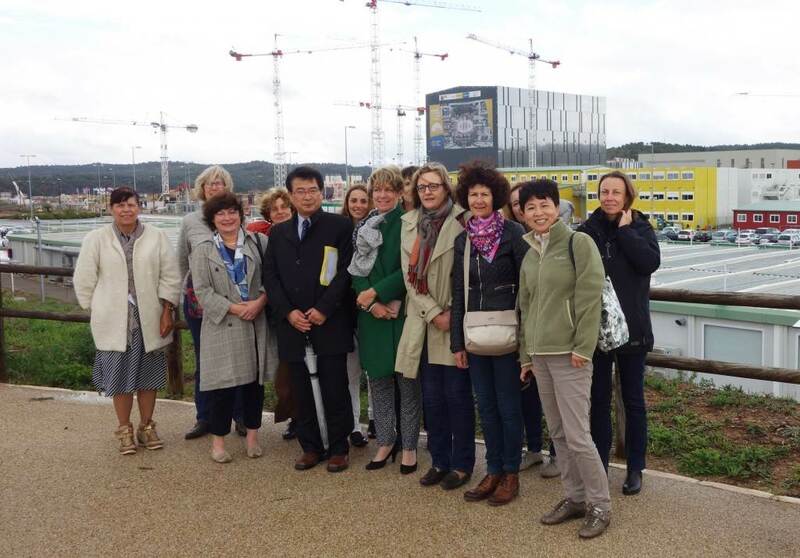 Mid-October, ITER receives a delegation from the non-profit association Women in Nuclear (WIN) France, part of a vast global network that aims to promote nuclear science and engineering to women and young people. 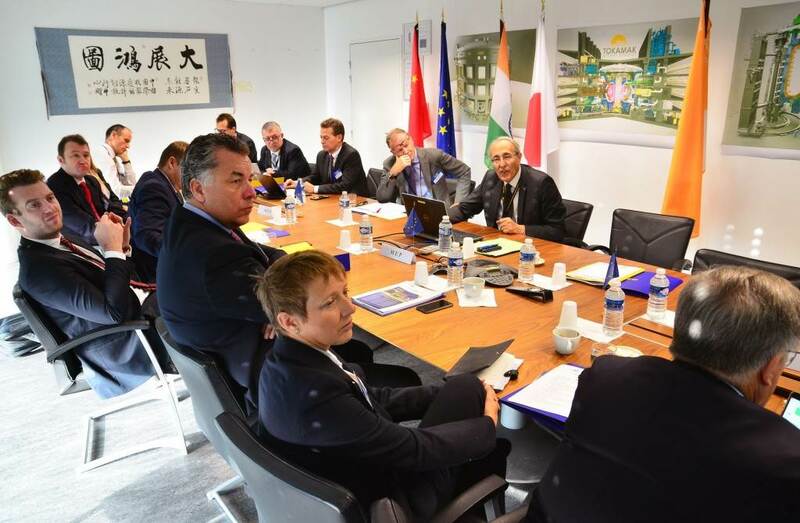 The group was hosted on a blustery day by Deputy Director-General Eisuke Tada (centre) and Françoise Flament, head of ITER's Procurement & Contracts Division and winner of the WIN France 2016 award (in green). 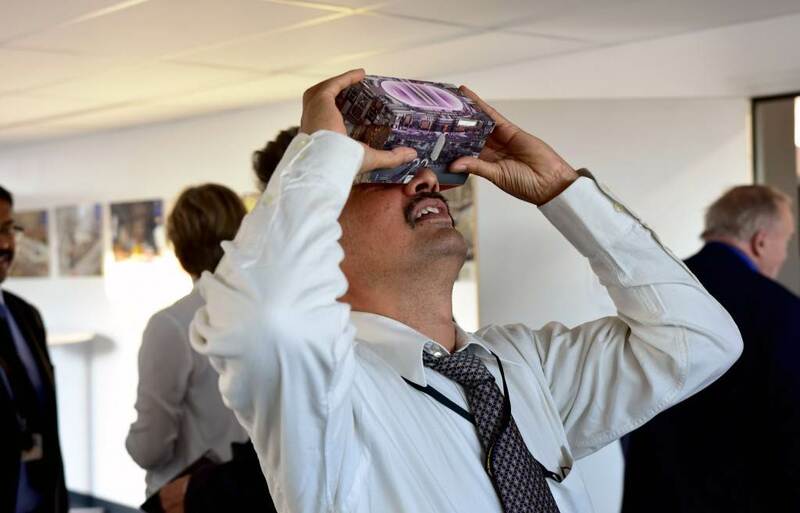 600 people visit ITER on 8 October 2016 as part of Open Doors Day. Highlights this year include a stop inside the 60-metre-tall Assembly Hall where the first specialized tools will be installed next year. 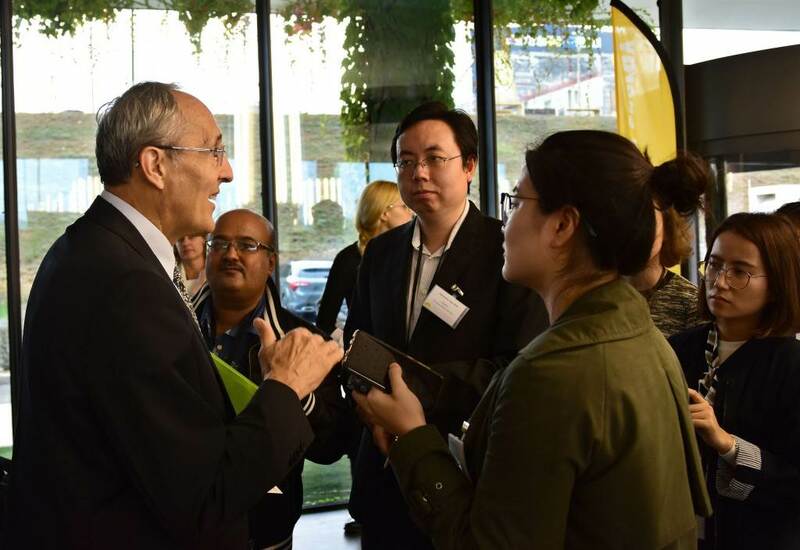 Annually, the ITER Organization invites journalists from the Members for a two-day media event. This year (6-7 October), one of the programmed activities is a visit to the CNIM manufacturing facility in Toulon, France (pictured), where 35 radial plates are being fabricated for Europe's toroidal field coils. Cameras are welcome. 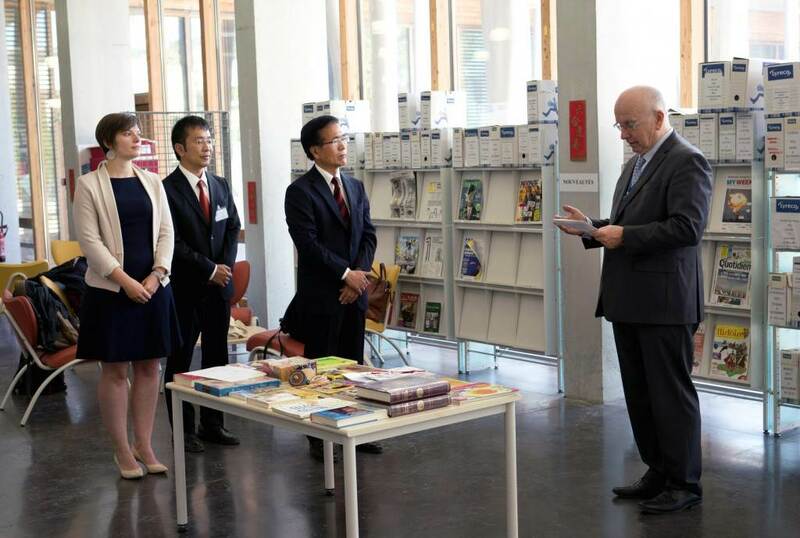 In September 2016, the Japanese Domestic Agency delivers a large number of books and teaching materials to the Provence-Alpes-Côte d'Azur International School (the "ITER school"). This is the third book donation made by ITER Japan to the Japanese language section and its pupils since the school opened in 2007. On 23 September, Johannes Schwemmer (left), head of the European Domestic Agency, and Yoshinori Kusama (centre), head of the Japanese Domestic Agency, sign amendments for four Procurement Arrangements. The signings are the first for the National Institutes for Quantum and Radiological Science and Technology (QST) in Japan which, in April 2016, took over the fusion research and development activities of the Japan Atomic Energy Agency. Four generations of Monaco Fellows gather for a group photo during the visit of H.S.H. Prince Albert II of Monaco on 21 September 2016. All started at ITER under a two-year fellowship financed by the Principality under the terms of a 2008 Partnership Arrangement. Four are current Monaco Fellows; the others were hired by the ITER Organization at the term of their fellowships. 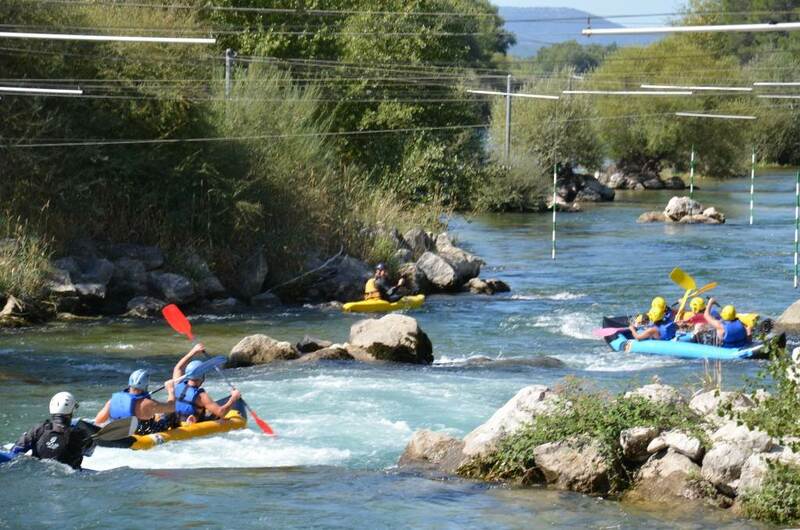 On Saturday 10 September, 450 people participate in the sixth edition of ITER Games, choosing between football, running, mountain biking, kayaking, tennis and an activity that is characteristic of the region--pétanque (a form of lawn bowling). 25 students and young professionals from the field of nuclear energy visit ITER on 29 June 2016. 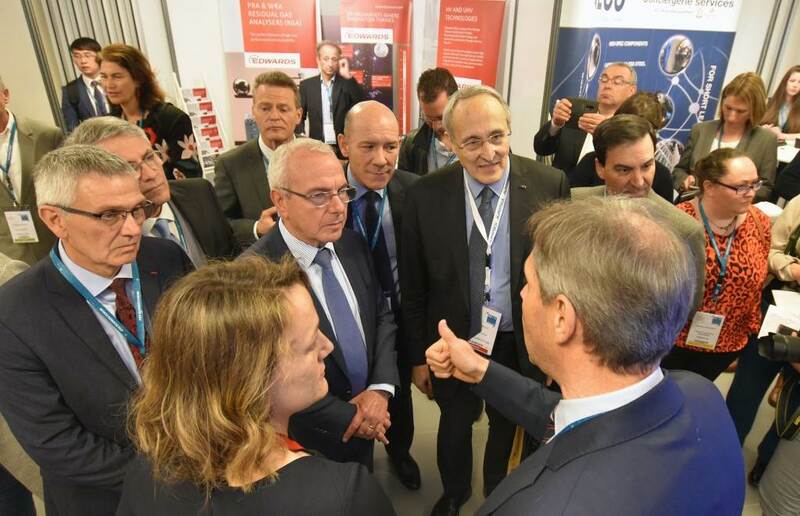 The visit, and meeting with the ITER Director-General, took place in the context of the Atoms for the Future event, organized annually in Paris by the French Nuclear Society Young Generation Network. 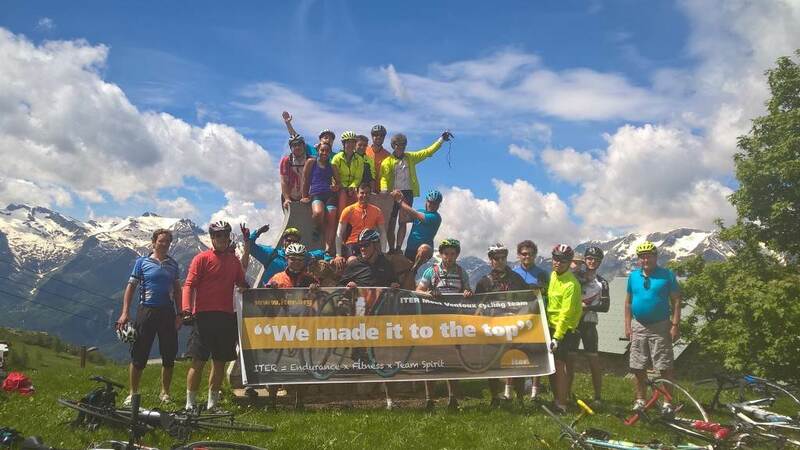 In June 2016 riders from the ITER cycling group, and friends, took to the French Alps. In their 57 km loop they made it to the top of the Alpe d'Huez, one of the most mythical climbs of the Tour de France with an average slope of 8.6%. 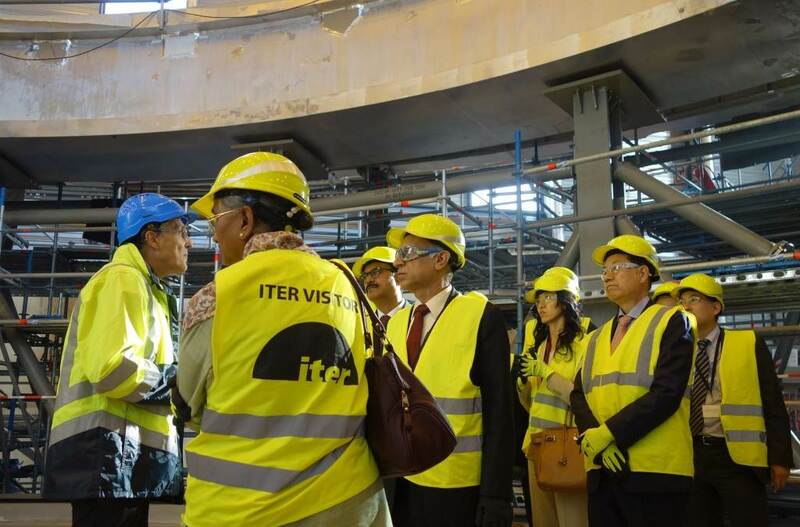 Director-General Emeritus Osama Motojima paid a visit to the ITER Organization in June 2016 and toured the worksite to see the status of construction. Mr Motojima was ITER Organization Director-General from July 2010 to February 2015. 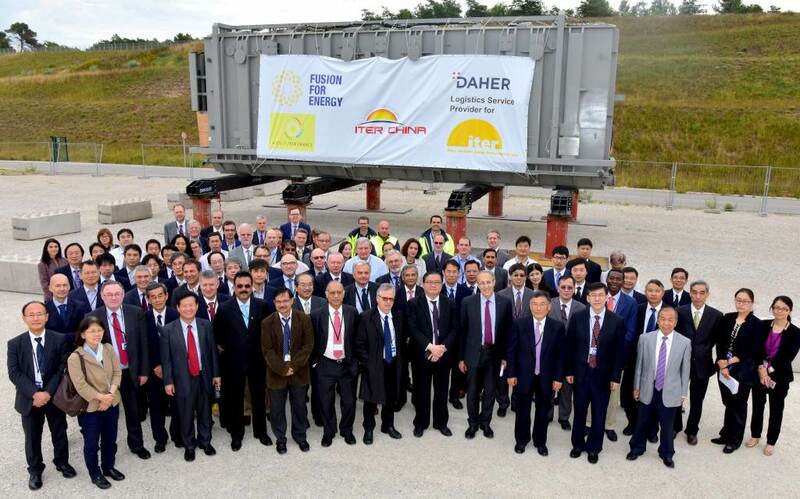 In the margins of the Eighteenth ITER Council, a ceremony is held on site to mark the arrival of the first major in-kind component from China—a 300-tonne electrical transformer for the pulsed power electrical network. Two more are expected before the end of the year. 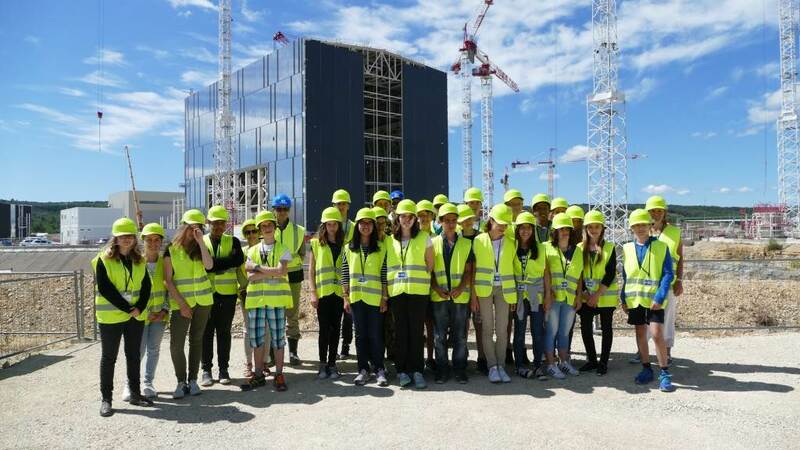 Two weeks after their victory 2016 ITER Robots remote handling trials, 24 junior high students from a school in Salon de Provence (Collège Jean Bernard) were invited by the ITER Organization and Agence Iter France for a tailor-made visit to ITER, including a visit to the worksite and encounters with scientists, engineers and the ITER Director-General. 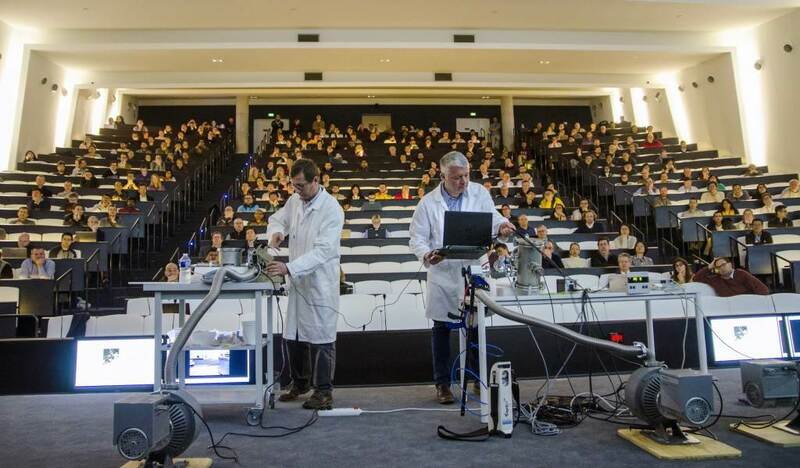 On 25 May, the ITER Robots contest organized by Agence ITER France, in close collaboration with the ITER Organization, the French Aix-Marseille Academy, and the Magnetic Fusion Institute IRFM, attracts over 500 high school students (30 teams). 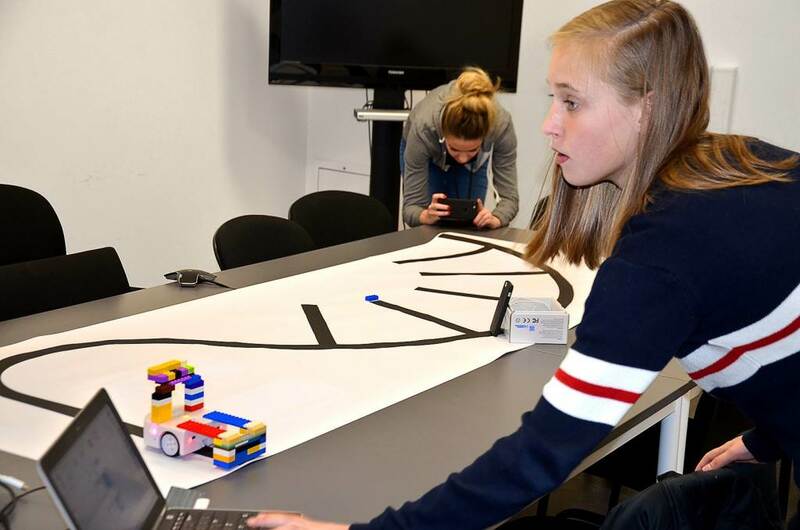 As part of a for-credit school project, the teams design and program Lego robots to accomplish a number of ITER-like remote handling tasks. 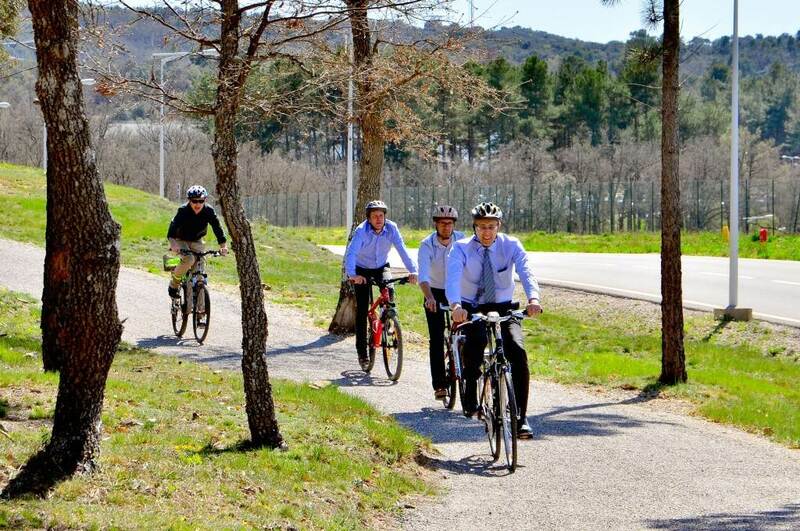 Just in time for spring, ITER has inaugurated a new bike path—the fastest, and healthiest, way to travel between office buildings. Leading the first group of bikers is Director-General Bernard Bigot. 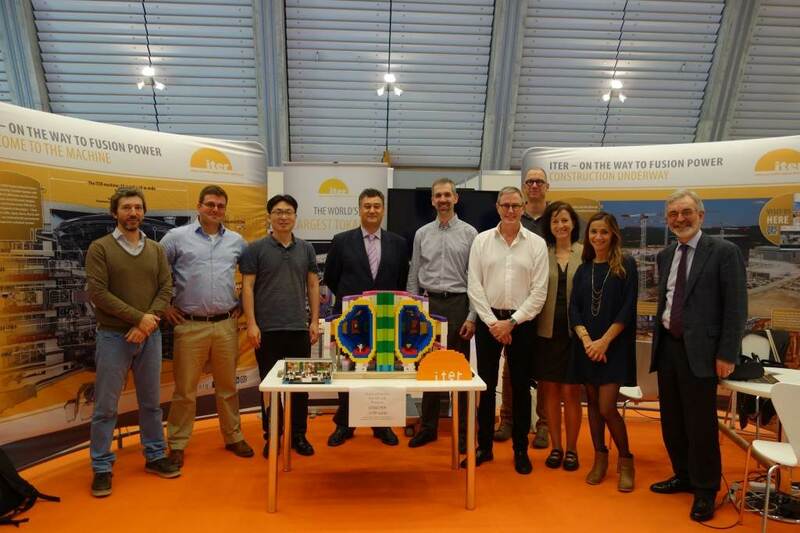 Two graduate programs in fusion science were at ITER on 15 February. Seventy Masters students, their professors, and institute heads from the French Education for Plasma and Fusion Sciences federation and the European Erasmus Mundus Fusion-EP program gathered for the signing of a Partnership for education in plasma and fusion sciences—13 French universities and grandes écoles are now signatories. (Learn more about the program on the Education section of the ITER web: https://www.iter.org/education). Over 100 graduate students and postdocs studying porous materials in nuclear engineering applications visit ITER on 28 January 2016 as part of a week-long Winter School organized by the Aix-Marseille University and the joint CNRS-MIT laboratory <MSE²>, with the support of the MIT Energy Initiative (MITEI). 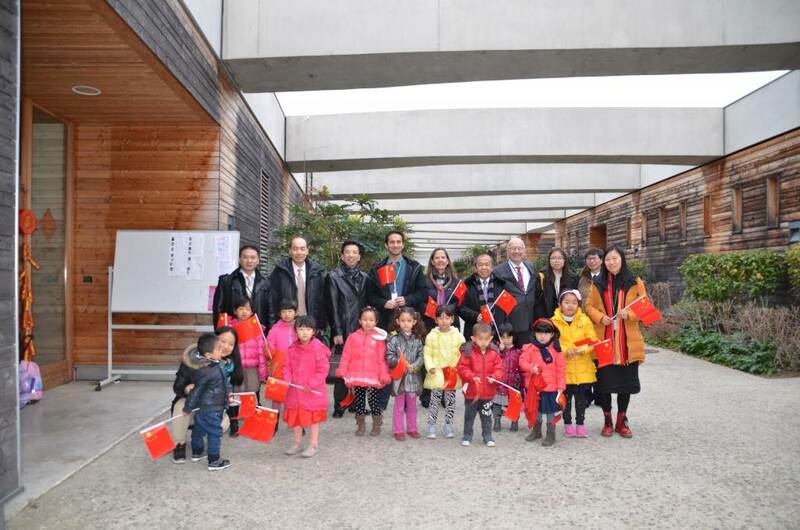 In January, a delegation from China visits the Provence-Alpes-Côte d'Azur International School, where ITER children are taught in French and in a second language (Chinese, English, German, Hindi, Italian, Japanese, Korean, Portuguese, Russian, or Spanish). The delegation visited classrooms and delivered a donation of books for the Chinese Section. 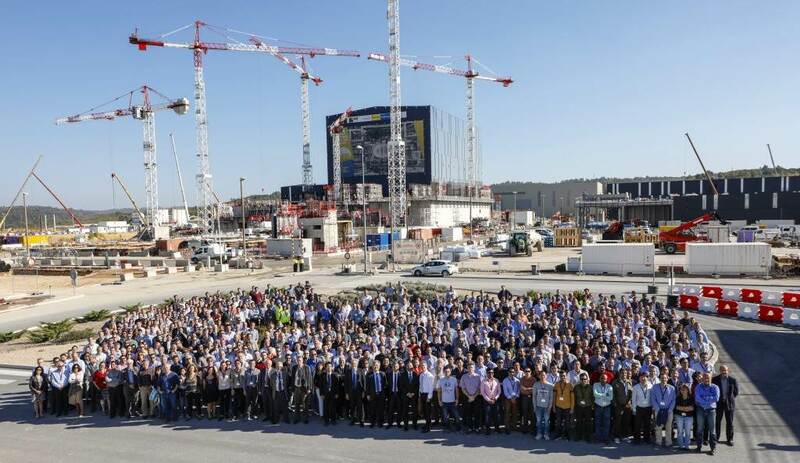 642 staff are currently directly employed by the ITER Organization. On 21 January 2016 at least 500 of them turn out for a historic all-staff photo in the Cryostat Workshop on the occasion of the Director-General's New Year wishes. In the background, the first ITER machine components are stored. Santons (from the Provençal "santoun," or "little saint") are hand-painted figurines that represent the Christmas nativity scene and various characters from Provençal village life such as the lavender seller, the mayor and the scissors grinder. ITER added a new figurine this year: the plasma physicist, complete with an ITER badge. 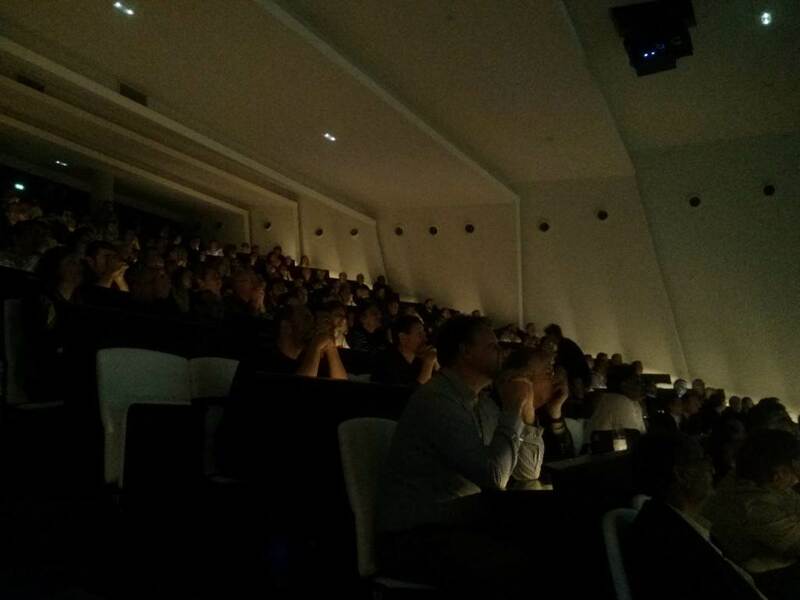 ITER staff assembled in the amphitheatre on Thursday 10 December to watch a live stream of the successful first plasma of the Wendelstein 7-X stellarator in Germany. Wendelstein will be starting its experimental campaign in 2016 after nine years of construction and one year of integrated testing. 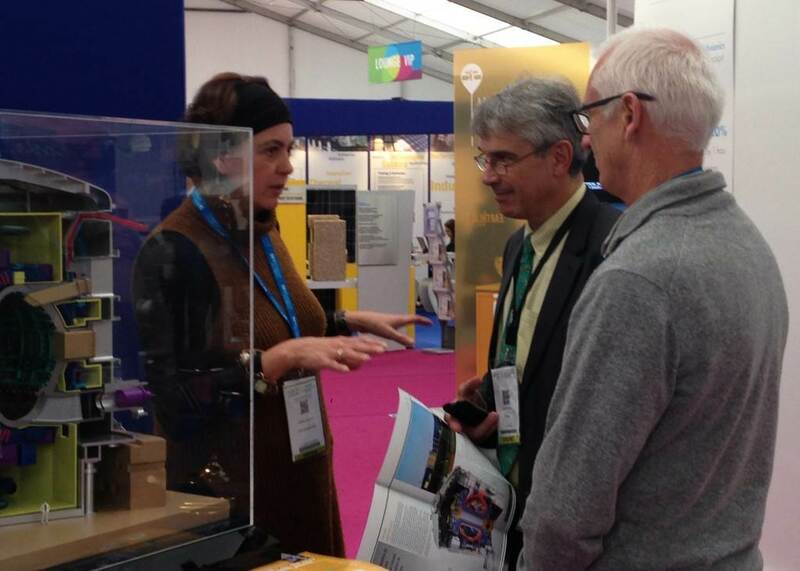 Climate conference in Paris: ITER was there! 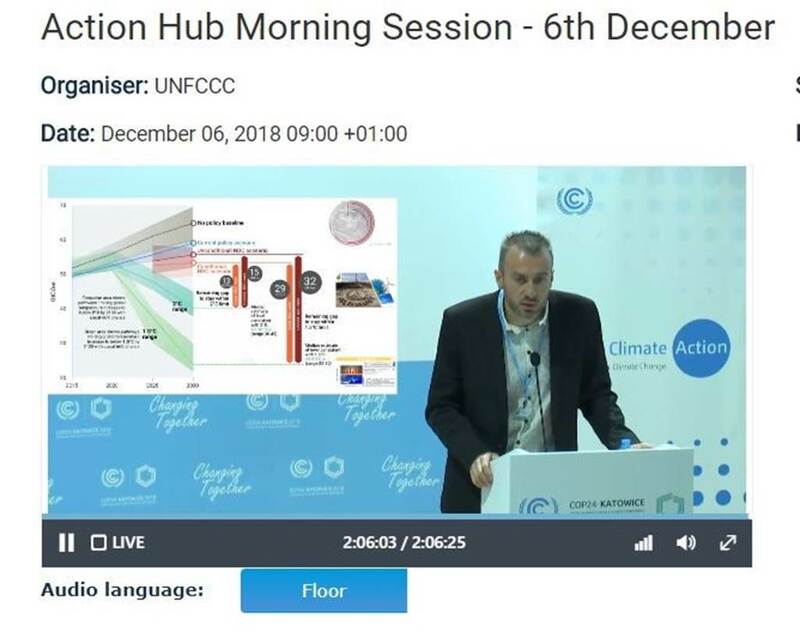 The ITER Project was present at the United Nations Conference on Climate Change, the COP21, held in Paris in early December. In a pavilion dedicated to low-carbon solutions (The Galerie), ITER staff interacted with representatives of the energy sector, country delegations, journalists and bloggers. Catch them young, as the saying goes. 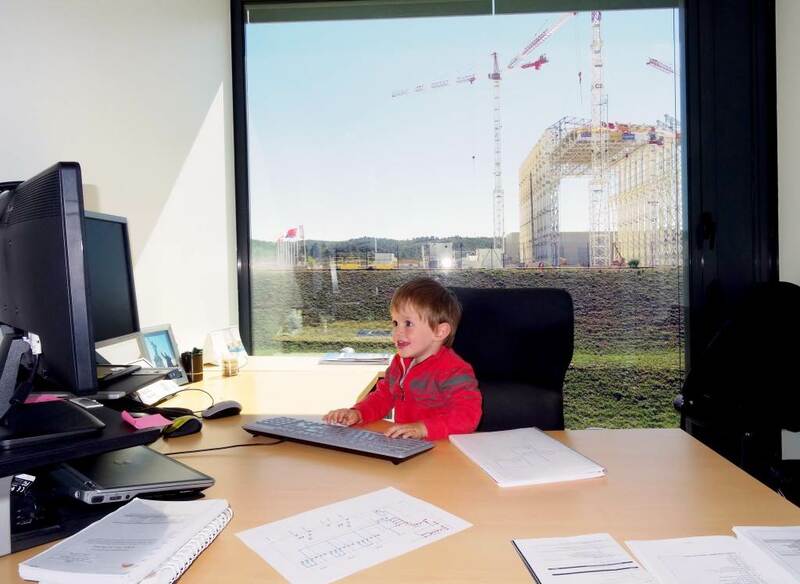 This little boy is clearly ready to walk in his Dad's footsteps... On Wednesday 23 September, ITER staff members had the opportunity to invite their families to the workplace for lunch and a tour of the offices. The sound of little feet in the corridors and high-pitched voices calling out their food orders in the canteen certainly altered the usual ambiance at ITER Headquarters for a few hours. 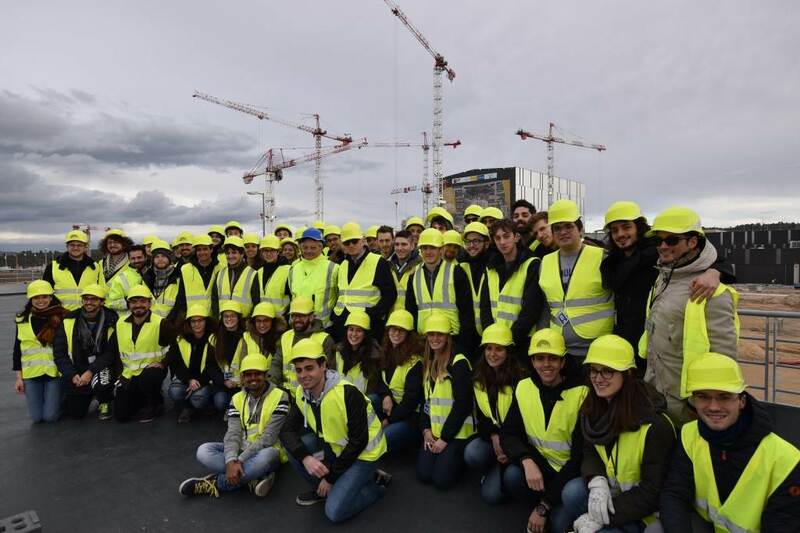 Eighty participants to the European Conference on Applied Superconductivity, EUCAS (Lyon, France) make the three-hour trip to the ITER site in September, visiting on the very day the Assembly Building roof is lifted into place. ITER's giant superconducting magnet systems (10,000 metric tons) make up fully one-third of the machine's weight. Where there is a will, there is a way (up)! 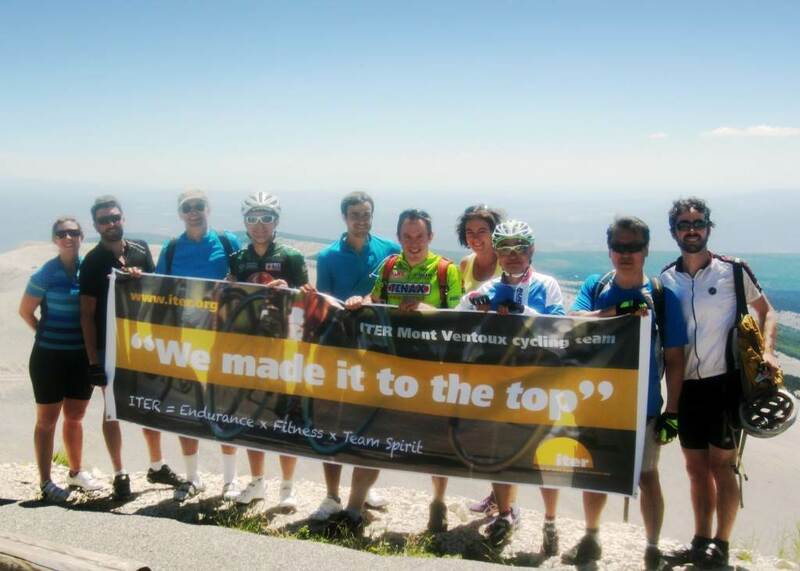 The Tour de France will skip the Mont Ventoux in 2015, but the ITER cycling team took up the challenge at the end of June — for the third time. In the early morning hours they left Bédoin (275 m) at the base of the famous barren mountain. Upon their arrival at the top (1912 m), they proudly unrolled their banner: Angie Hunt, Frederic Escourbiac, Rene Raffray, Ingo Kuehn, Colin Smith, Louis Sexton, Sabina Griffith (support), Joo-Shik Bak, Hyun-Sik Chang and Ryan Hunt. Bravo! 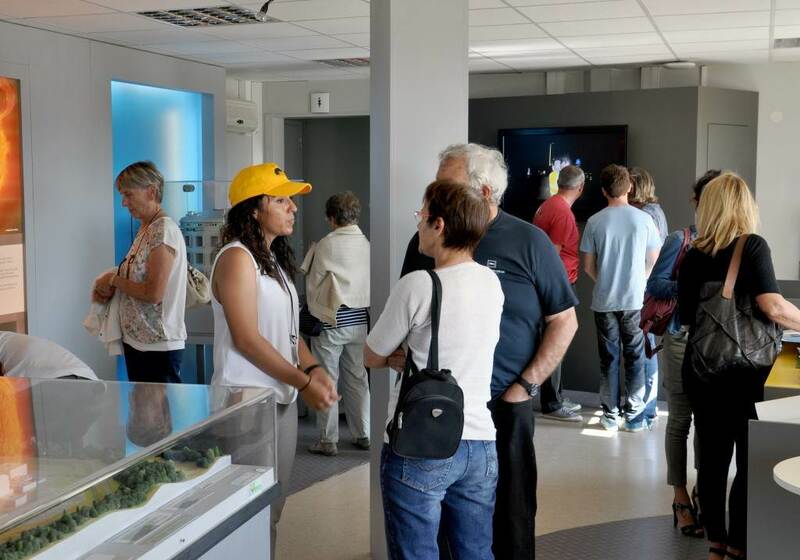 From as far away as Switzerland, Italy and Spain (and as near as the neighbouring villages), 800 visitors flocked to the ITER Open Doors Day on Saturday 30 May. 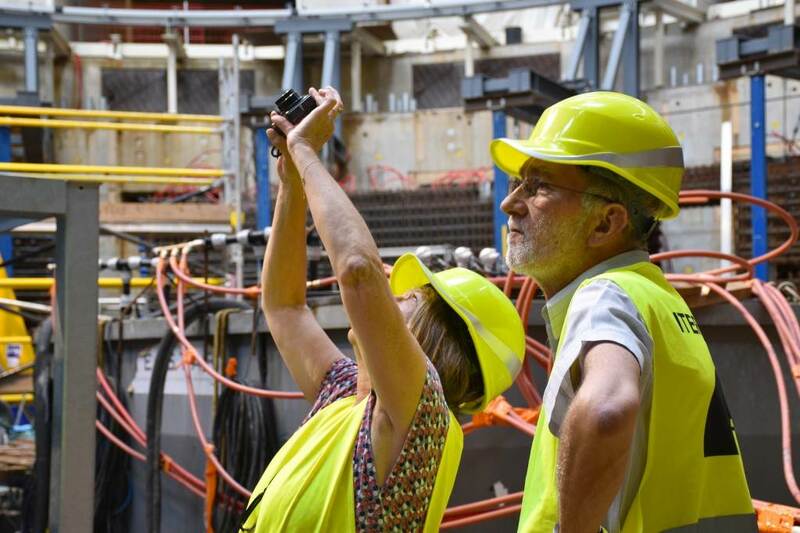 Held twice a year, the public event is the occasion to visit the construction site, meet ITER specialists, and find answers to questions about one of the world's largest collaborative efforts in science. 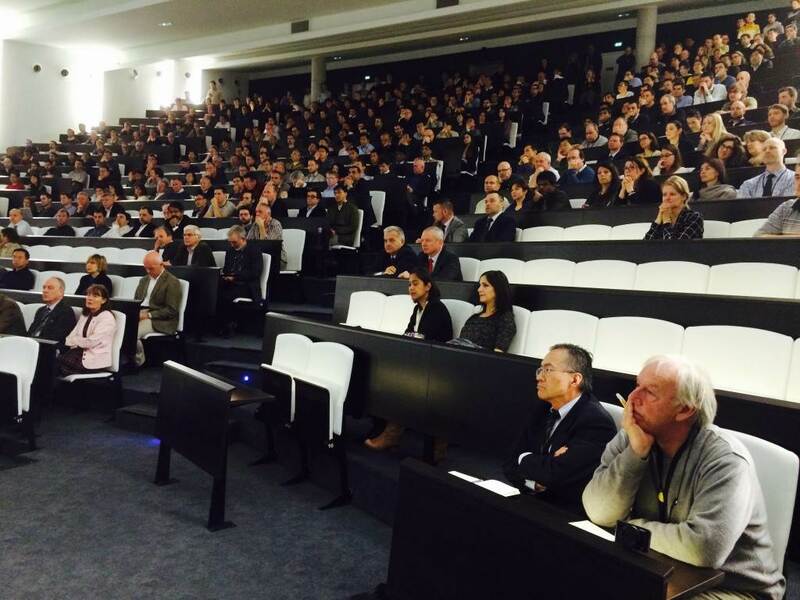 Representatives of 137 international companies attend the ITER Assembly and Installation Information Day on 21 May 2015. 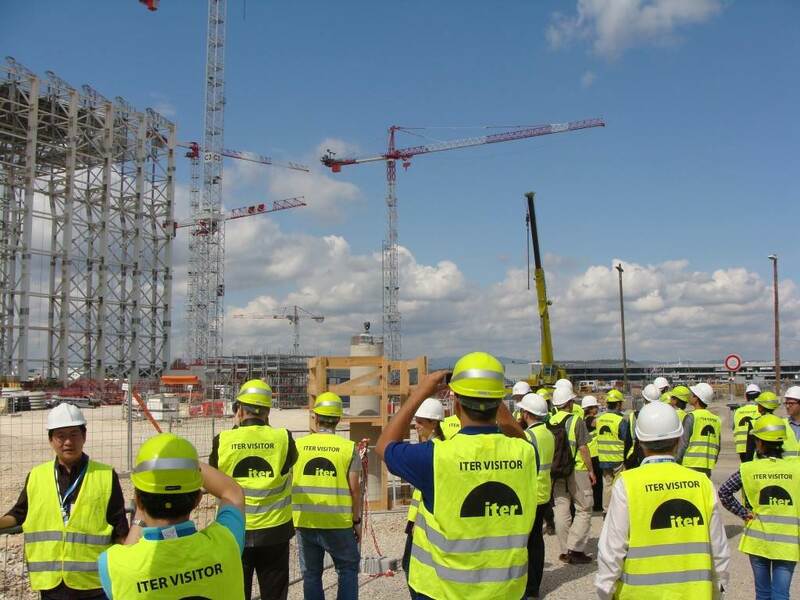 During the day-long program, the ITER Organization presents the planned work scope of the assembly and installation phase of ITER construction, as well as tender rules and regulations and specific work packages. 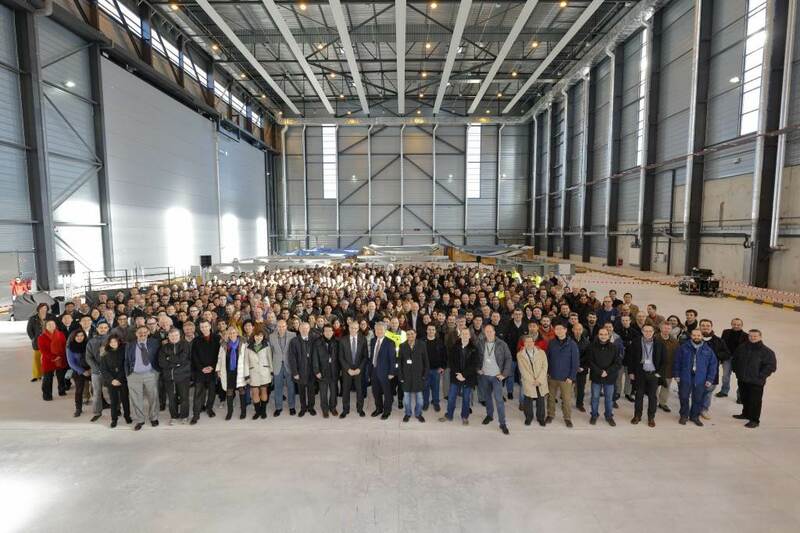 ITER assembly kicks off in 2017. 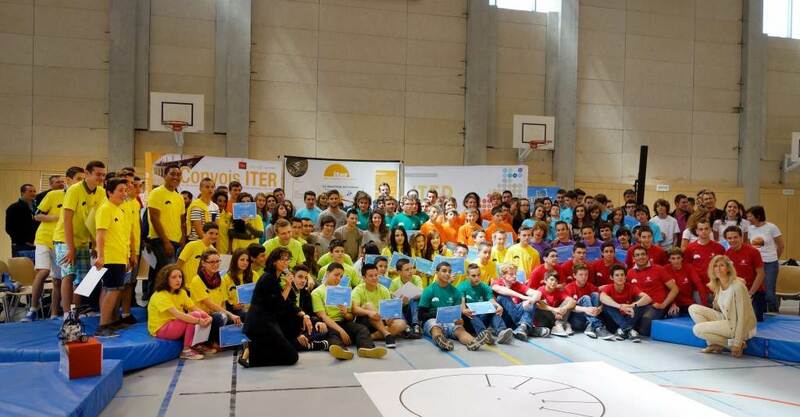 For the fourth consecutive year, Agence Iter France and ITER Organization hold the day-long ITER Robots competition, during which five junior high teams and five high school teams compete with their Lego robots in an ITER-like remote maintenance task. Only one team in each category can win, but all participants gain valuable experience in engineering concepts, robotics and team work. 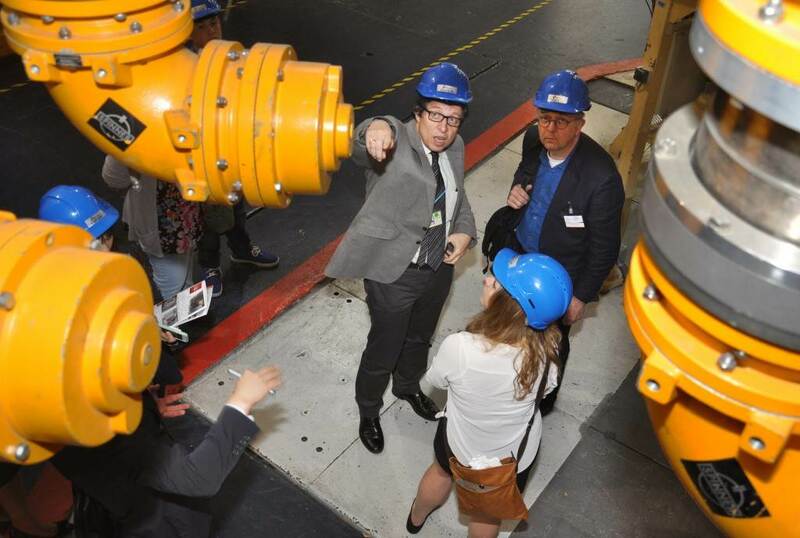 Sixty members of the international press visit ITER in May 2015 for a two-day program of presentations, interviews and visits. One of the highlights is the worksite tour, with stops at the Tokamak Pit and the manufacturing facility for ITER's largest magnet coils. 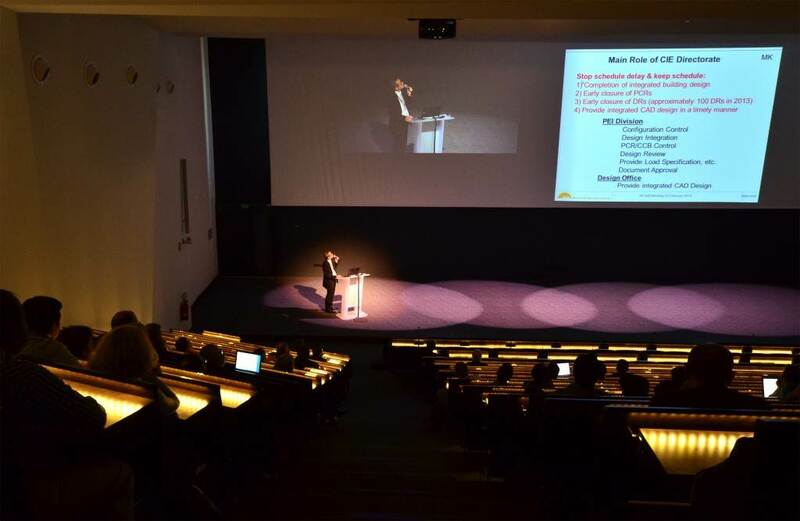 On 4 March 2015, Osamu Motojima, ITER Director-General from 2010 to 2015, bids goodbye to staff and colleagues in the ITER amphitheatre. 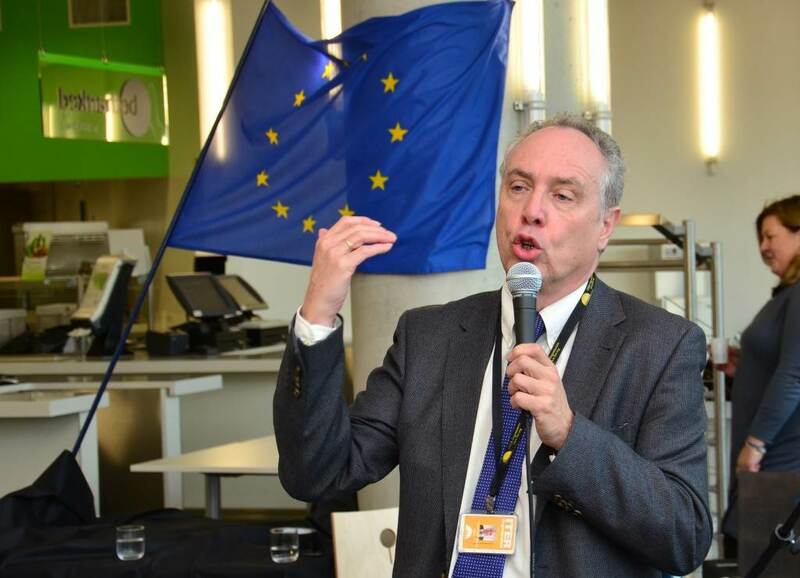 "I thank you for your huge contribution to the ITER Project, I celebrate the new Director-General Bernard Bigot, and I sincerely wish for the success of the ITER Project." 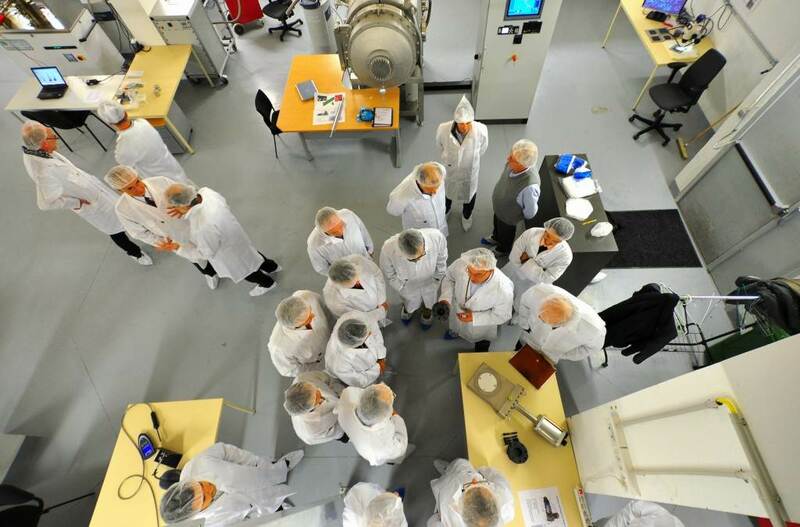 In January, a fully functional vacuum laboratory is inaugurated in the basement of ITER Headquarters. The room is equipped with component and material qualification equipment and can also be used to train employees in vacuum testing (specifically leak testing). The first ITER blood donation campaign takes place on 11 December 2014 at Headquarters. 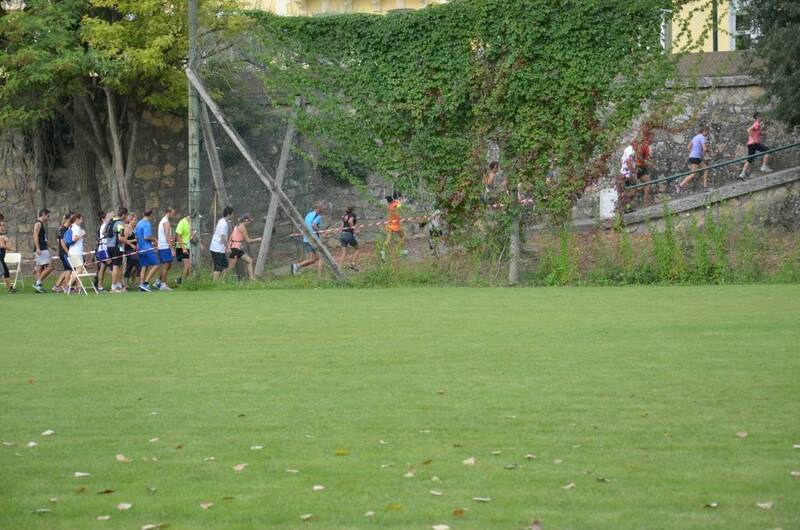 The successful initiative will be renewed approximately every six months. The mayor of Saint Paul-lez-Durance—the southern French town (pop. 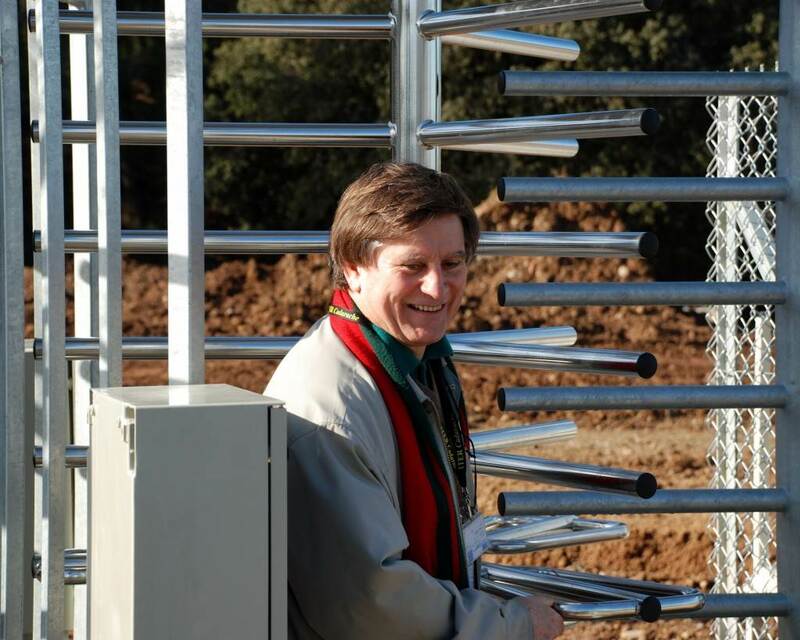 800) that hosts the ITER Project—delivers his annual holiday gift to the ITER Organization on 3 December 2014. 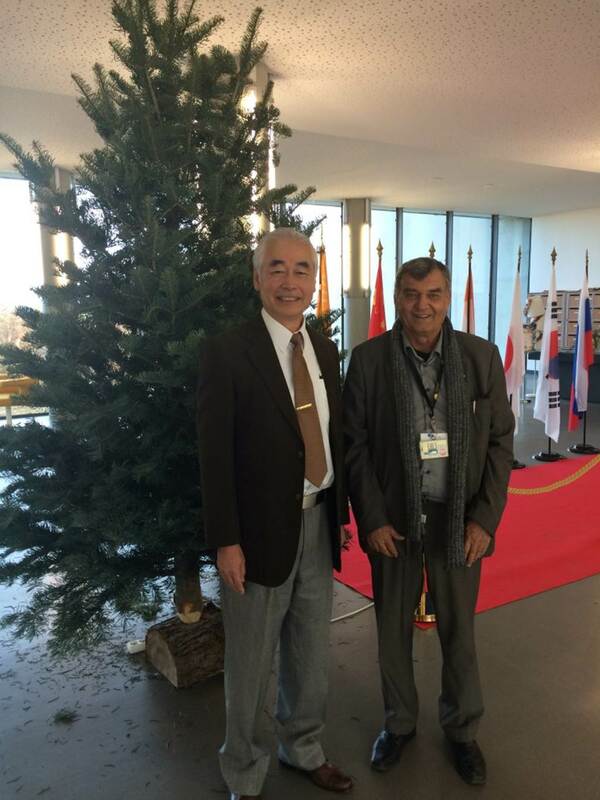 Roger Pizot, pictured here with ITER Director-General Osamu Motojima (left), is a frequent visitor to the ITER site. Curiosity about ITER is growing. 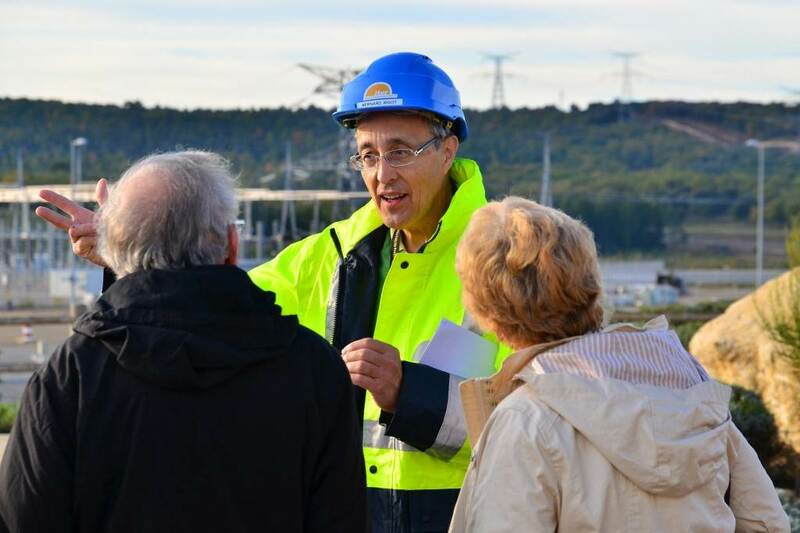 To satisfy the public's increasing demand for information about the project the ITER Organization now organizes two Open Doors Day events during the year, hosted by ITER staff members volunteering as guides. 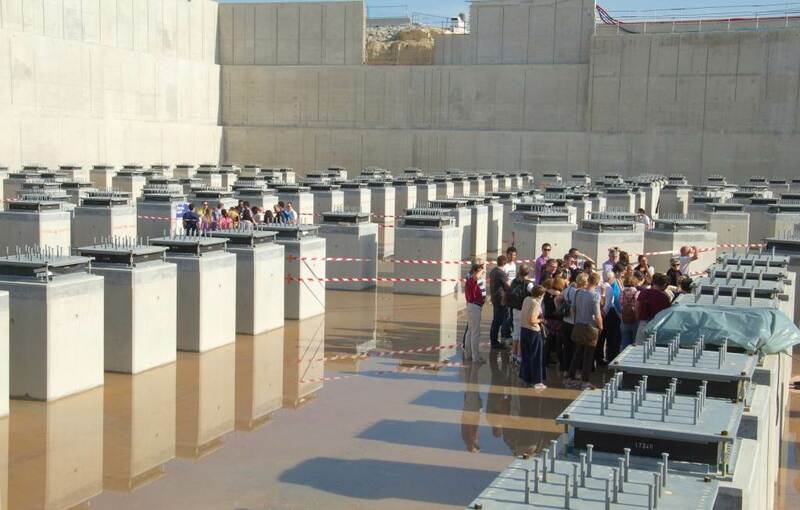 On Saturday 4 October, rotating buses brought some 1,300 people to the platform for a glimpse of Tokamak foundations. Sixty-five members of the Ingenieurs and Scientifiques de France (IESF)/British Section visit ITER on 5 September 2014. 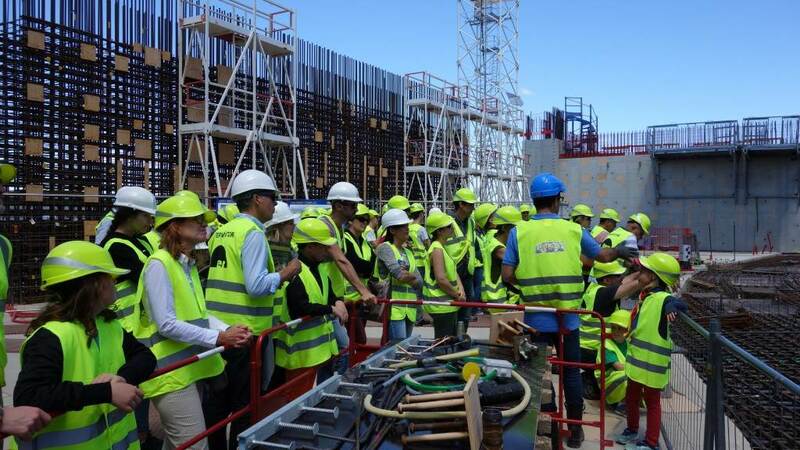 A day-long program of presentations on the nuclear safety aspects of the project, fusion technology, the engineering challenges of building ITER and the deuterium-tritium fuel cycle concluded with a tour of the construction site. ¶IESF is an association dating back to 1848; the British Section was founded in 1919 by members of the British Army returning from the war. The IESF embraces a broad spectrum of engineering and scientific organizations throughout France and elsewhere in Europe. 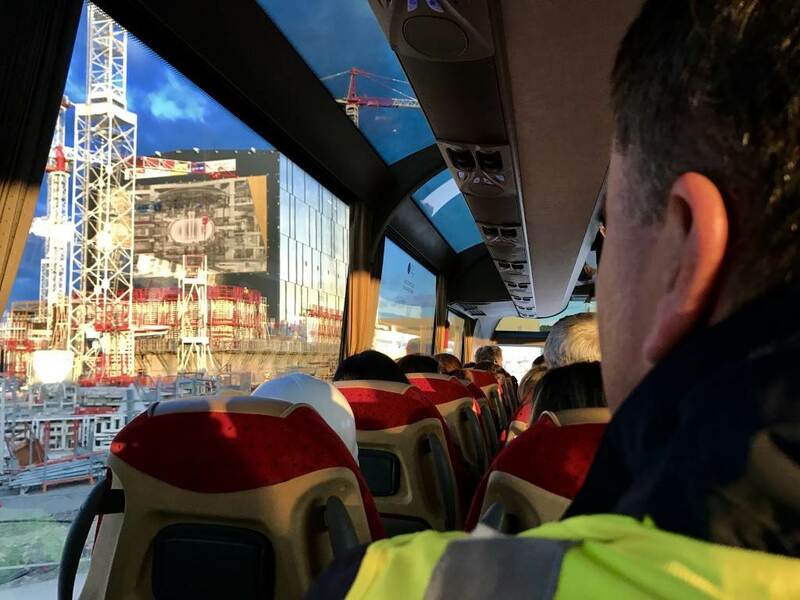 For the fourth annual ITER Open Doors Day, a total of 1,200 local visitors are bussed onto the ITER construction site for a close-up view of work in progress. 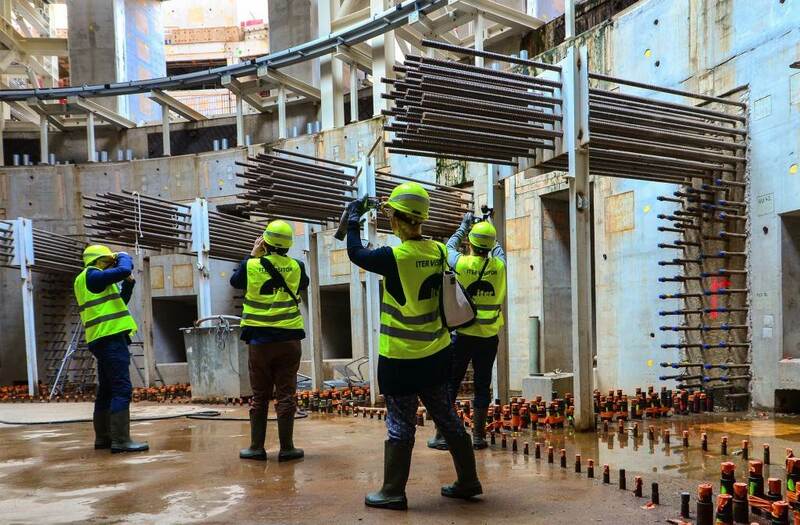 Close to the Tokamak Complex Seismic Pit, building specialists are on hand to explain the technique behind supporting nearly 400,000 tonnes of building, equipment and machinery on 493 seismic pads made of elastomer and stainless steel. 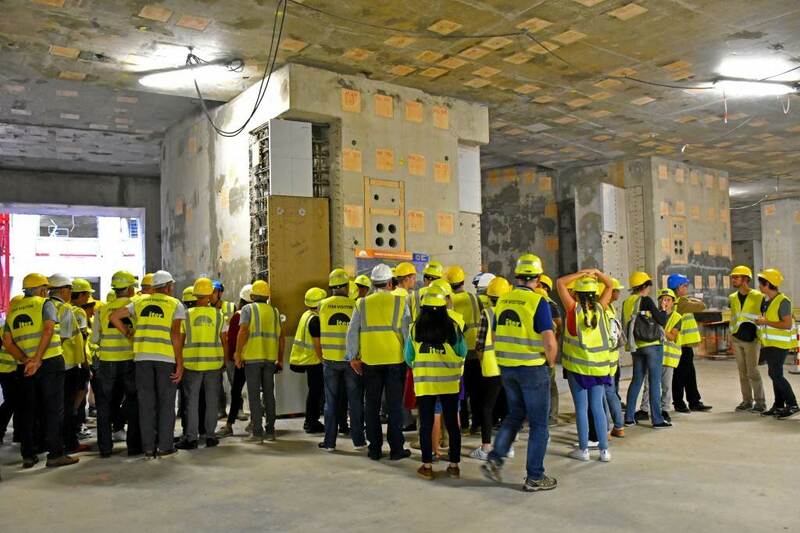 During a two-day press trip organized at ITER Headquarters in early May 2014, a group of 40 international journalists gets an in-depth introduction to ITER. 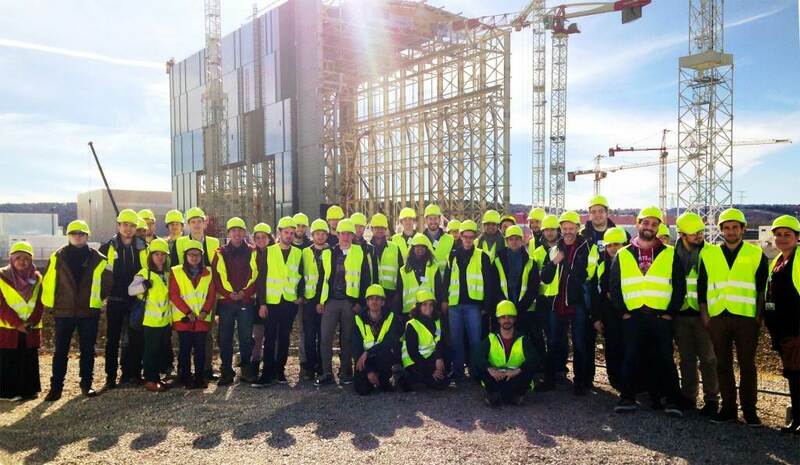 As part of the program, the journalists visit the construction site, the Tore Supra tokamak (pictured) at the neighbouring CEA research centre, and a European manufacturing facility located near Toulon France (CNIM) where series fabrication has started for the toroidal field radial plates. 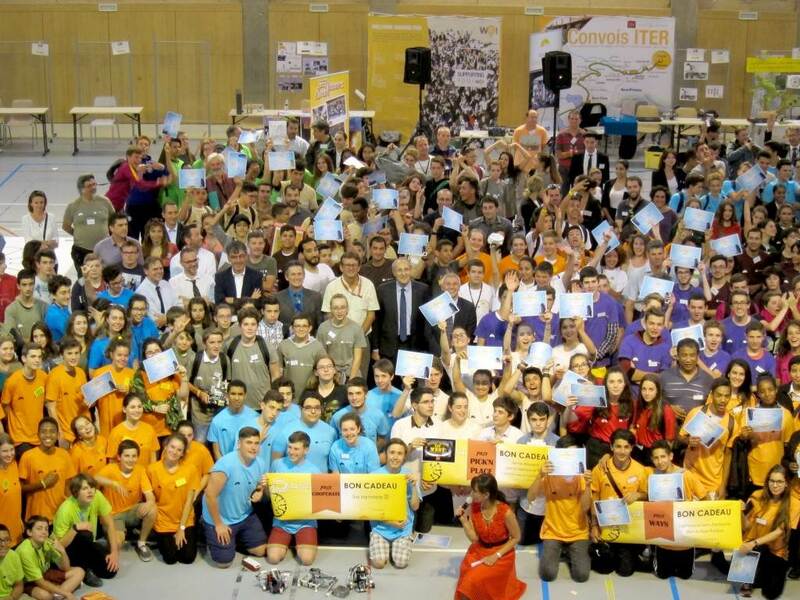 The third edition of the ITER Robot contest is held on 6 May 2014 at the Lycée des Iscles in Manosque. After nine months spent imagining, designing and programming their Lego robots to complete a series of ITER-like robotics tasks, ten teams—five from junior high school and five from high school—had the opportunity to put them to the test in front of a jury made up of professionals. The initiative is organized annually by Agence Iter France and the Remote Handling Section of the ITER Organization. Friday 21 March was Korea Day. 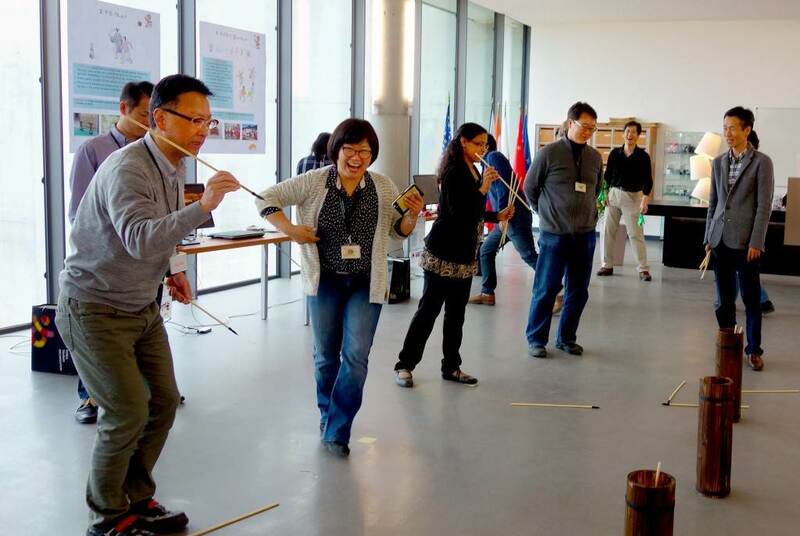 The ITER community was treated to Korean culinary specialities, traditional song, and the opportunity to try out the games tuho, yutnori or jegichagi. 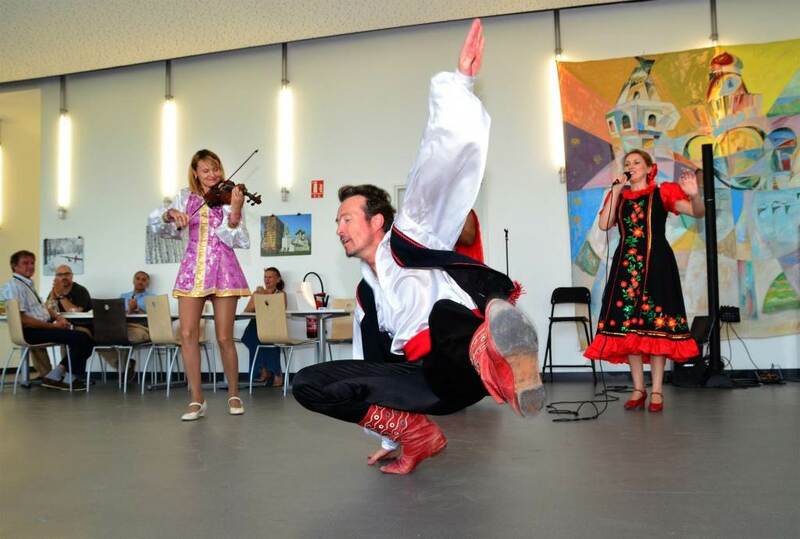 Regular Member day events are the opportunity to celebrate the diversity of ITER cultures. 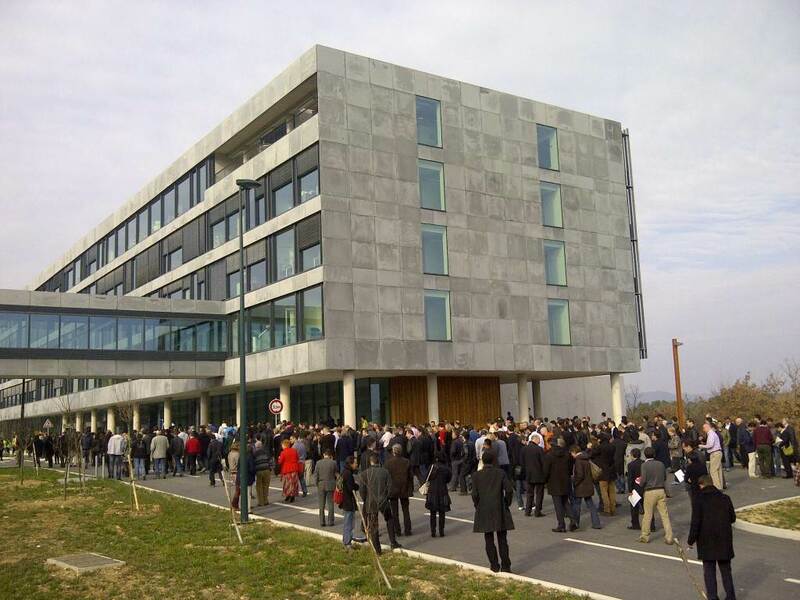 ITER staff and contractors return to their offices after an early morning fire drill on 11 March. For this regular safety exercise, only a few minutes are necessary to empty the building. "It's good!" "It's like the Club Med!" Wednesday 26 February was Family Lunch Day at the ITER cafeteria and by all accounts the selection and quality of the food at the ITER Organization was a step above that which can be found at school cafeterias ... As part of a new initiative, ITER staff can now register (by small groups) to invite their spouses and children to Headquarters for a tour around and lunch. The next Family Lunch Day will take place in approximately four weeks. 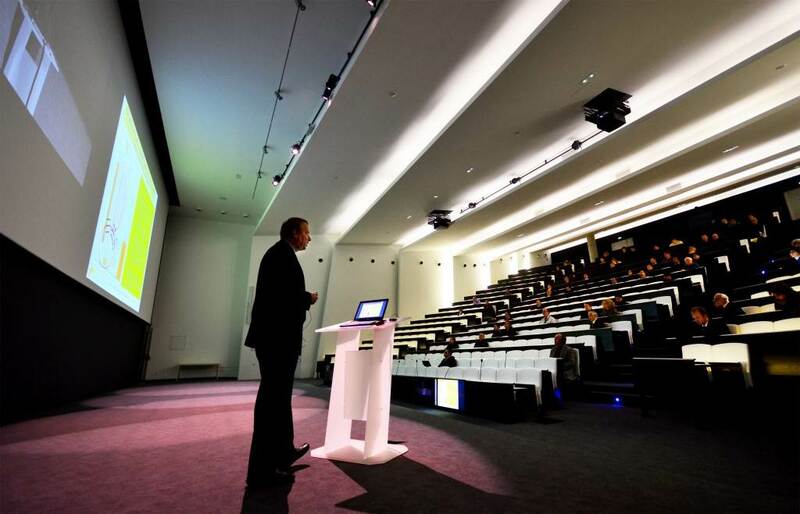 In the days following every high-level governance meeting, ITER management convenes staff to the auditorium to present the outcome. 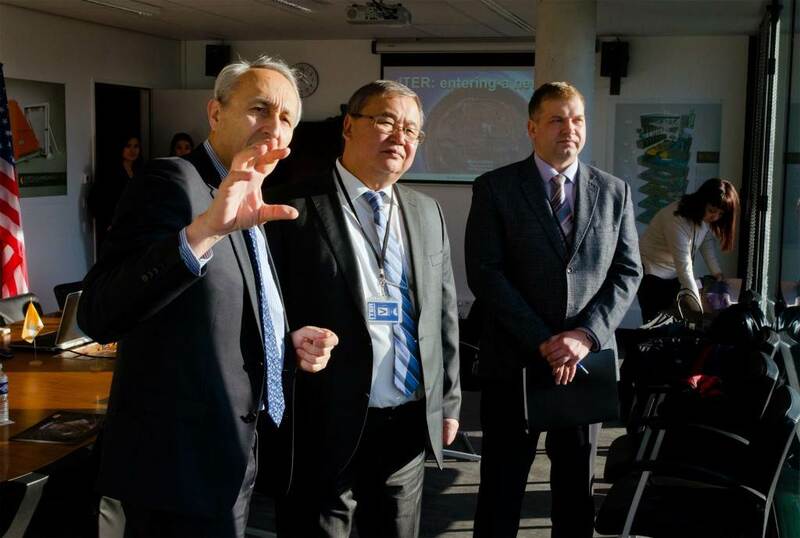 On Tuesday 18 February 2014, an all-staff meeting takes place to discuss the result of the extraordinary session of the ITER Council held on 13 February. For Christmas Lunch, on Friday 13 December, the ITER band takes to the cafeteria to share holiday favourites and communicative good cheer. See you again in the New Year! Friday 22 November 2013 was US Member Day. 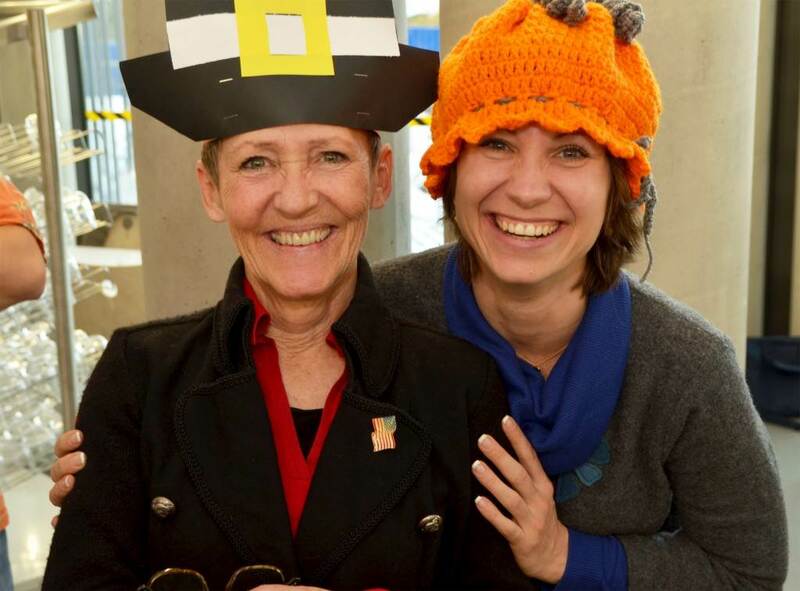 As part of the celebration the ITER canteen served a traditional Thanksgiving meal—complete with turkey and gravy, mashed potatoes and pumpkin pie. 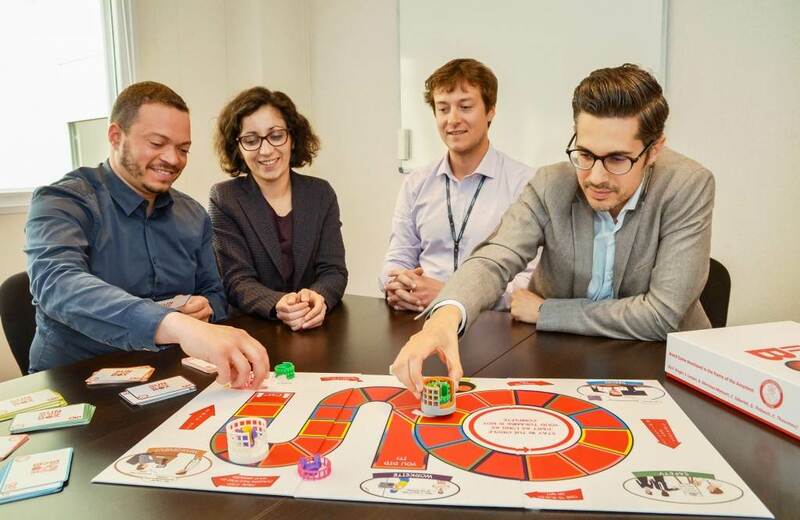 A program launched at the ITER Organization in 2012 encourages staff members to seek efficiencies by simplifying procedures and practices in their everyday work. On 7 October 2013, the Improve (IT)² program celebrated a first round of good tips and advice, recognizing nine staff members who had made important improvement contributions. 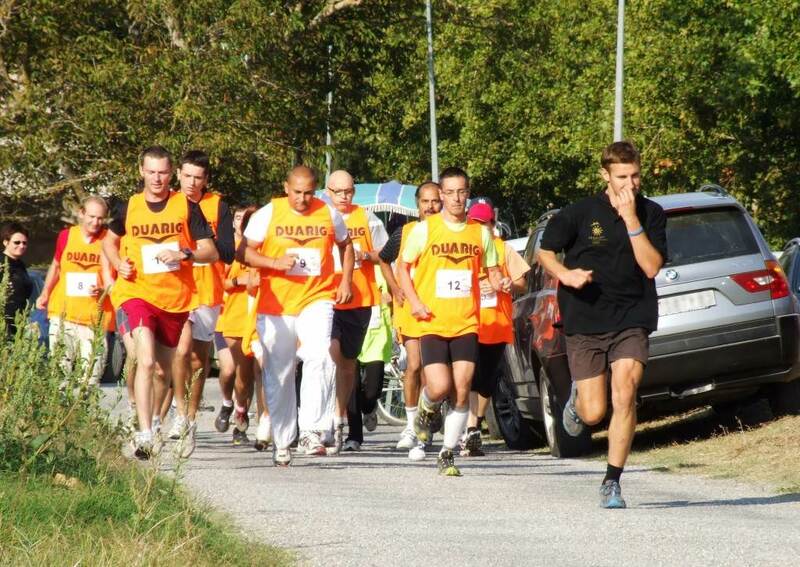 The third edition of the ITER Games takes place on Saturday 7 September 2013 in Vinon-sur-Verdon. 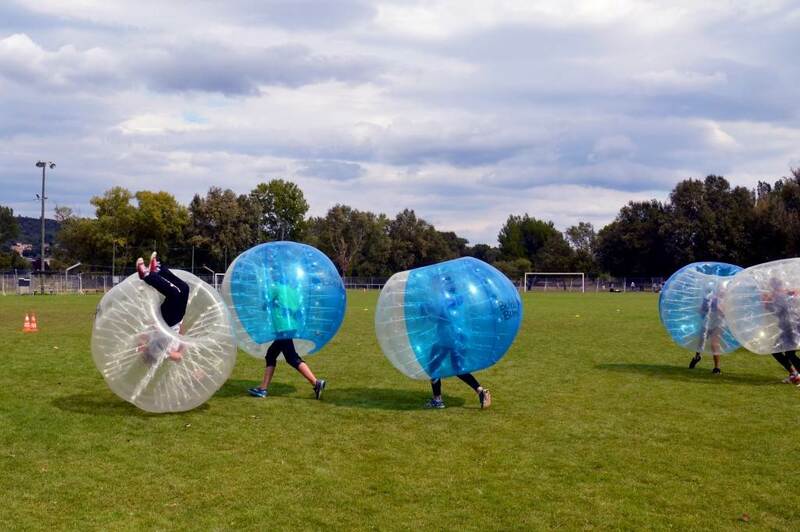 Participants from local sporting clubs, the ITER Organization and contractors competed in football, tennis, table tennis, pétanque, running, and white-water rafting. Cafeteria is occupied, lunch outside! On 6 September 2013, the ministerial-level Council meeting fully occupies all of the available space in the new Headquarters building—Council Room, lobby and cafeteria. 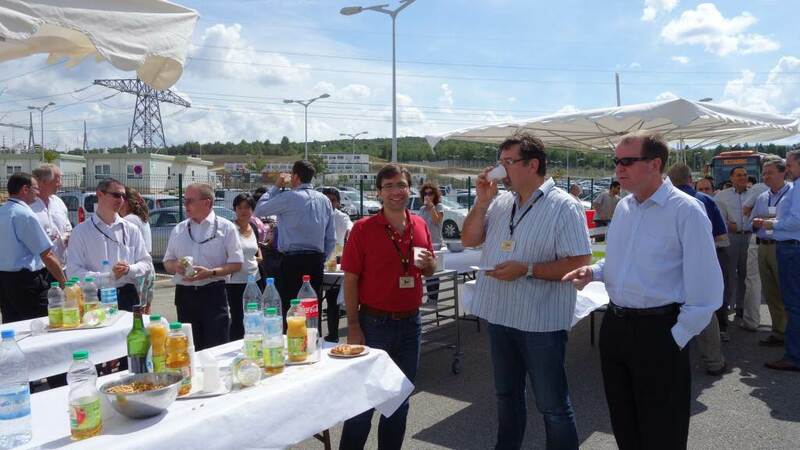 ITER staff and contractors are invited to a buffet lunch outdoors. 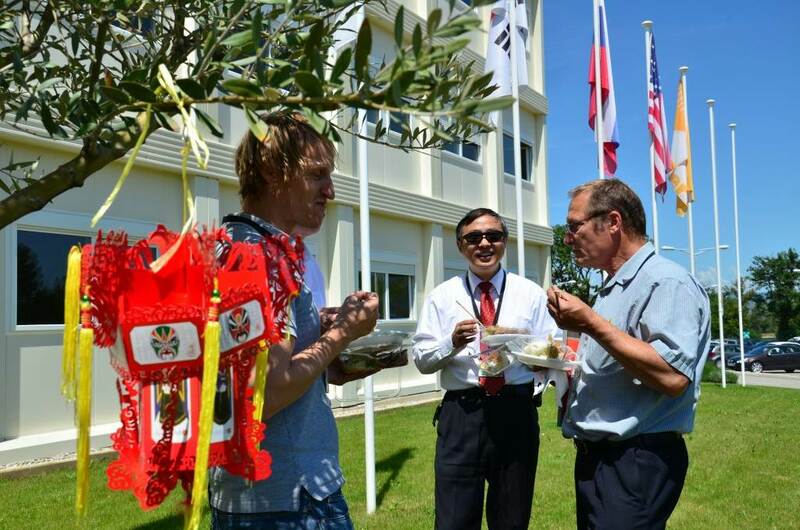 On 19 July 2013, ITER celebrates Russia, with live entertainment, a special canteen menu, and general good cheer. 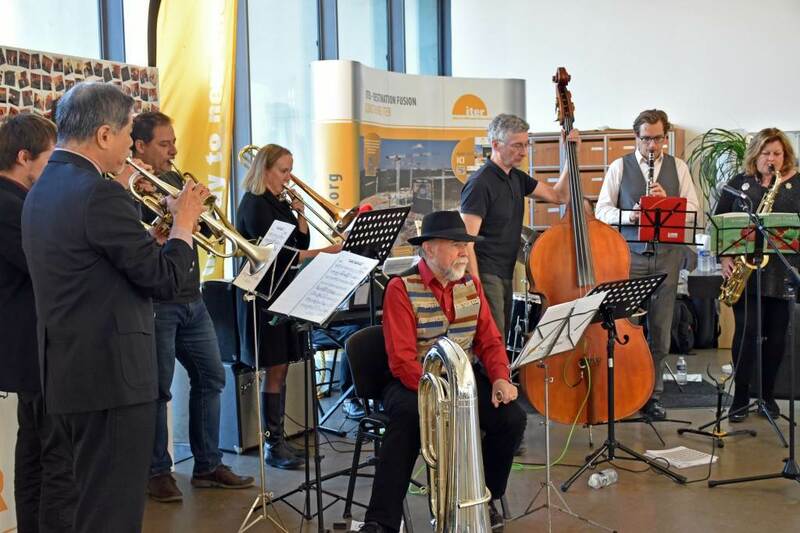 Ten members of the ITER band liven things up at lunch on the longest day of the year—also celebrated across France and Europe as the Fête de la Musique. 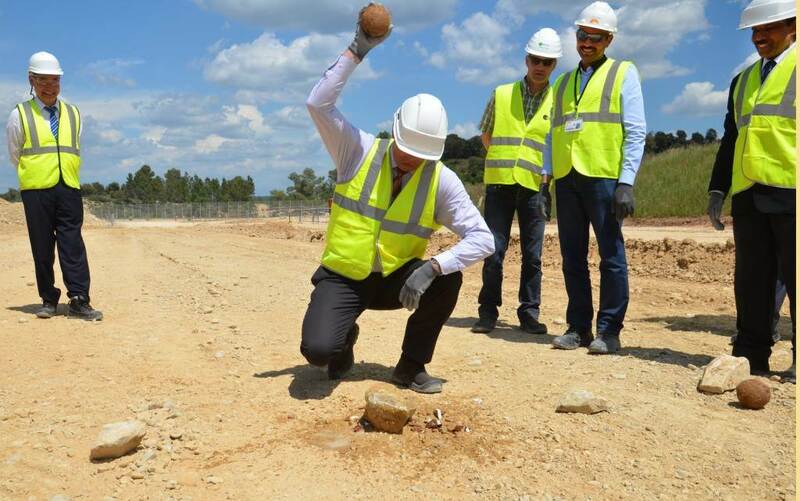 During a groundbreaking ceremony held on 6 June for the Cryostat Workshop, coconuts were symbolically broken—and their meat shared among the guests—before a large excavator symbolically scratched the earth. 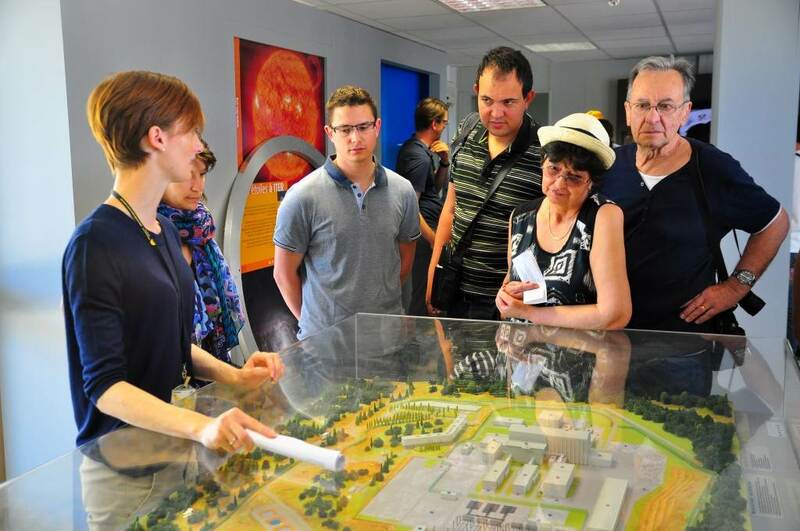 For two hours at the beginning of ITER's Open Doors Day on 1 June 2013 the tours were reserved for staff and families. 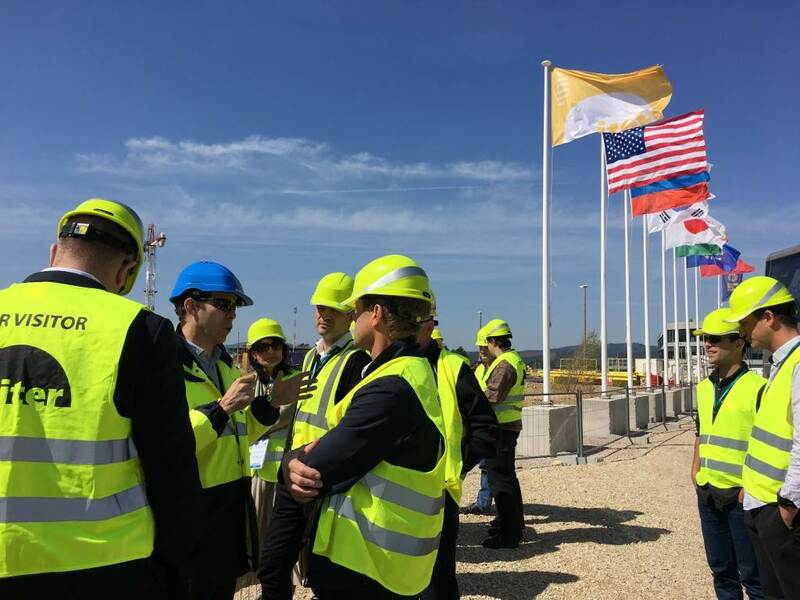 Guests were invited this year to stop at the Visitors' Centre overlooking the platform and to visit the Poloidal Field Coils Winding Facility. 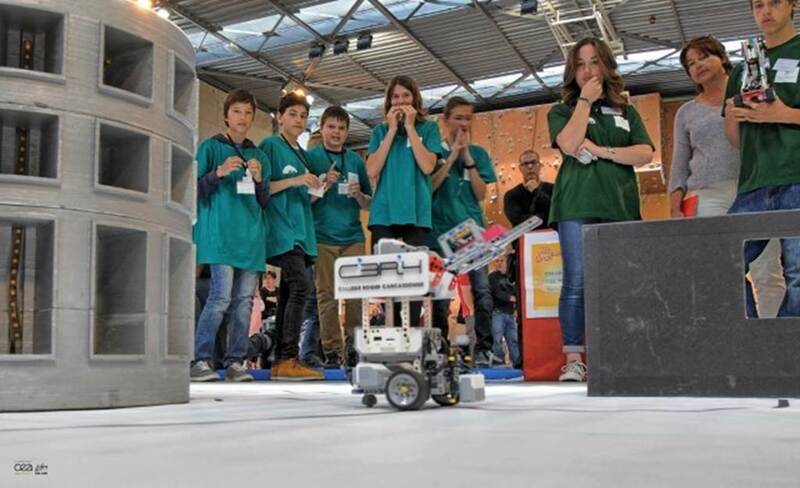 Twelve schools participate in the second edition of the ITER Robot contest held on 16 May at the Lycée des Iscles in Manosque. Five junior high and seven high school teams passed an initial selection process to enter their Lego robots, programmed to complete a series of ITER-like robotics tasks, in the contest. The initiative is organized annually by Agence Iter France and the Remote Handling Section of the ITER Organization. The colours of Europe are raised on Monday, 13 May at the Provence-Alpes-Côte d'Azur in Manosque to celebrate the political construction of the European Union. 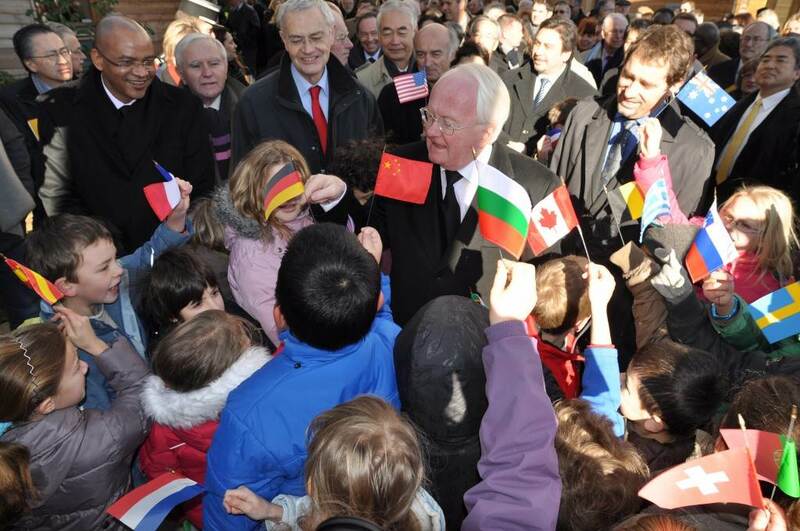 The international school (50% ITER children, instruction in 10 languages) welcomes a pan-European and international student body—27 nationalities are represented. 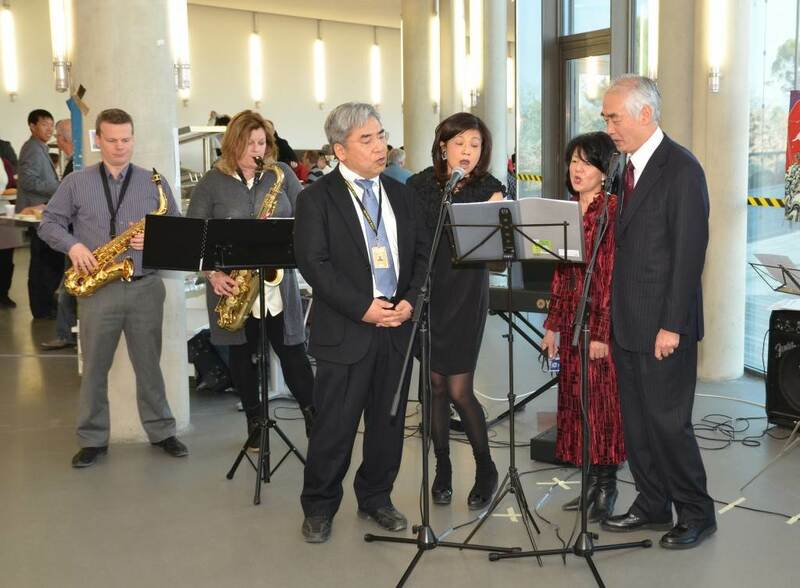 For Japan Day, held on 4 March 2013, the ITER band learns a new repertoire. Nearly 900 people turn out for this celebration of Japanese culture and cuisine. 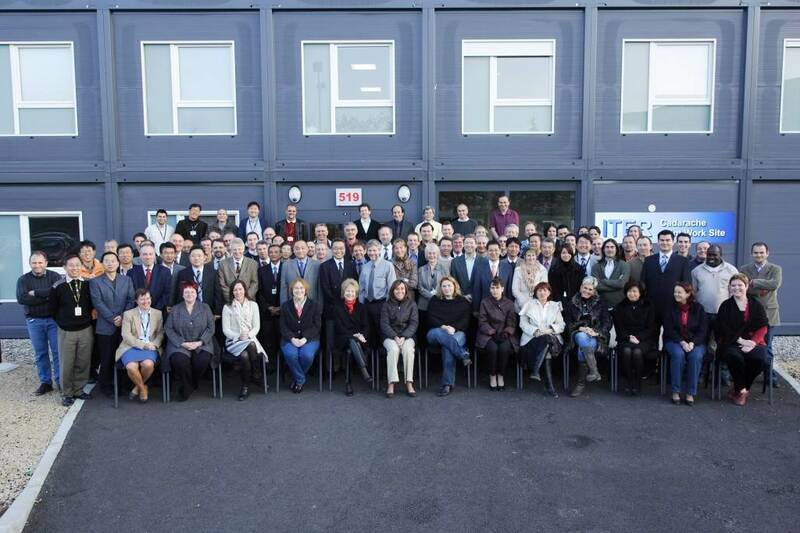 Seventy-five meetings and countless open and candid discussions and exchanges ... the second Unique ITER Team week brought the heads of the seven ITER Domestic Agencies on site for five days, creating the conditions for effective decision-making with ITER Organization management. An all-staff meeting was convened by the ITER Director-General on 20 February to inform staff about the creation of a new organizational unit to focus on the construction schedule. The Directorate for Project Control & Assembly will be formed from two Divisions that were formerly part of Central Integration & Engineering. 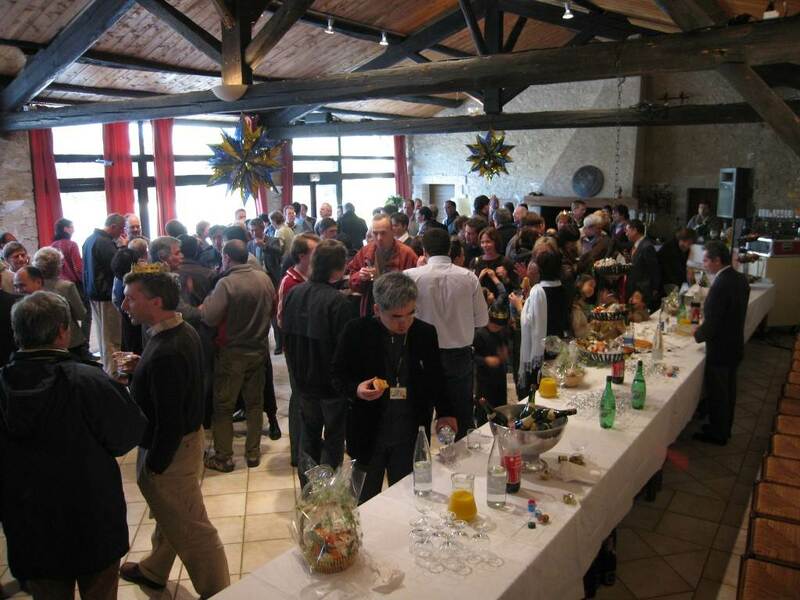 On 29 January 2013, the ITER Organization launches a new, bi-monthly conference series targeted to technical and scientific staff. 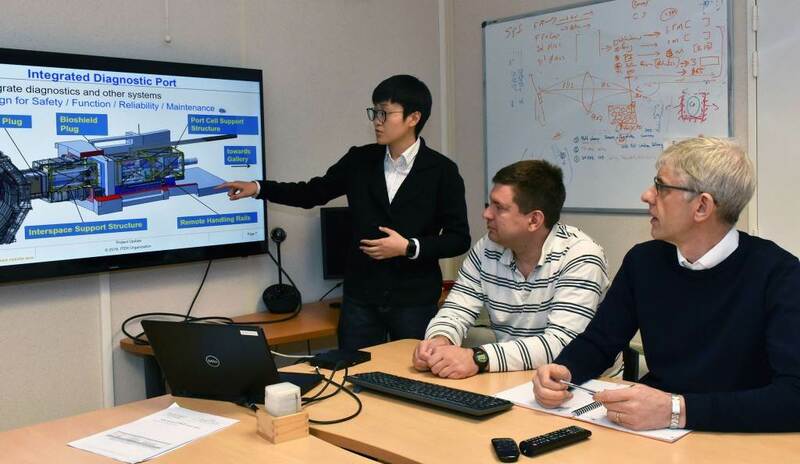 The series aims to offer high-quality, highly technical lectures related to ITER science and engineering and to "intensify the Organization's academic atmosphere." 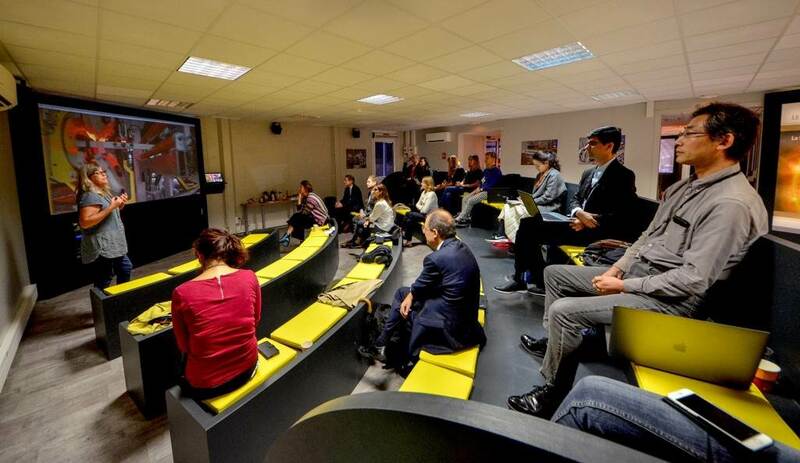 On Inauguration Day (17 January 2013), ITER staff watch a live transmission of the unveiling ceremonies from the amphitheatre, before 200 invited guests and 50 journalists join them to listen to the speeches of Commissioner Oettinger (English) and French Minister Fioraso (English and French). A sandwich lunch for 600 was served to staff in the lobby following the event. 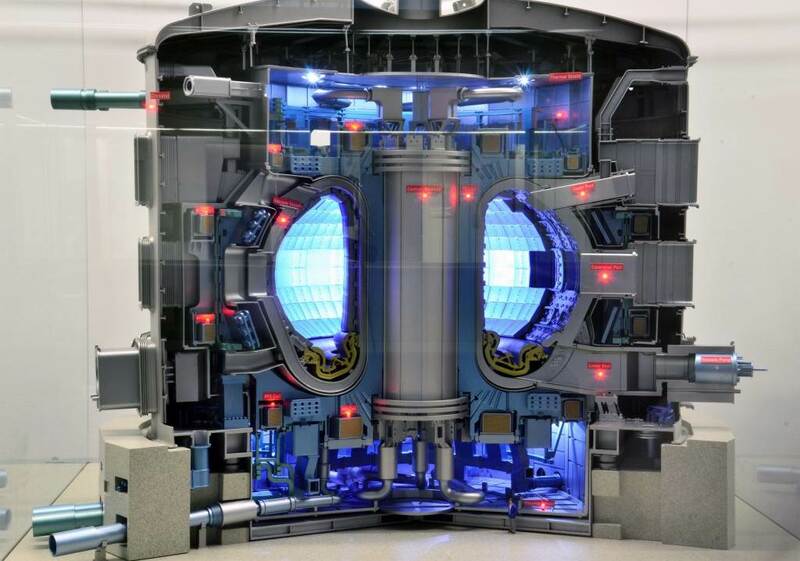 A 1:50-scale model of the ITER Tokamak, complete with lights indicating the major sub-systems, takes its place outside of the Council Chamber in January 2013, instantly becoming a point of interest for all visitors to ITER Headquarters. 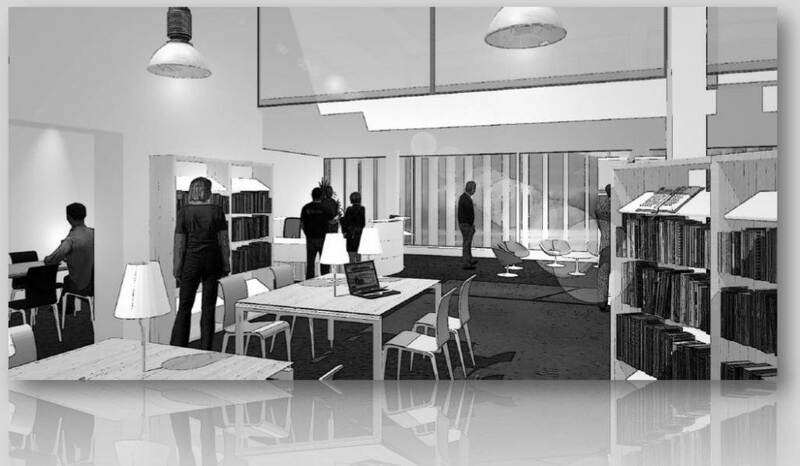 The 200-square-metre ITER library opens in January 2013. Scaled to meet the project's needs over the 20-year exploitation of the ITER device, the ITER library has space for 10,000 volumes and vast archival storage facilities. 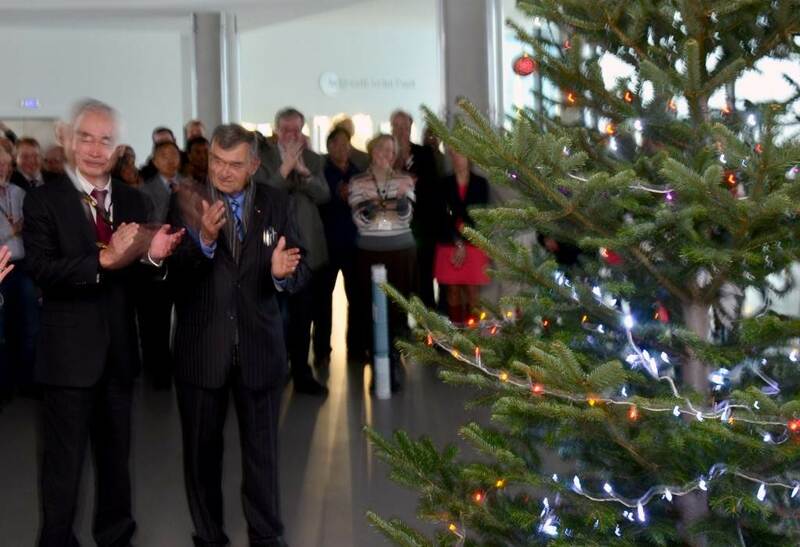 The ITER Organization receives a Christmas tree from the municipality of Saint-Paul-lez-Durance, which hosts the ITER installation. Roger Pizot, the mayor of Saint-Paul, joins the ITER Director-General for a tree lighting ceremony on 7 December 2012. During the buffet lunch served for ITER Member Day festivities on 23 November 2012, Deputy Director-General for Safety, Quality & Security Carlos Alejaldre spoke to staff about the significance of the official decree signed on 10 November authorizing the ITER Organization to create the Installation nucléaire de base (INB) ITER. "This decree is a binding contract between the French state and the ITER Organization as nuclear operator. It is a contract that we cannot break." 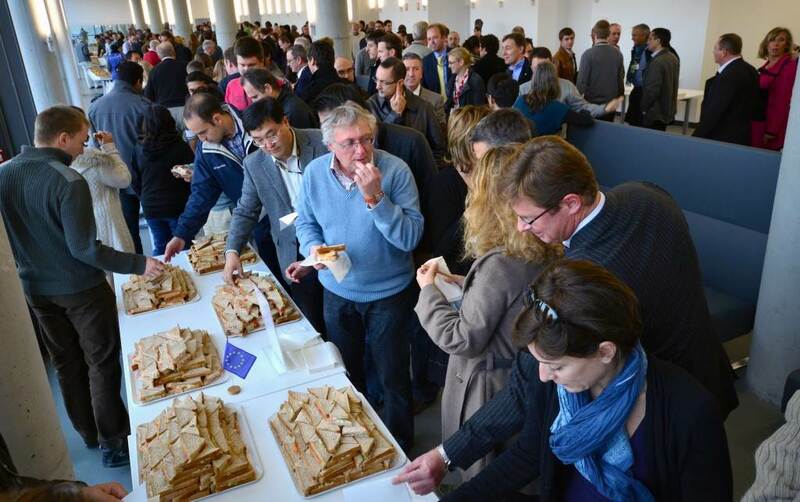 On 23 November 2012 the ITER community gathers for the third Member Day of the year, celebrating the culture and traditions of Europe, in the airy setting of ITER's brand-new cafeteria with a capacity for 1,000. The rotogate between the ITER and CEA sites rotated for the last time on Friday 16 November 2012. For nearly four years, this passageway allowed ITER staff to circulate between offices on both sides of the fence. But with the completion of the permanent ITER Headquarters all ITER staff and contractors have offices on the ITER site, and the rotogate is closed. 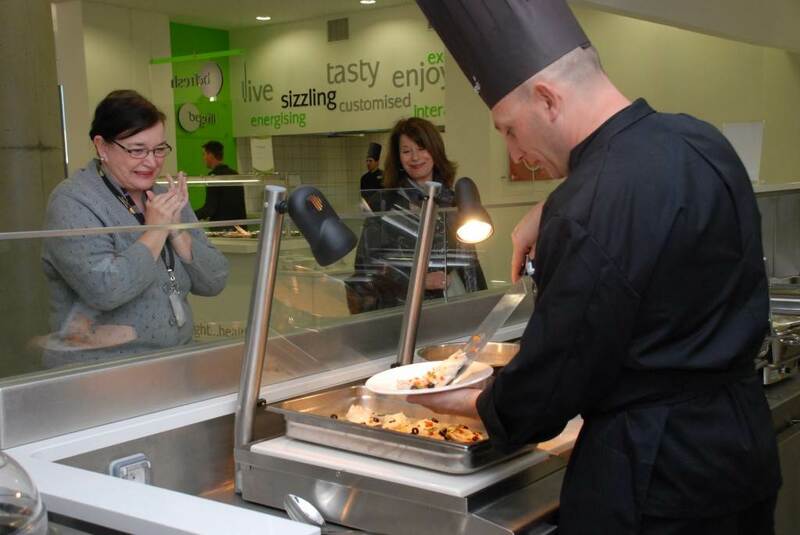 One of the perks of the new Headquarters building is the cafeteria, where Asian, vegetarian, Western, pizza, salad and grill counters please the taste buds of staff from each ITER Member state. 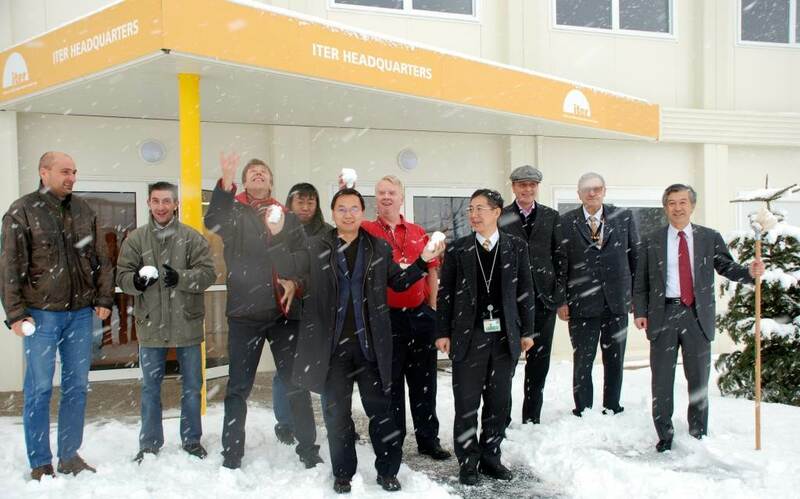 ITER staff take possession of their new Headquarters building in October 2012. In a small ceremony, Director-General Osamu Motojima and his wife are greeted at the building's entrance on 11 October. For its second annual Open Doors Day on 6 October 2012, the ITER Organization invited 1,300 people into the Tokamak Pit—a unique occasion before the next-level basemat hides the seismic bearings from view. 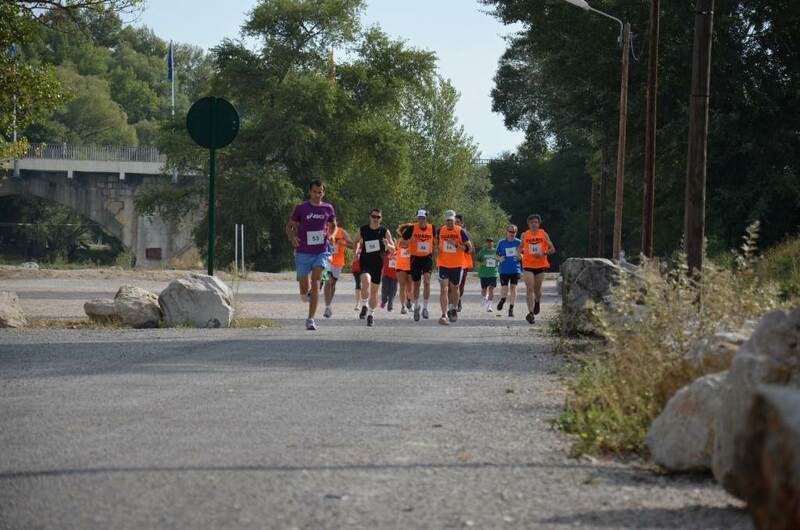 The second edition of the ITER Games takes place on Saturday 15 September in Vinon-sur-Verdon. 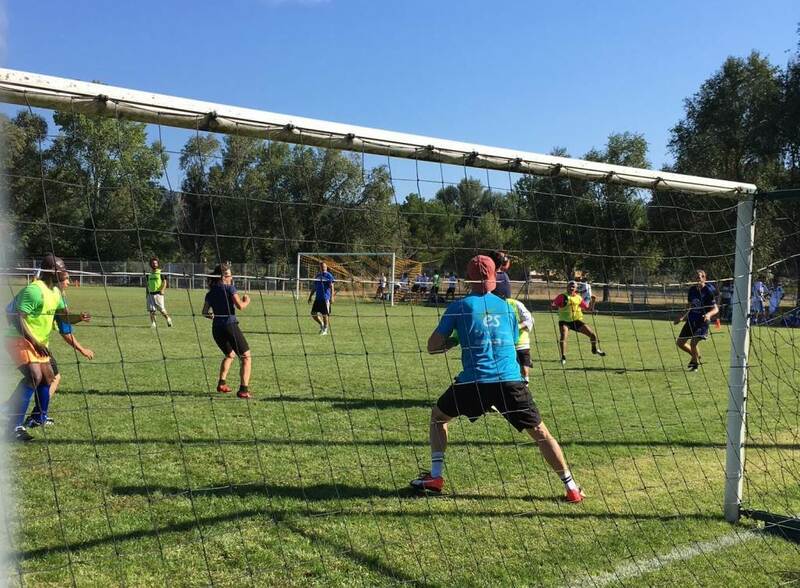 Participants from local sporting clubs, the ITER Organization and contractors competed in football, tennis, pétanque, running, and white-water rafting before enjoying a buffet lunch. On 25 July the entire ITER Organization celebrates "Namaste India Day!" the second ITER Member Day featuring Indian culture, music and traditional food. 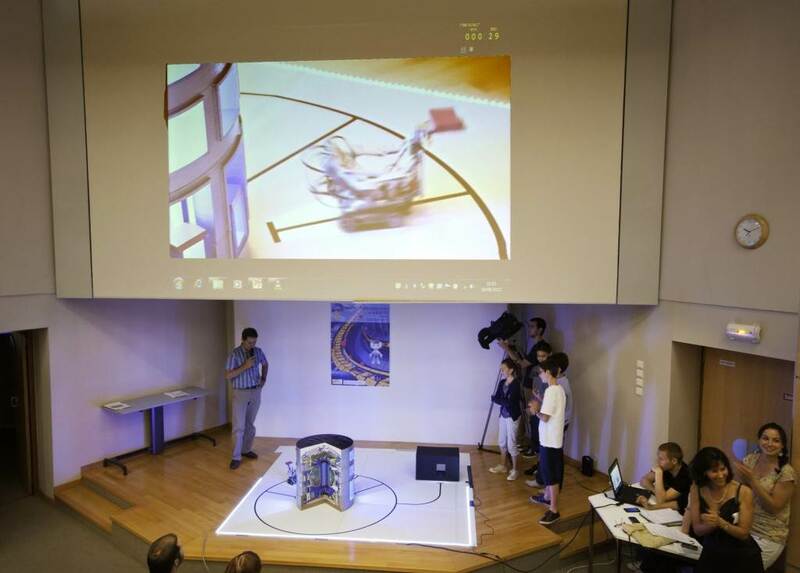 Agence Iter France and the ITER Organization jointly organize the First Student Robot Contest on 19 June 2012. Two local junior high schools participated: the Provence-Alpes-Côte d'Azur International School in Manosque and the Collège Pierre-Gardot in Sainte-Tulle. The 13-14 year olds were given a difficult task: assemble and program their Lego robots to perform an ITER-like remote handling mission. 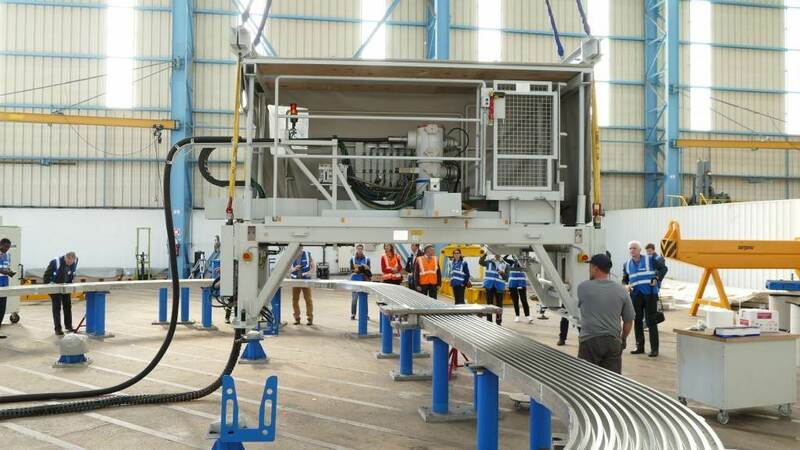 The little machines needed to remove selected blanket modules from the inner wall of the mockup vacuum vessel, and transport them to the nearby Hot Cell Facility. ITER management assembles over 400 employees and contractors in January 2012 for an all-staff meeting to begin the year. "In 2012 our overarching aim will be to improve the project's performance and efficiency," says Deputy Director-General Rich Hawryluk. "ITER has grown up from the ground and now the organization and infrastructure to deliver the construction project is established. The organizational future lies in completing the construction of ITER in a manner that is safe, and which offers best value for money by incorporating measures and processes for operational excellence." 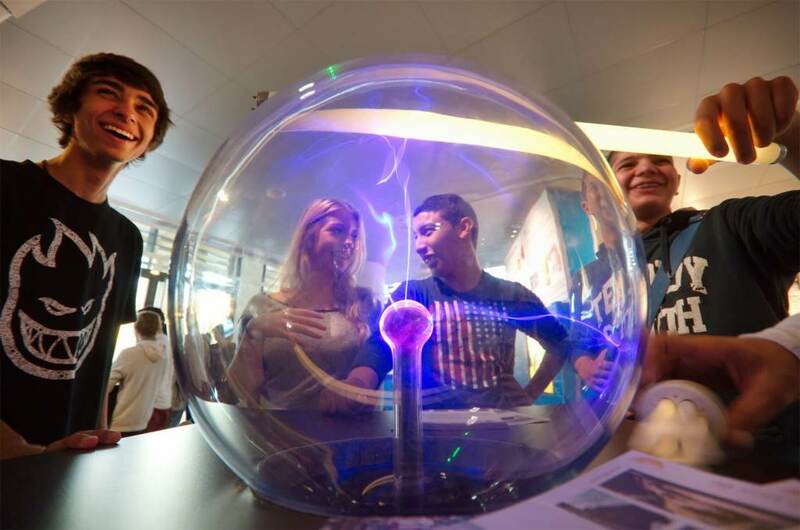 On Saturday 15 October 2011, ITER holds its first Open Doors event for the local public. 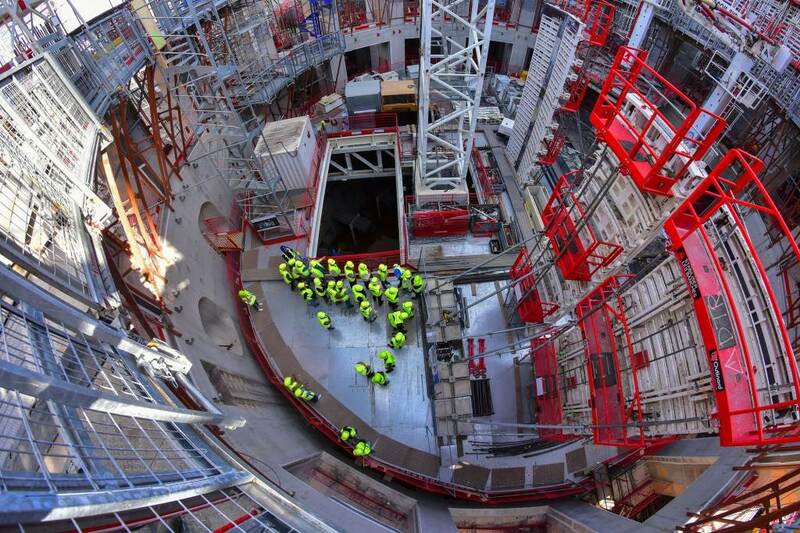 During the course of the day, close to 800 people are given a free one-hour, guided tour the ITER site. This event will be renewed for the local community in 2012. 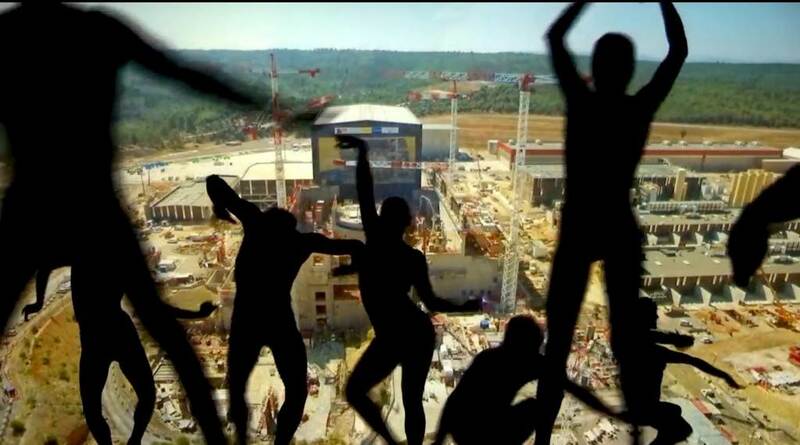 In all, nearly 13,000 people visited the ITER site in 2011. 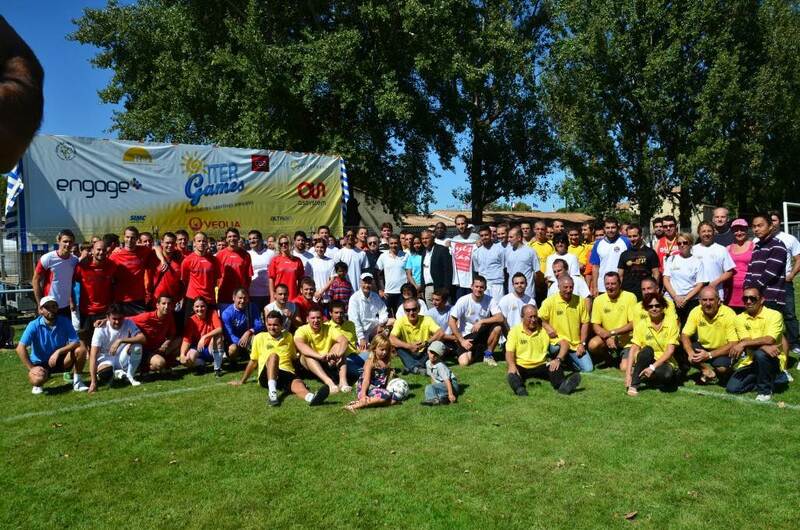 Close to 250 persons, a mix of people working on the ITER project and residents of Saint-Paul-lez-Durance or Vinon-sur-Verdon, participate in the first edition of the ITER Games, organized by the ITER Organization, the Vinon Durance Sports Club, and Agence Iter France. 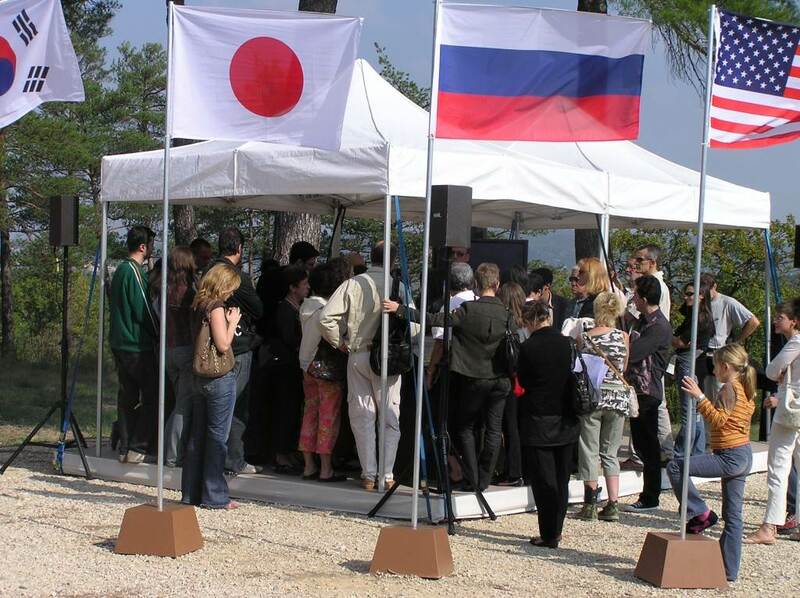 A commemoration of the decision that brought the ITER project to Cadarache, ITER Day is celebrated on 2 September 2011 by staff and contractors alike on the site of the first platform building: the Poloidal Field Coils Winding Facility. 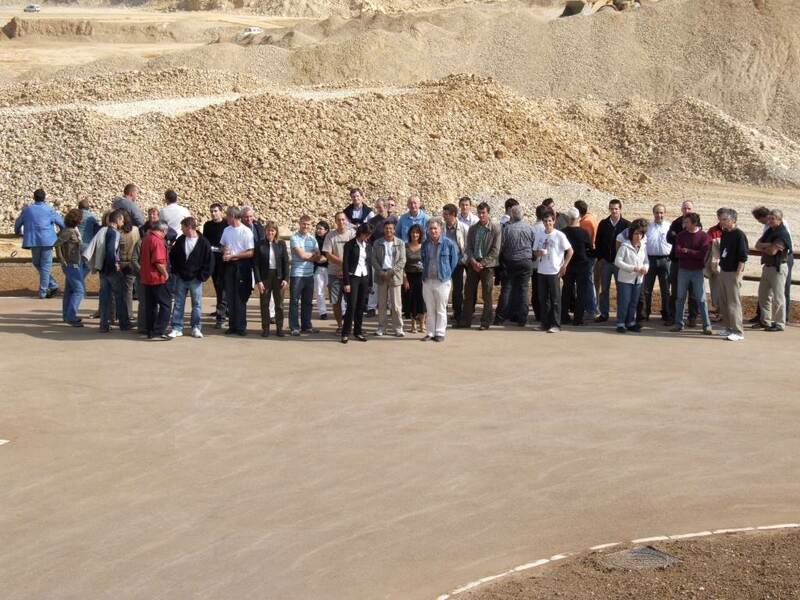 At 14:46 p.m. on 14 March 2011, three days after the Great East Japan Earthquake, ITER employees observe a minute of silence in honour of the victims of the tragedy and as a sign of solidarity for Japanese colleagues. 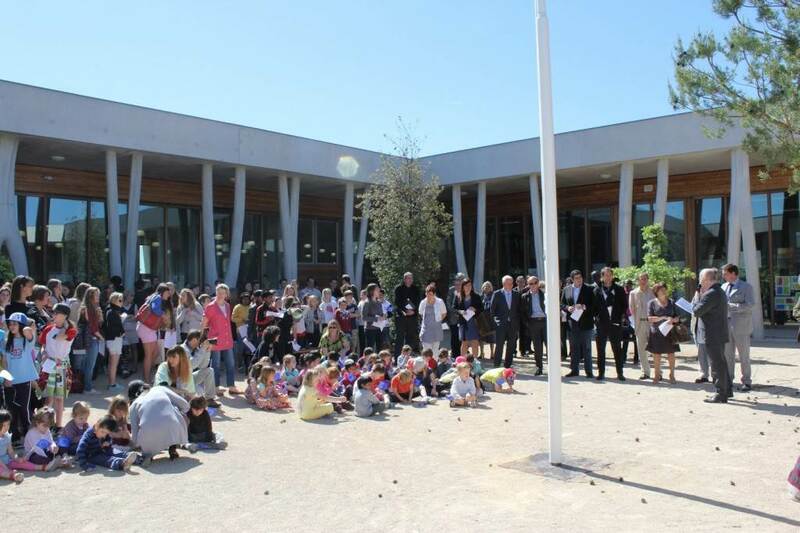 The International School of Provence-Alpes-Côte d'Azur (PACA), attended by "ITER children" and also local children attracted by the international curriculum, is inaugurated on 24 January 2011 in the presence of Michel Vauzelle, president of the PACA Region. 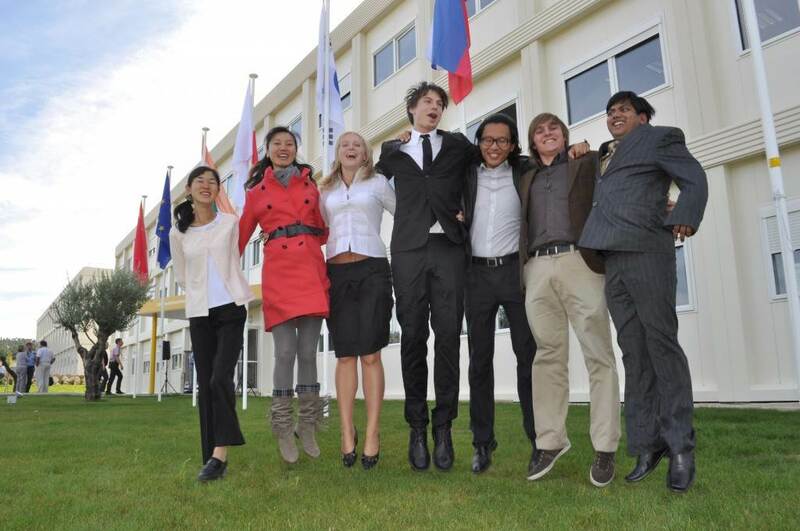 On 1 October 2010, the youngest employees from each of the seven ITER Members hoist their respective flags in front of the temporary ITER Headquarters building. 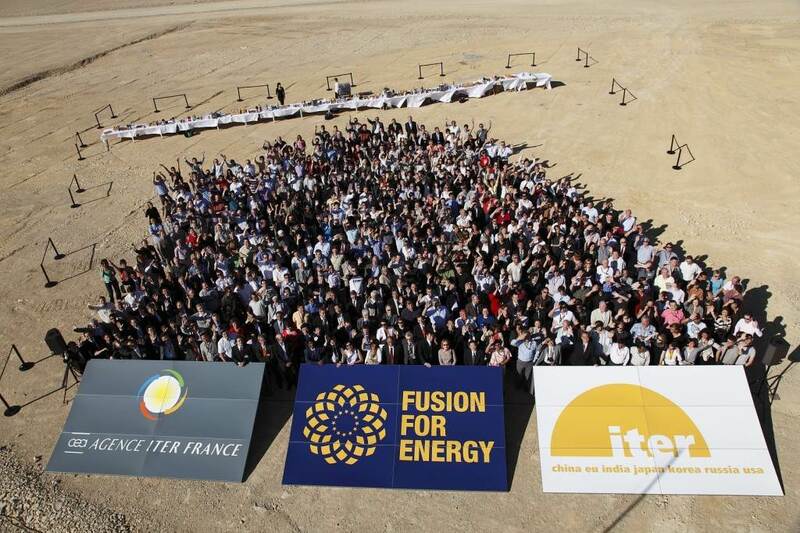 ITER Director-General Osamu Motojima raises the ITER flag: symbol of a group of nations working together today to make fusion an option for tomorrow's energy needs. 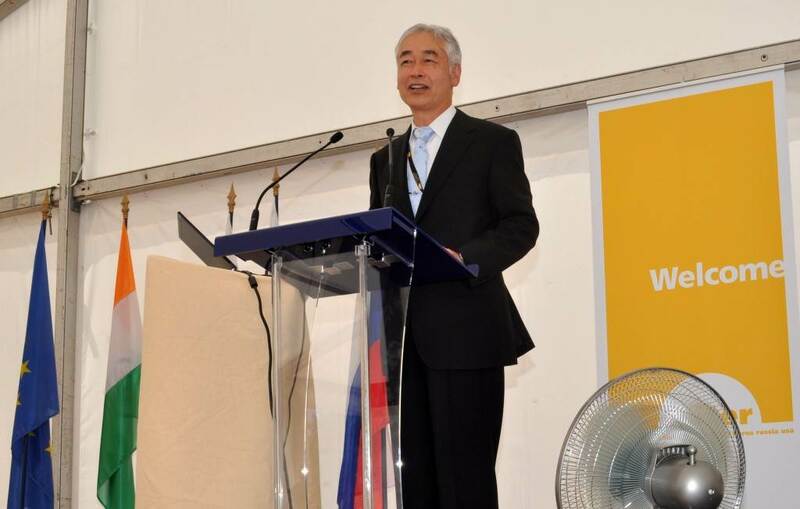 One day after his nomination the second Director-General of the ITER Organization, Prof. Osamu Motojima from Japan, addresses ITER staff and contractors. 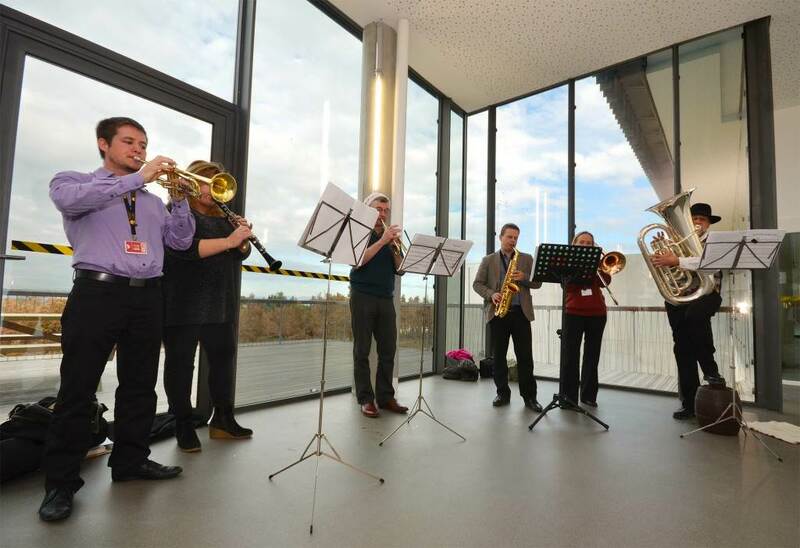 The ITER band is on hand to provide the ambiance for the first Happy Friday celebration of the year, where light lunch fare is offered to everyone working for the Project. 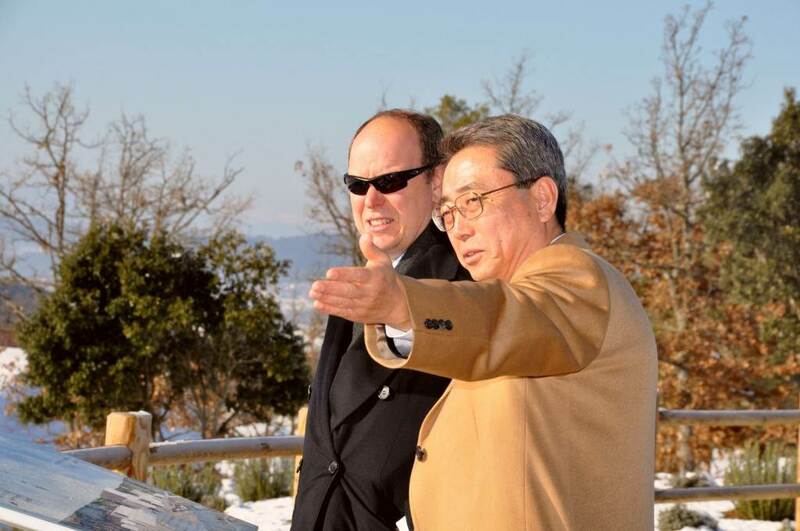 On 12 January 2010—two years after the ITER Organization and the Principality of Monaco sign a Partnership Arrangement establishing five Postdoctoral Fellowships and a biennial international conference on ITER-related research—His Serene Highness Prince Albert II of Monaco visits ITER. 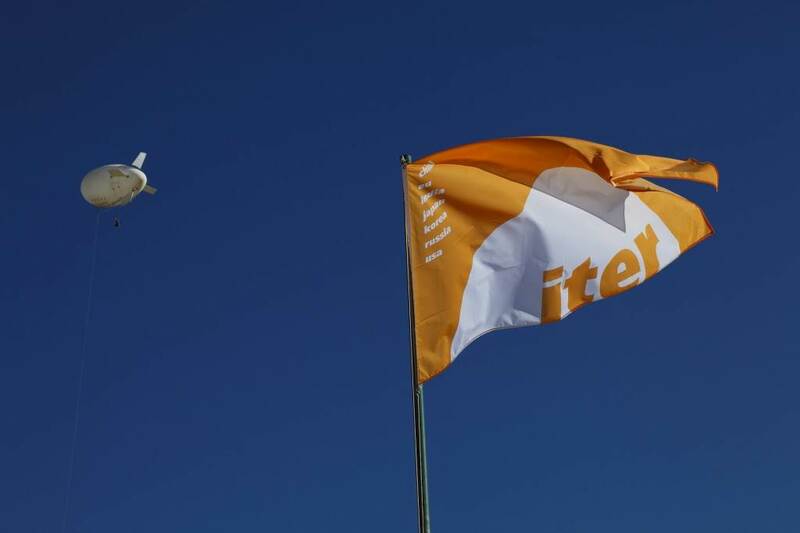 The ITER flag is raised on 26 June 2009 to celebrate the end of two years of site preparatory works. The 42-hectare ITER platform is now ready to receive the project infrastructure and facilities. ITER staff and contractors gather on the completed ITER platform in 26 June 2009. Close to 400 people work as staff for the ITER Organization. 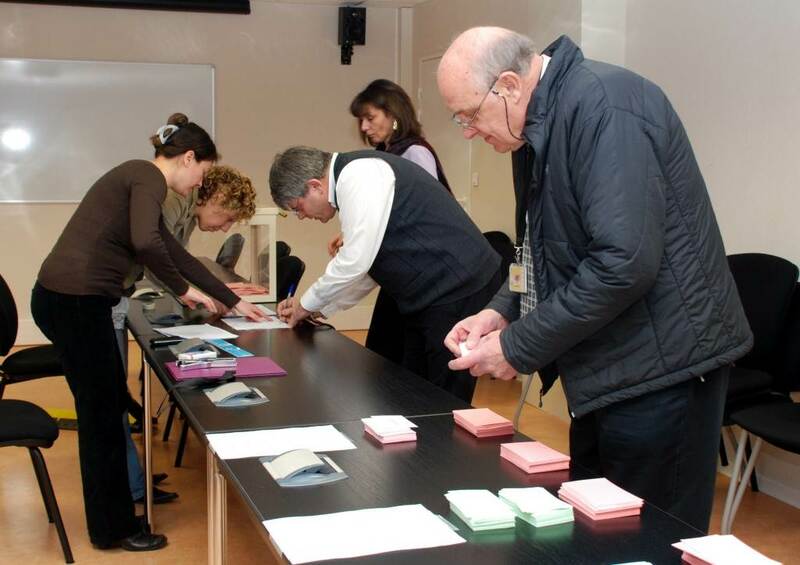 Sign of a maturing organization,the first ITER Staff Committee is elected in January 2009 . Works stops and the offices empty out in January 2009 during an exceptionally heavy snowstorm in Provence. 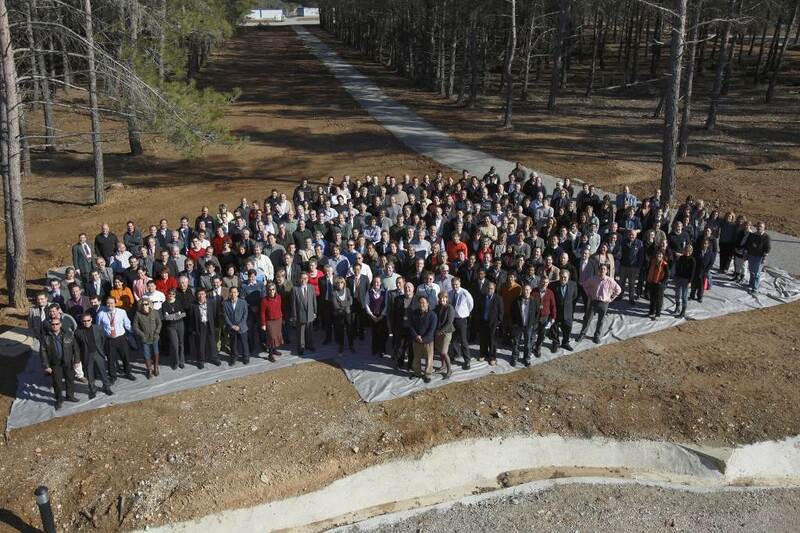 ITER staff gathers in front of temporary accomodations on the CEA site for a group photo in 2008. 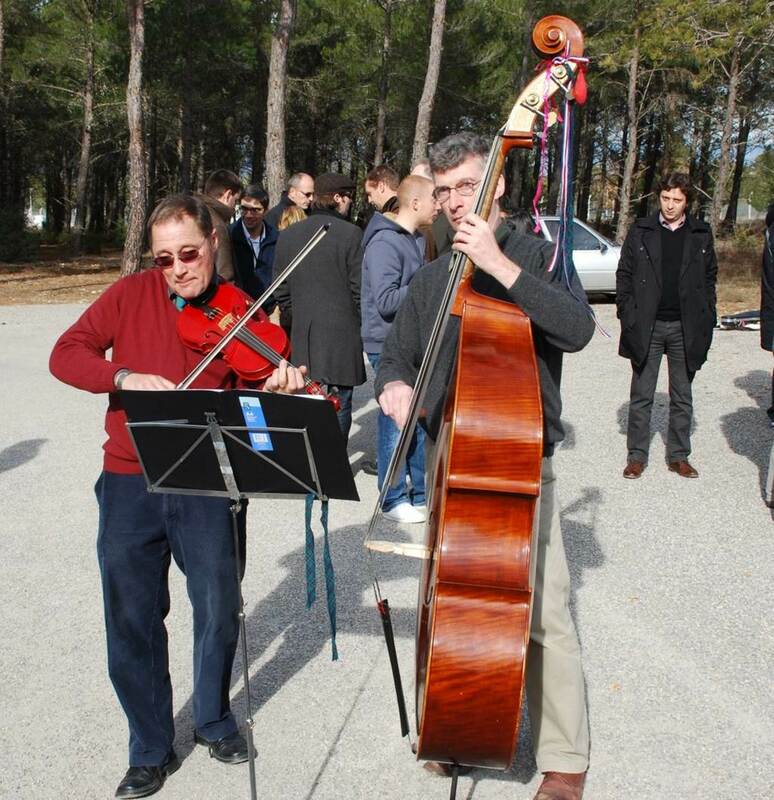 The ITER Organization celebrates the inauguration of its new Headquarters: a temporary structure on the ITER site that will be "home" to 300 ITER employees. Working at ITER doesn't necessarily mean having a front-row seat for construction. In September 2008, buses are organized to shuttle staff from the ITER Organization and the neighbouring Tore Supra Tokamak facility onto the worksite. For many, it was a first close-up view. No email. No internet. No website. No access to documents stored on the server. On 3 September 2008 the ITER server crashes leaving the Organization homebase in Saint-Paul-lez-Durance disconnected from the outside world—for 24 long hours. A power cut on the CEA Cadarache site due to lightening was the cause of the blackout. 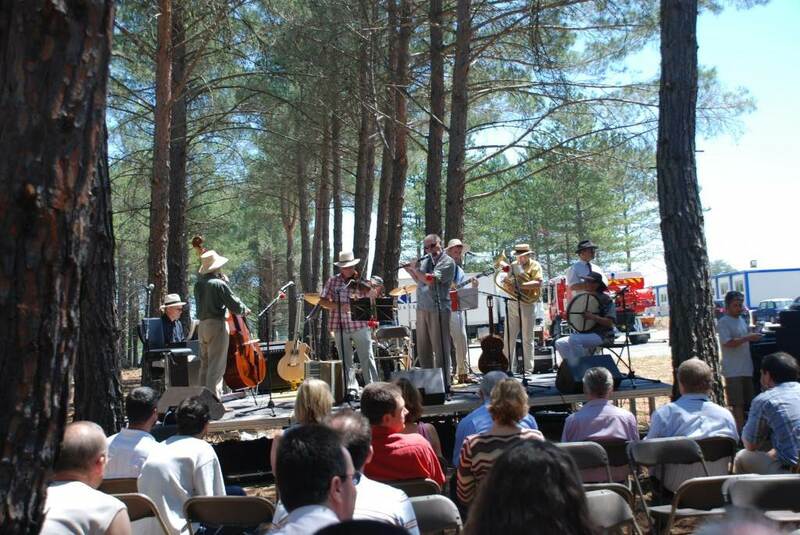 The 2008 ITER summer party is held in the woods of CEA Cadarache, complete with the ITER band, performing for the first time. 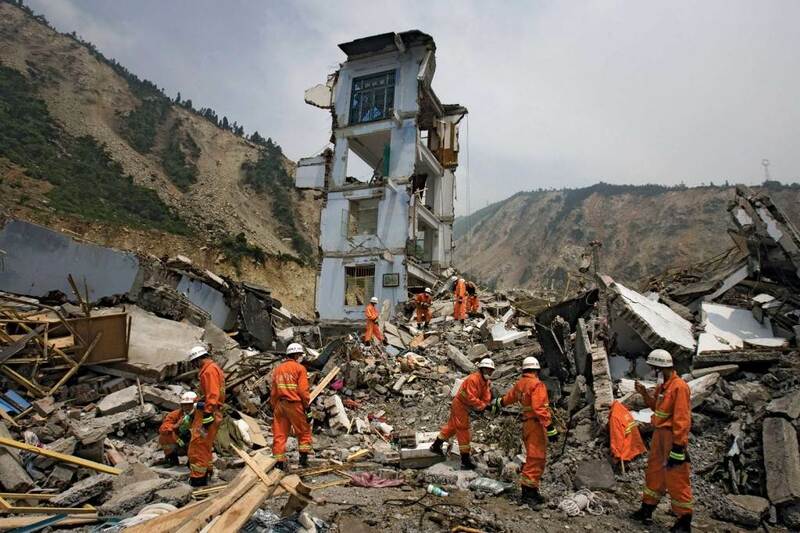 The earthquake that occurs in China's Sichuan Province at 0628 GMT on Monday 12 May 2008 measures 7.8 on the Richter scale. Chinese staff from ITER together with colleagues from Japan and Korea collect money for the earthquake victimes, which they hand over to the Chinese Consulate-General in Marseille. 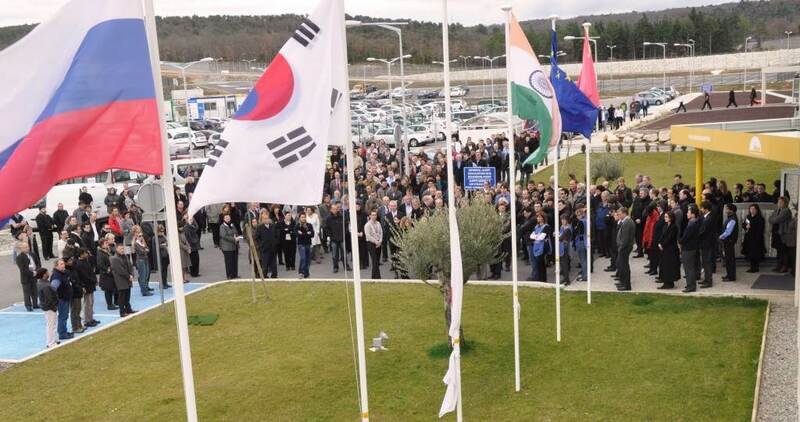 In February 2008, the ITER team is 219 people strong, representing 22 nations (up from seven people in February 2006). 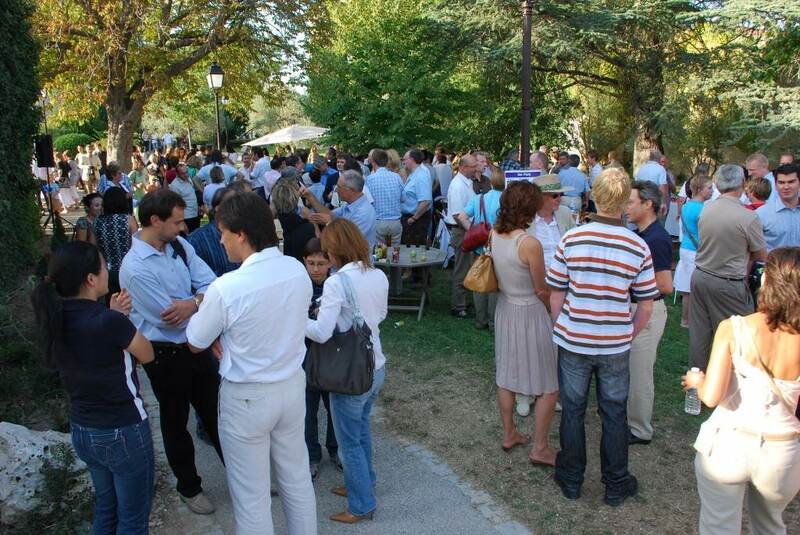 The ITER summer party takes place on 15 September 2007. 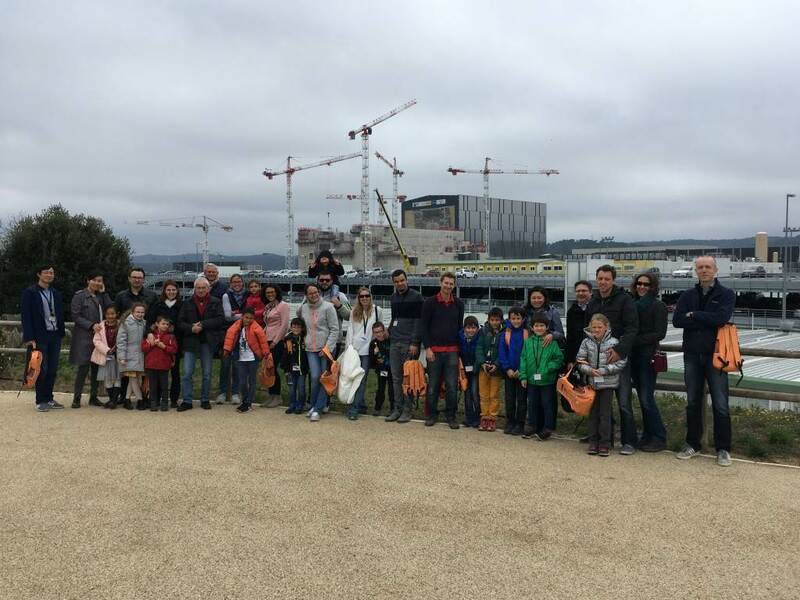 During an on-site tour, ITER staff and their families have a chance to see the extent of clearing works, underway since January 2007. 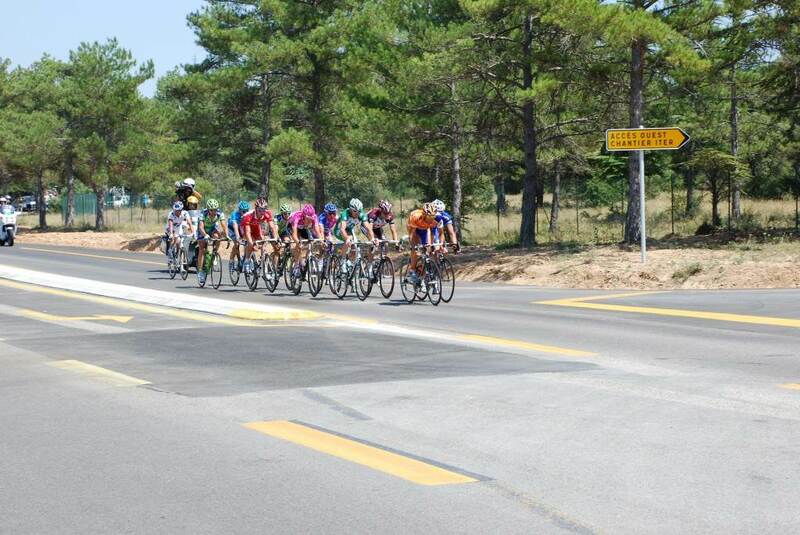 In July 2007, staff get to an opportunity to see the famed Tour de France up close, as the lead bikers pass along the departmental road that runs adjacent to the ITER site. 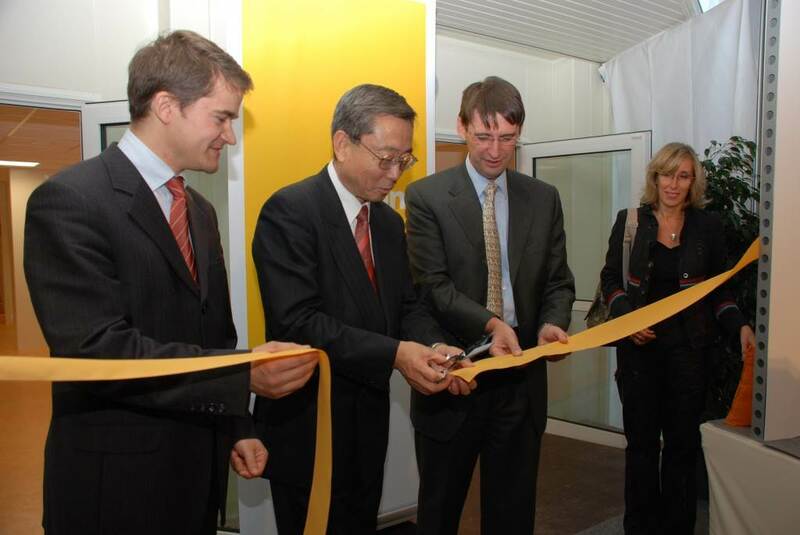 Celebrating the "Galette des Rois"
In January 2007, ITER Director-General Nominee Kaname Ikeda and Director of Agence Iter France François Gauché invite staff and families for the traditional New Year's wishes and King's cake. 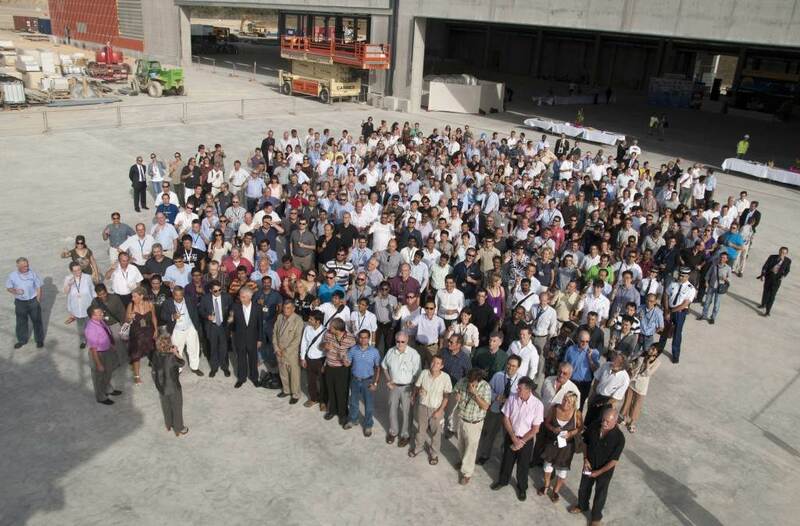 Not too many chairs are needed yet ... the ITER team at the end of 2006 numbers approximately 100 people. 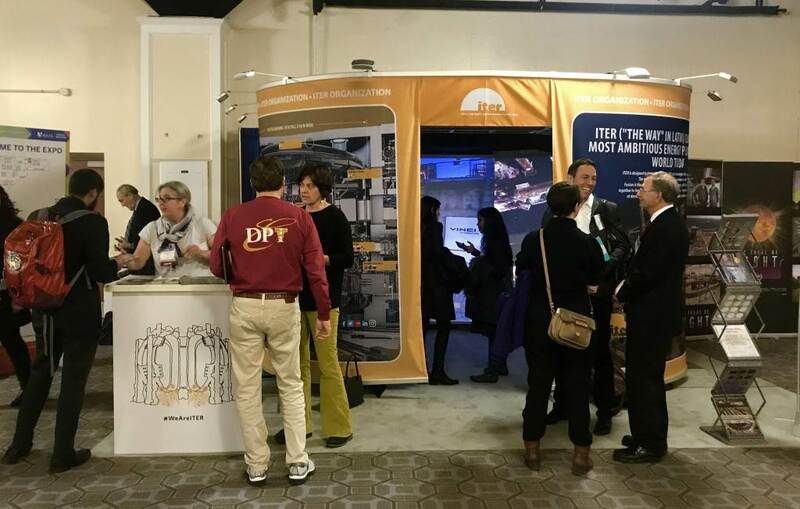 At the ITER stand, placed on the exact spot of the future Tokamak, 350 guests from CEA Cadarache learn more about the ITER Project. The visit was planned in the scope of CEA Cadarache's Open Doors Day.